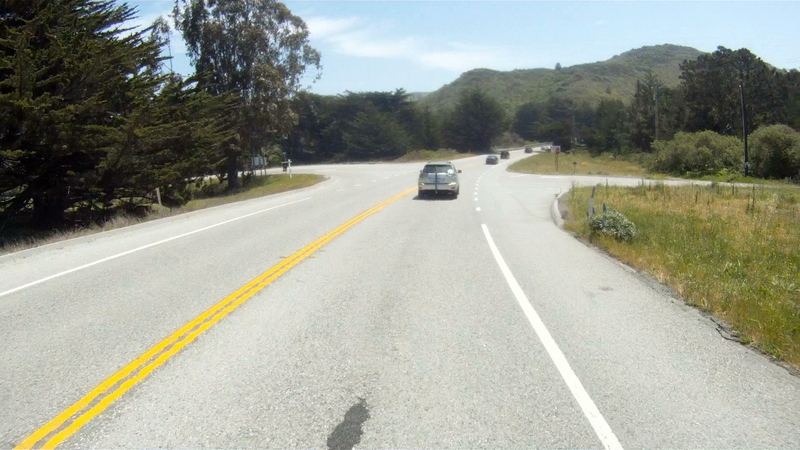 When you hear Half Moon Bay, most people think about surfing and the monster 50 foot waves at Mavericks. 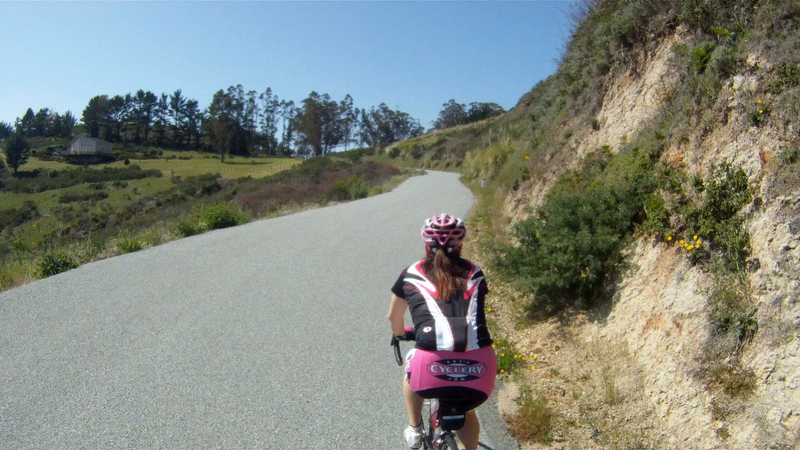 Half Moon Bay has more natural beauty than just the surf, it also has the Costal Range and amazing biking. 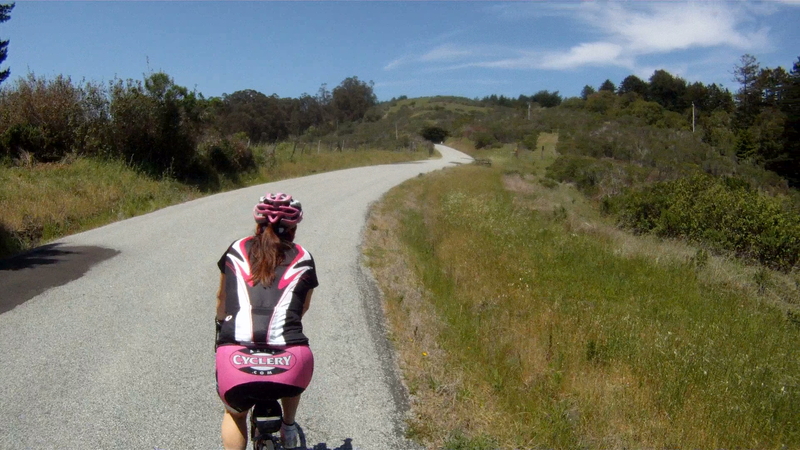 The Half Moon Bay Backroads features amazing views of the Pacific while cycling along CA-1 and winding backroads with very few cars as you wind your way back. 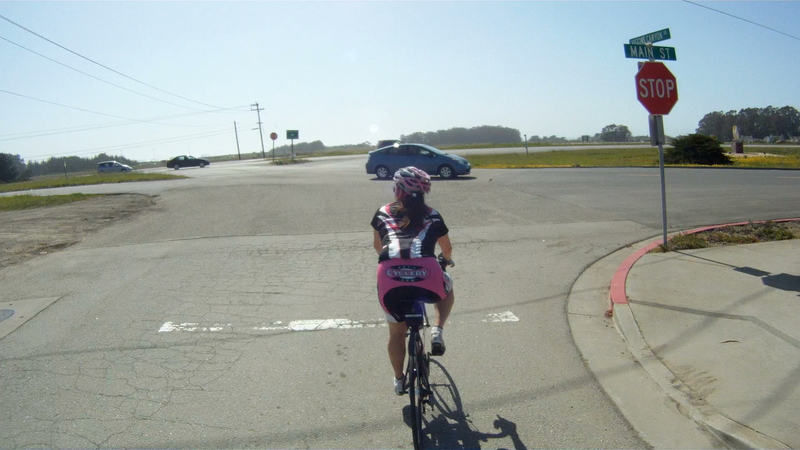 Difficulty: The ride features a ride along the Pacific Coast Highway south of Half Moon Bay and then makes two tough climbs on your way back to Half Moon Bay. 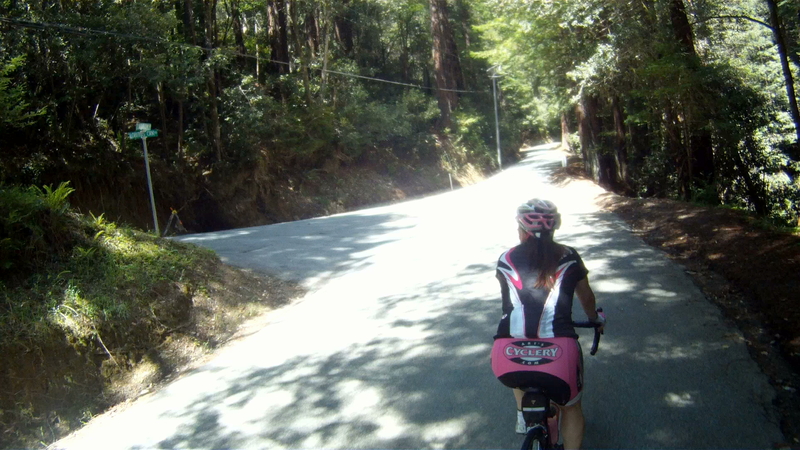 The reward for your climbing is a couple of great descents and amazing views of the Pacific. 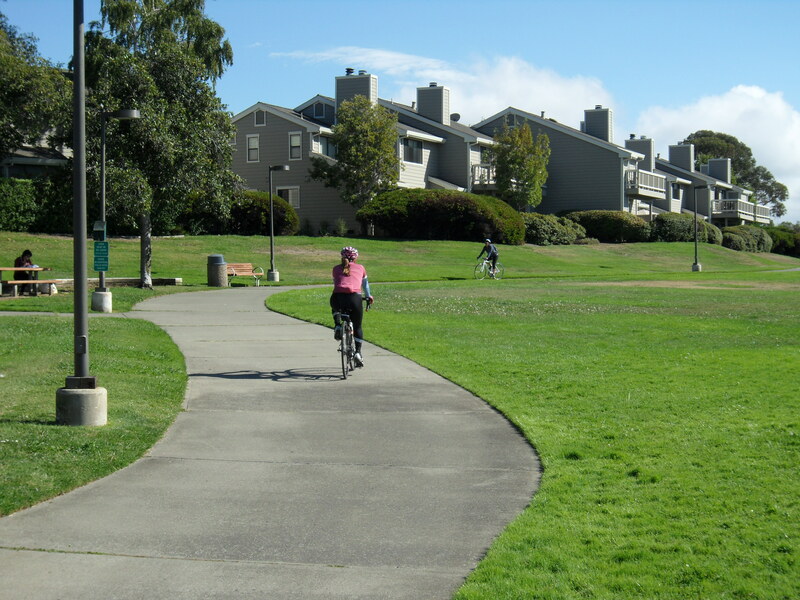 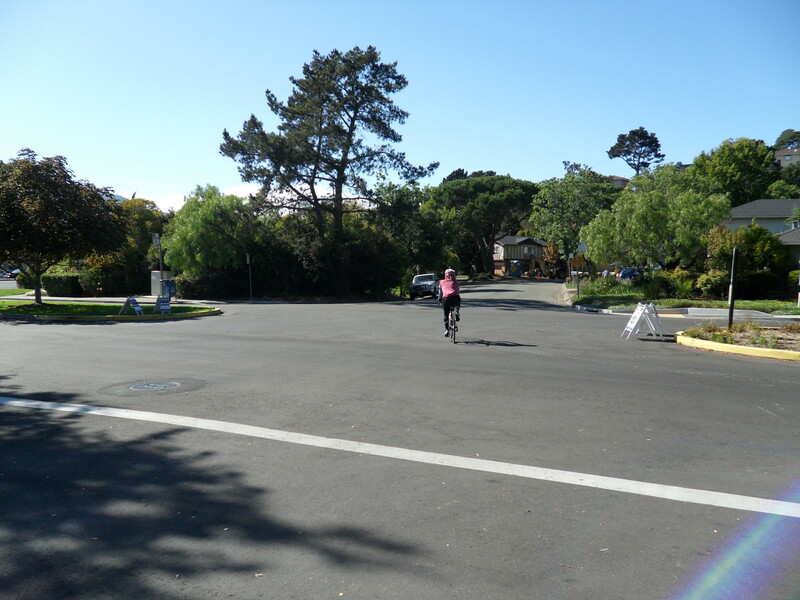 The route starts at the Mac Dutra Park in Half Moon Bay at the intersection of Main Street and Kelly Street. 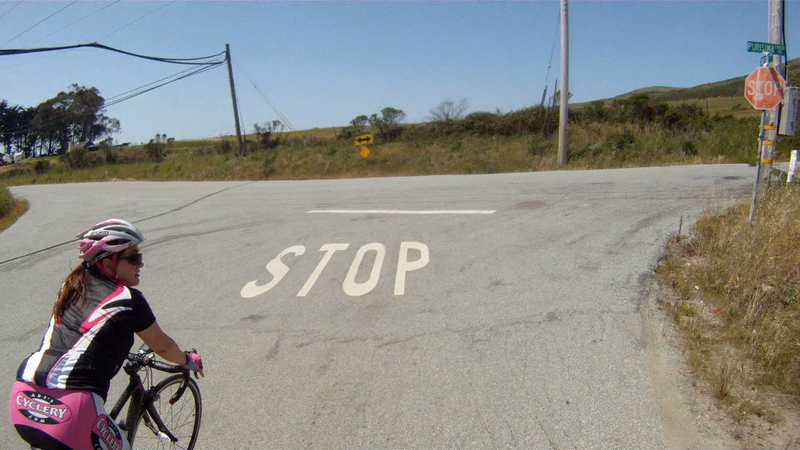 This is your next to last stop for a restroom, so go if you gotta. 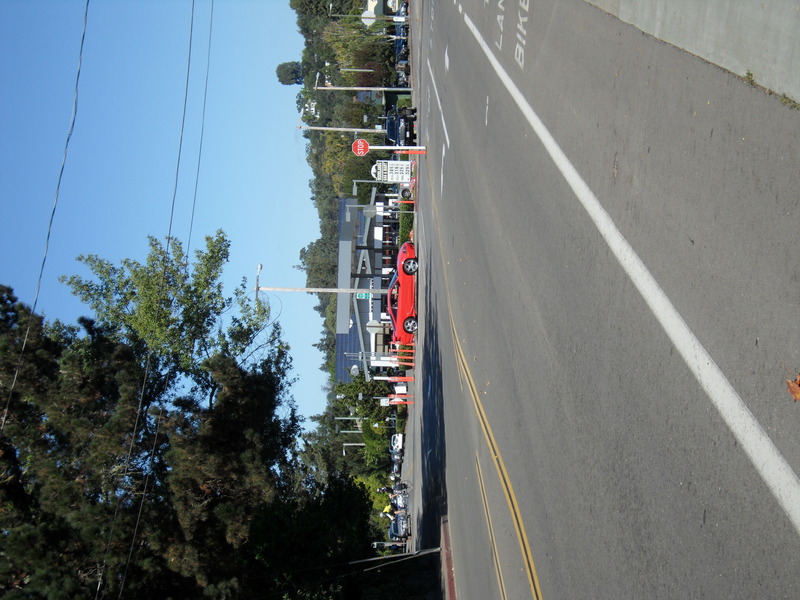 Follow Main Street south (away from CA-92) through Half Moon Bay until you reach the end of the road across from the Fire Station and make a right toward CA-1. 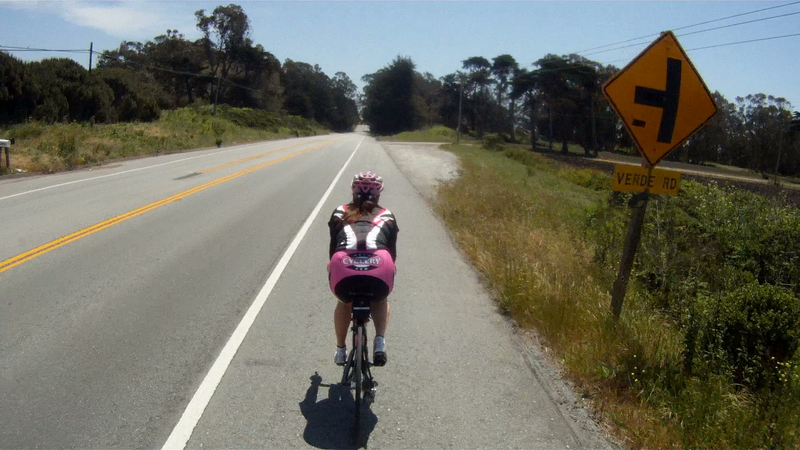 Cross CA-1 and make a left toward Santa Cruz. 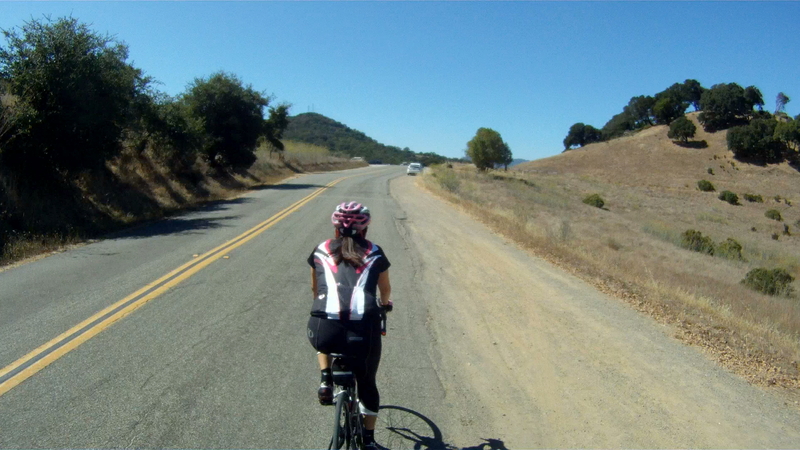 Continue to follow CA-1 south along the rolling hills. 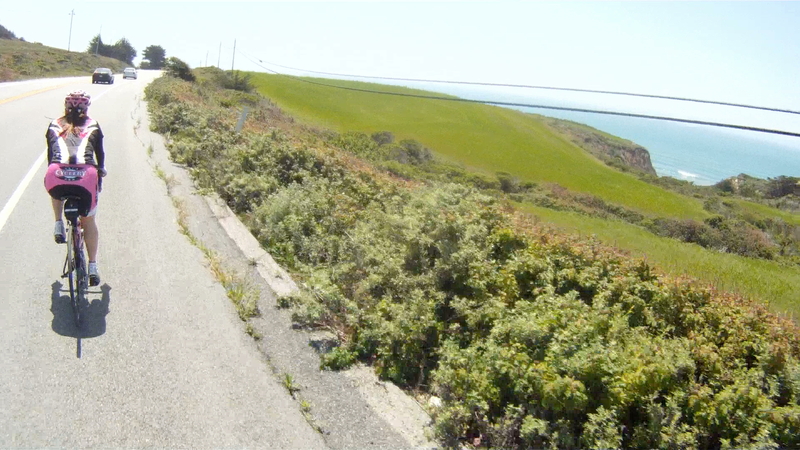 You will pass by Cameron’s Pub and Inn just south of Half Moon Bay. 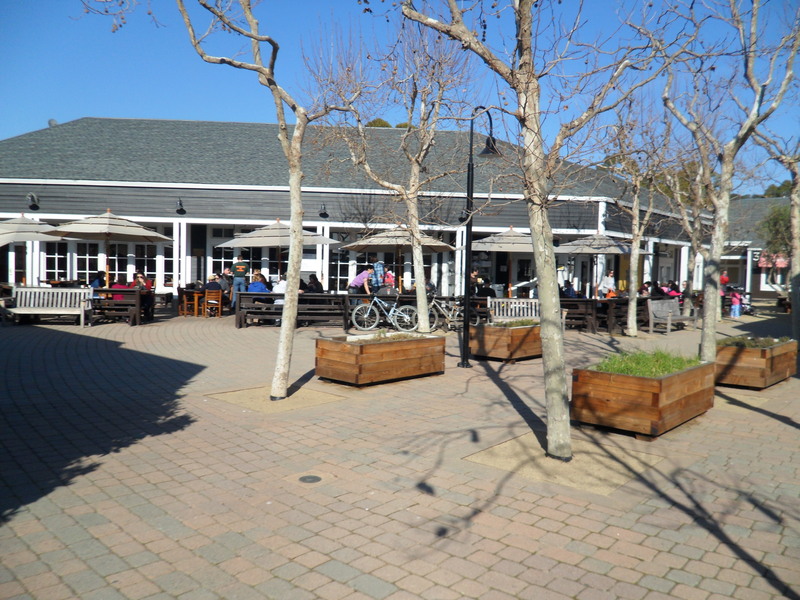 This is a place to grab some fish and chips and a beer. 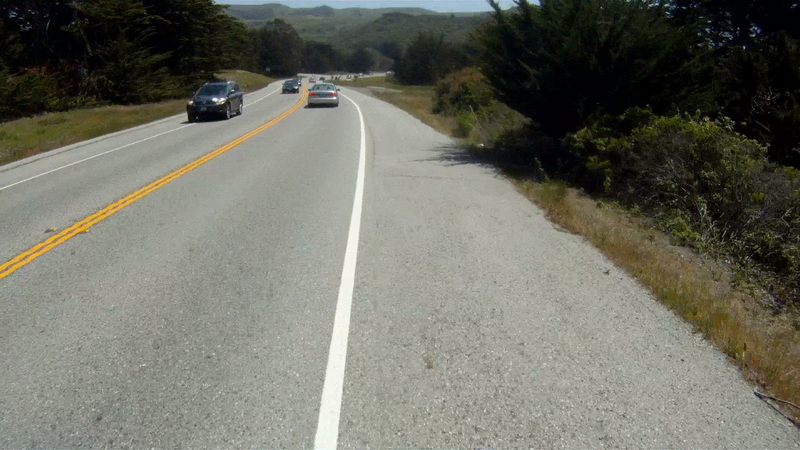 You will pass by Verde Road, which is one of the roads you will take on the way back to Half Moon Bay. 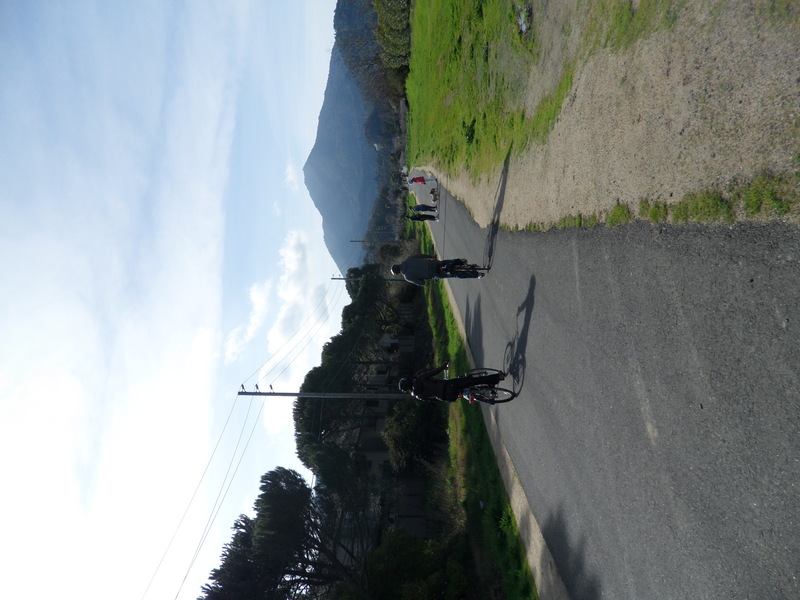 Admire the view of the sea and the mountains as you continue following CA-1. 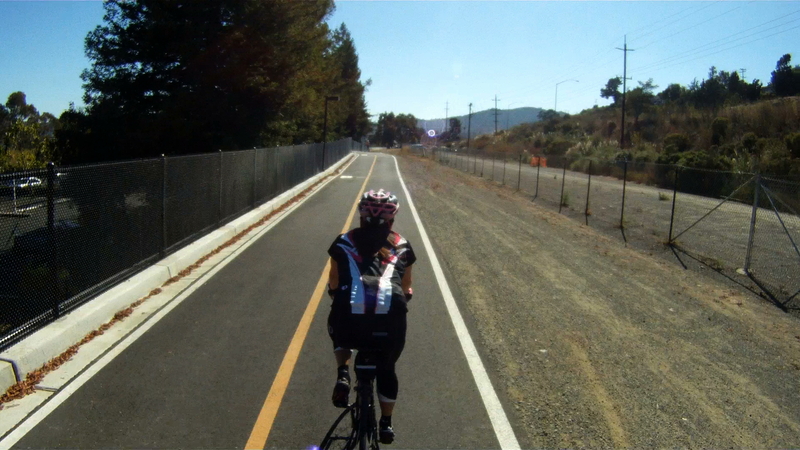 You will see Verde Road again paralleling CA-1. 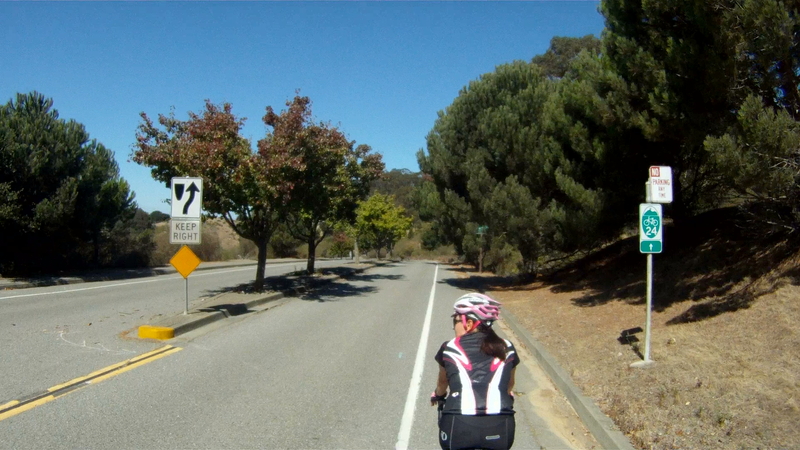 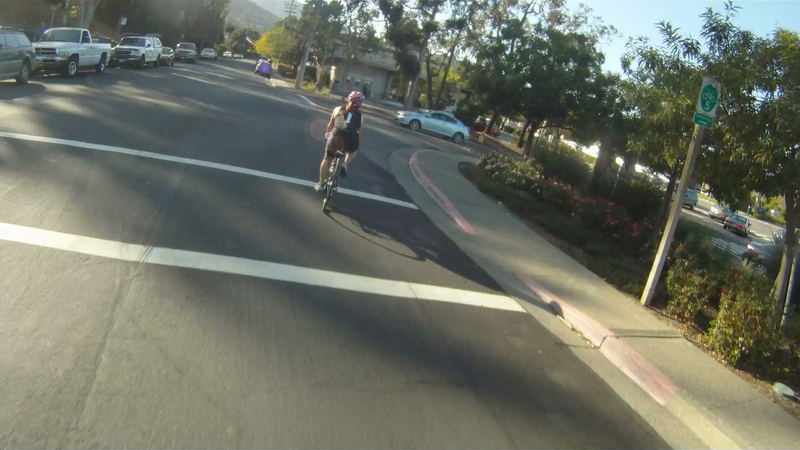 Watch for the last hill along CA-1, your left turn is at the bottom of the fast descent. 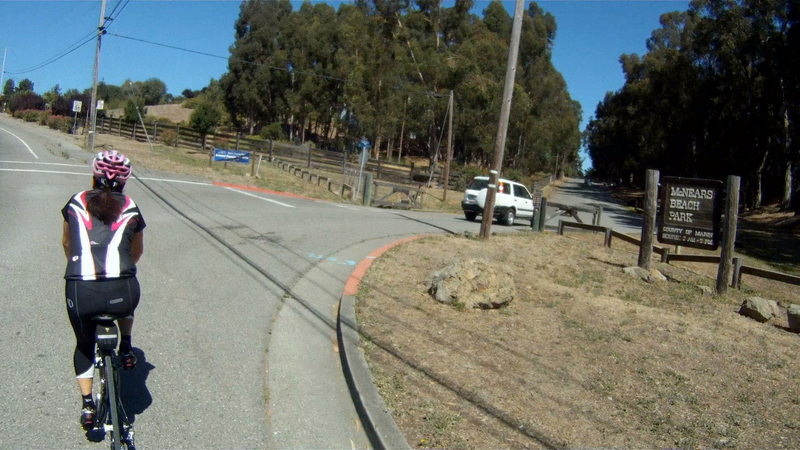 You can see your left turn onto Tunitas Creek Road at the bottom of the descent. 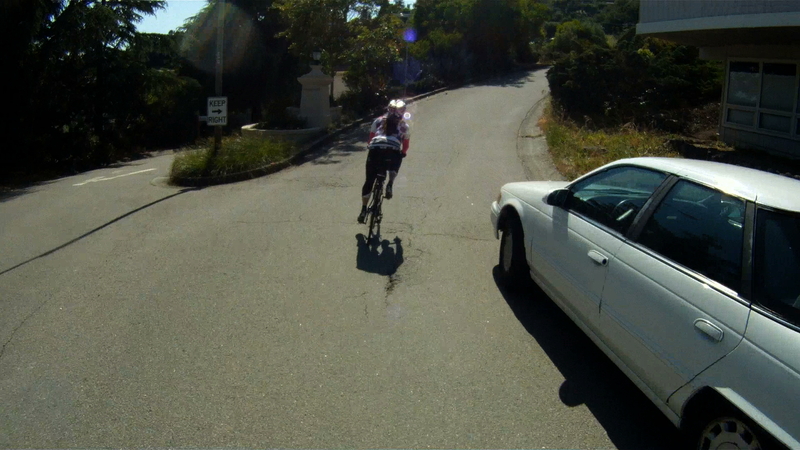 Just watch for cars in front and behind you as you make your turn. 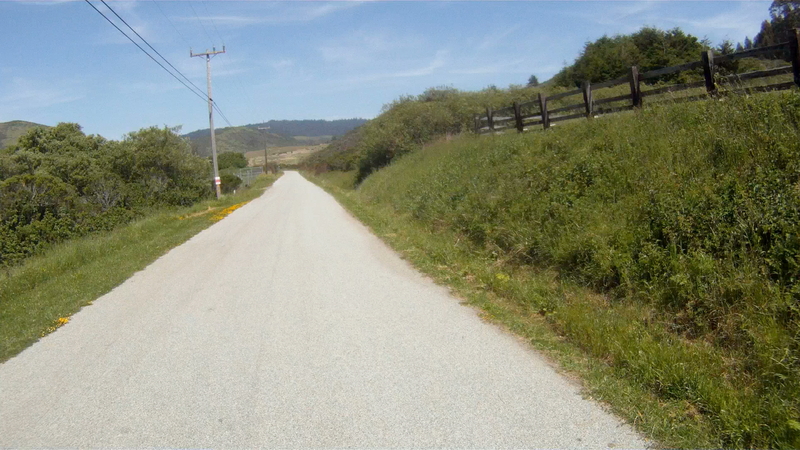 Welcome to the Half Moon Bay Backroads. 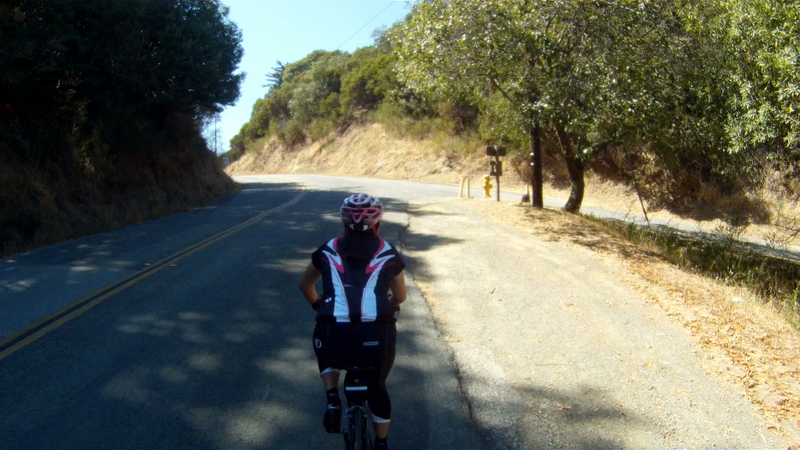 At the “T”, make a right and continue along Tunitas Creek Road. 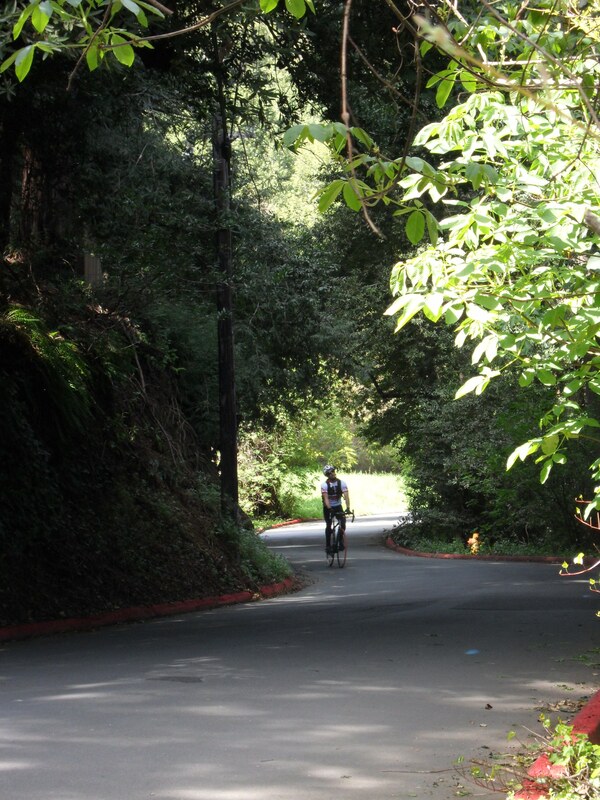 You will start to climb and enter the redwoods as your approach your next turn. 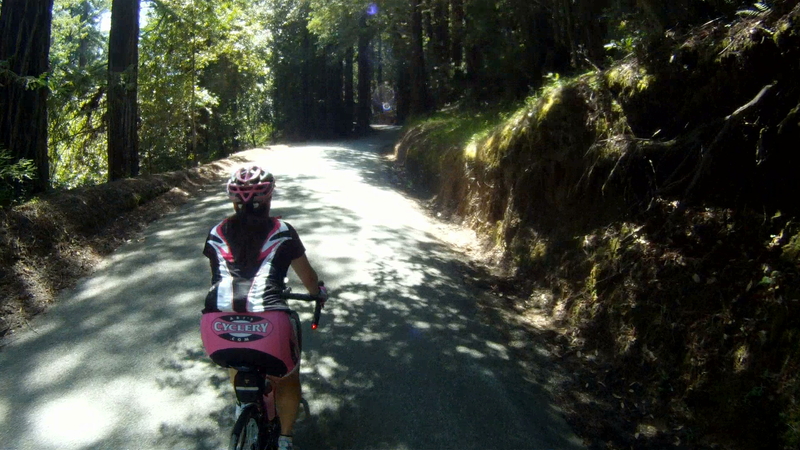 Make a left on to Lobitos Creek Road and get ready for the first big climb. 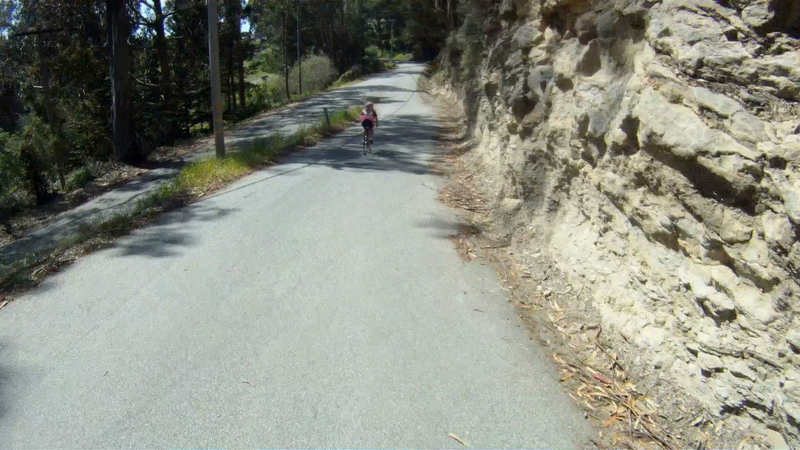 Continue climbing for another half mile or so and then you’ll reach a flat. 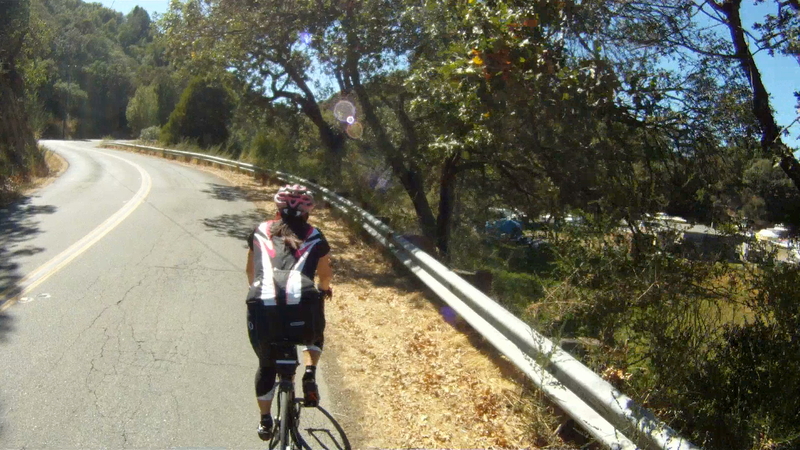 Over the next ridge is a pond and a quick, steep incline just before the wicked descent. 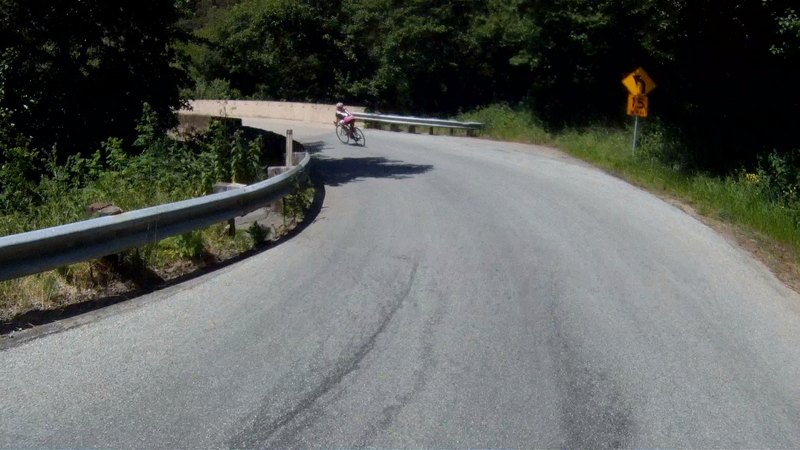 And then comes the very fast, narrow descent. 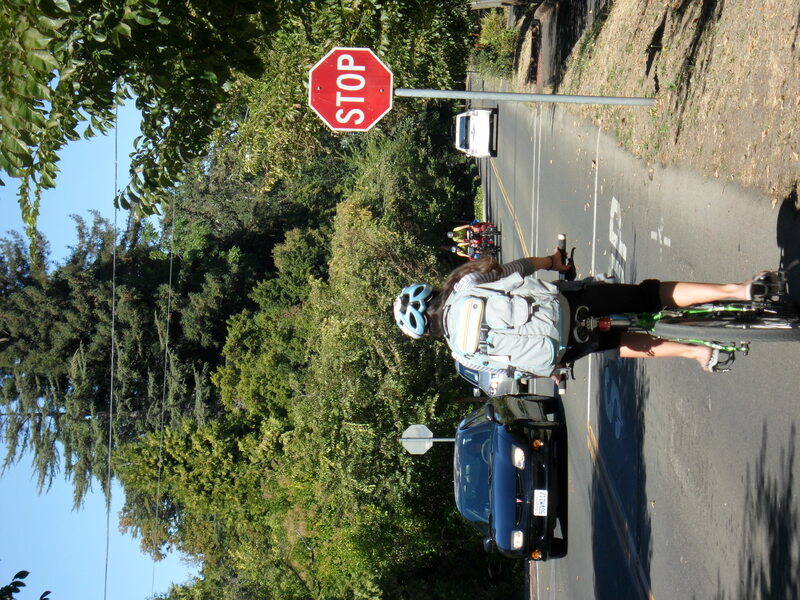 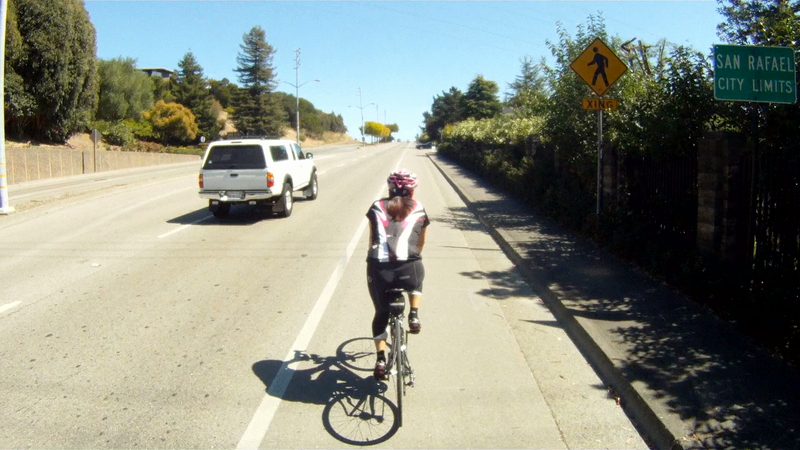 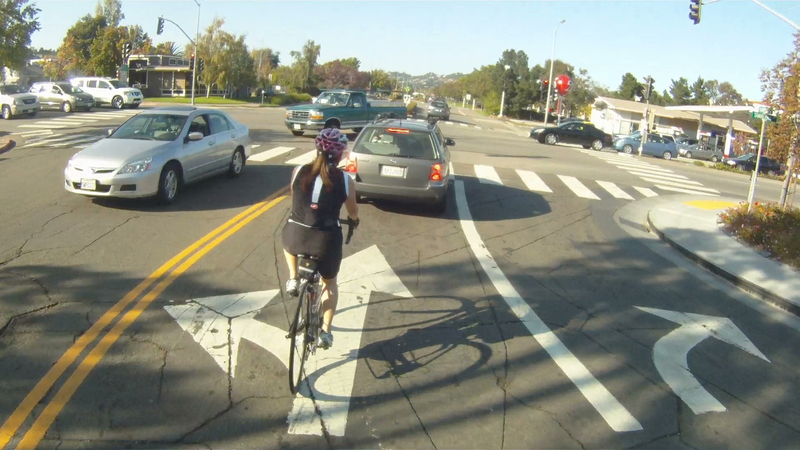 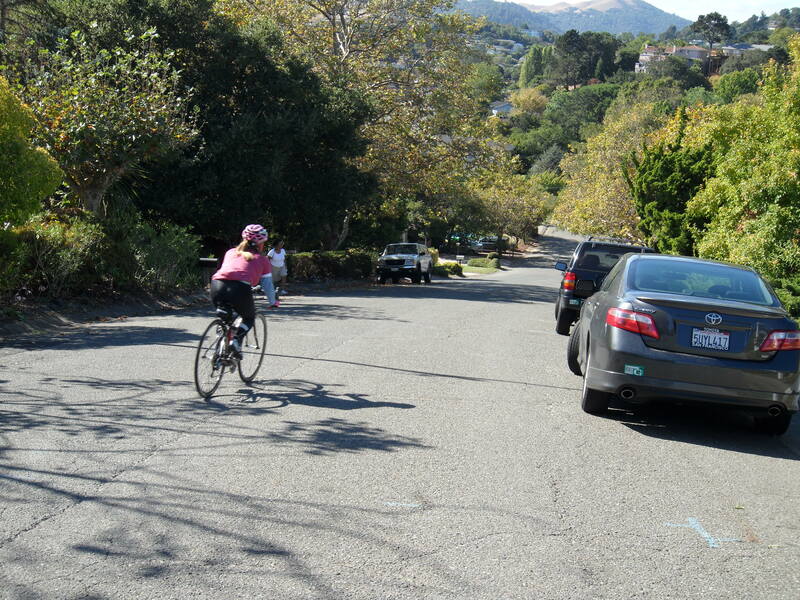 Just keep your eyes open for any cars or other bicyclists climbing in the opposite direction. 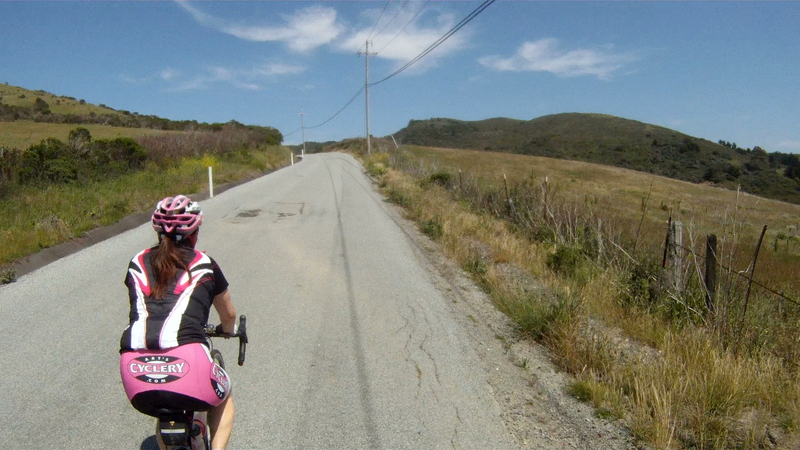 The road you take back towards Half Moon Bay is visible on the descent. 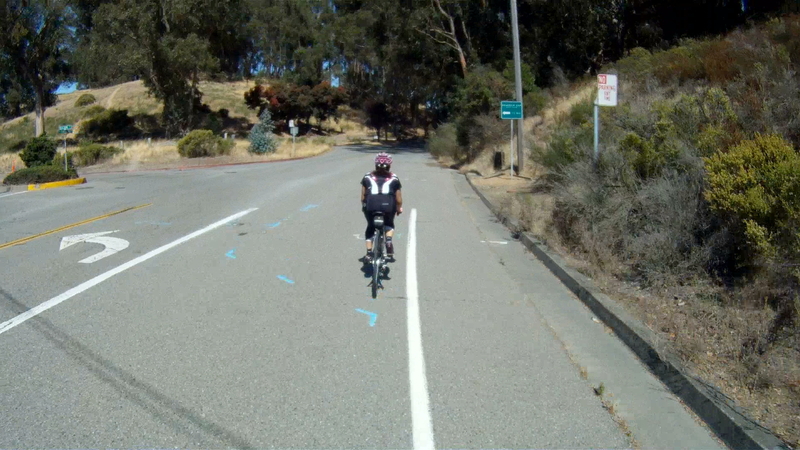 The left turn at the bottom of the run is very sharp, so make sure to control your speed into the corner. 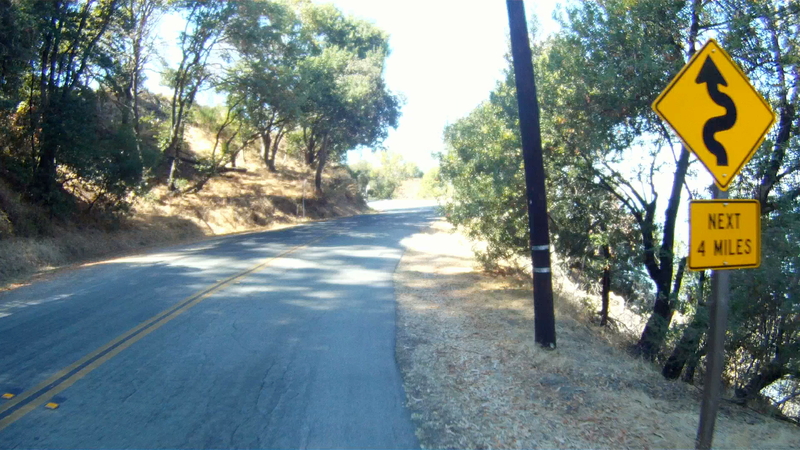 The ride starts a slight climb again as the road makes its way toward Verde Road. 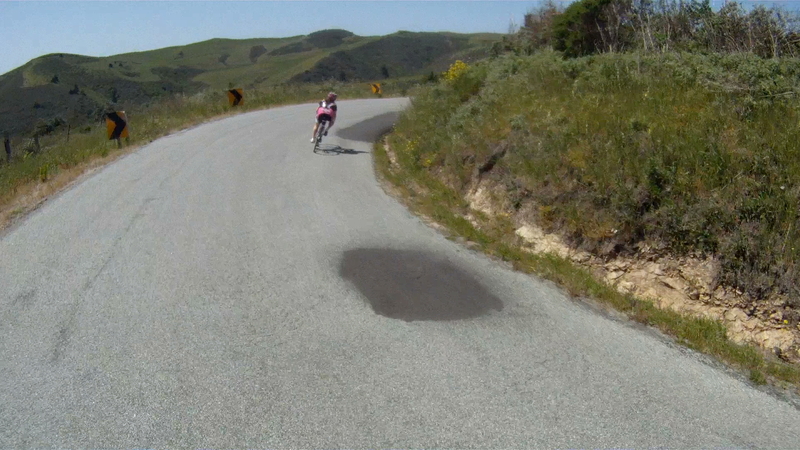 You’ll see the descent you just conquered on your left. 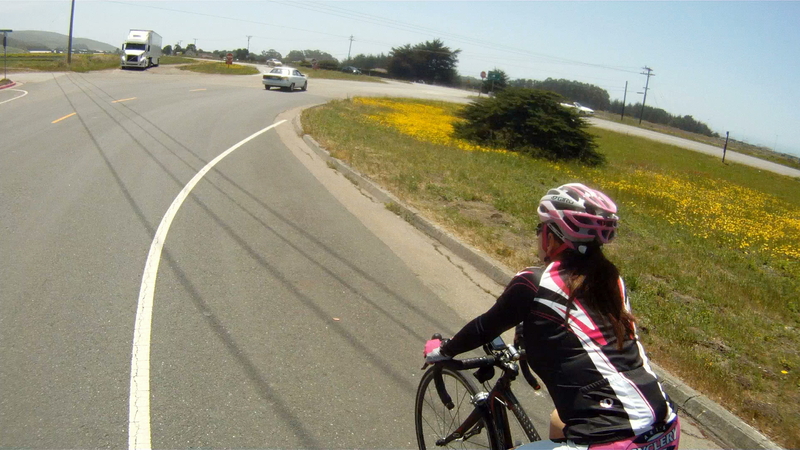 As you pick up speed, watch for cars as you merge with Verde Road. 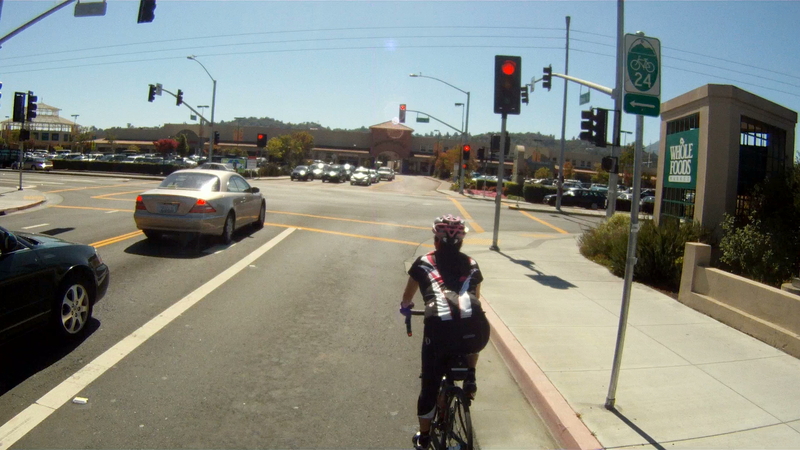 Just a short distance down Verde Road you’ll start to parallel CA-1 on your left just after the stop sign. 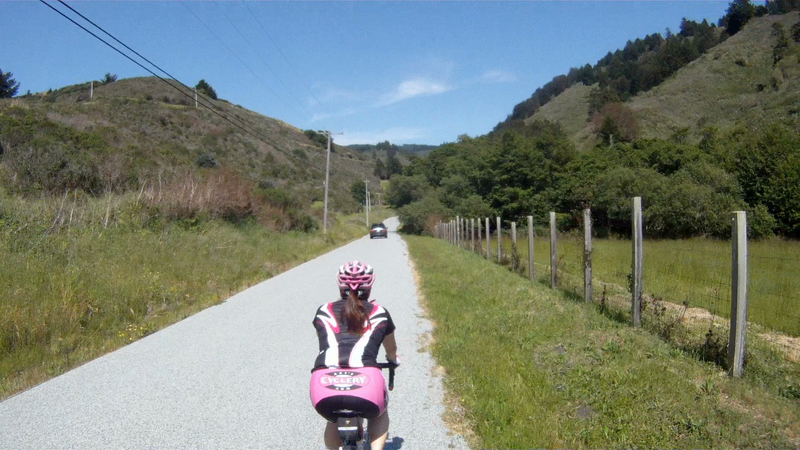 Continue along Verde Road as it rises and falls until you get to Purisima Creek Road at the next stop sign. 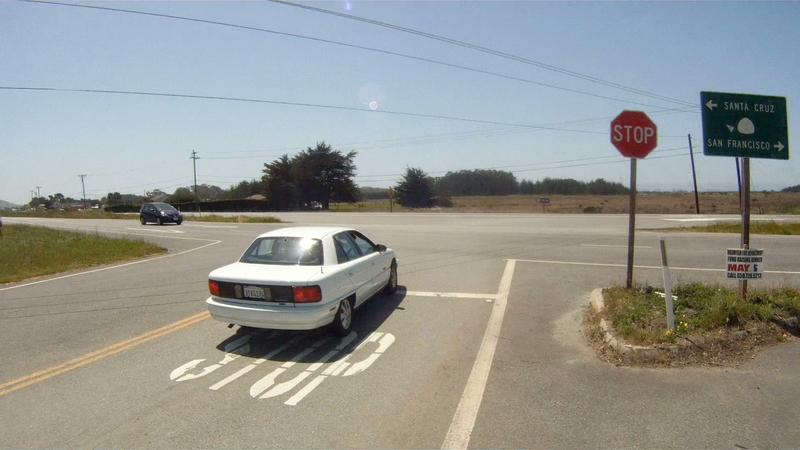 Make a right onto Purisima Creek Road and head east. 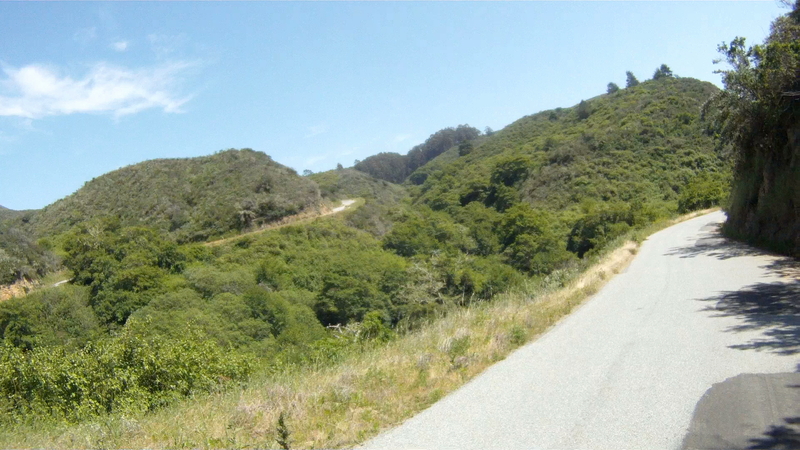 Continue along Purisima Creek Road through the valley until the road ends at Purisima Creek Open Reserve. 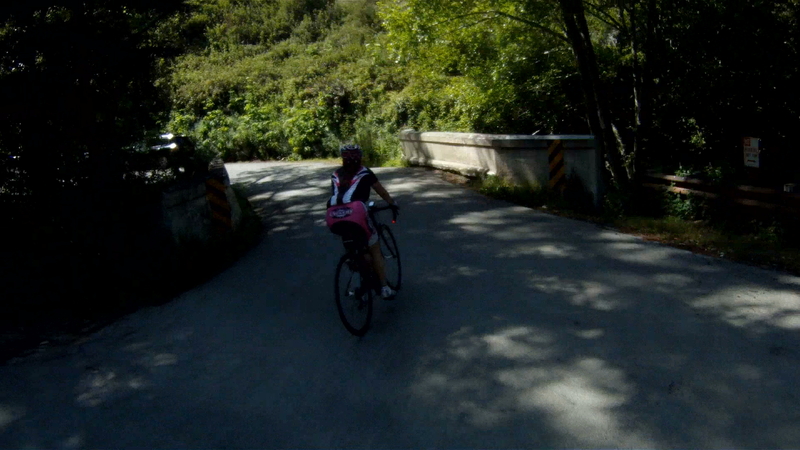 At the Open Reserve parking lot, make a left onto Higgins Canyon Road over the bridge and start climbing. 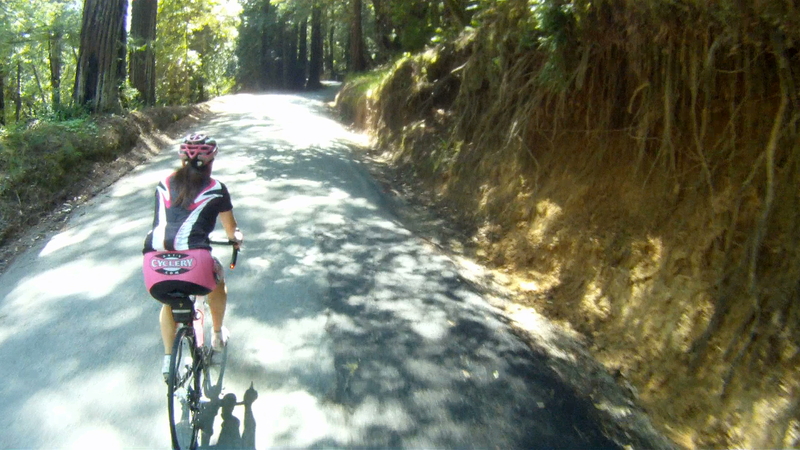 Look to your left and you will see Purisima Creek Road in the valley below. 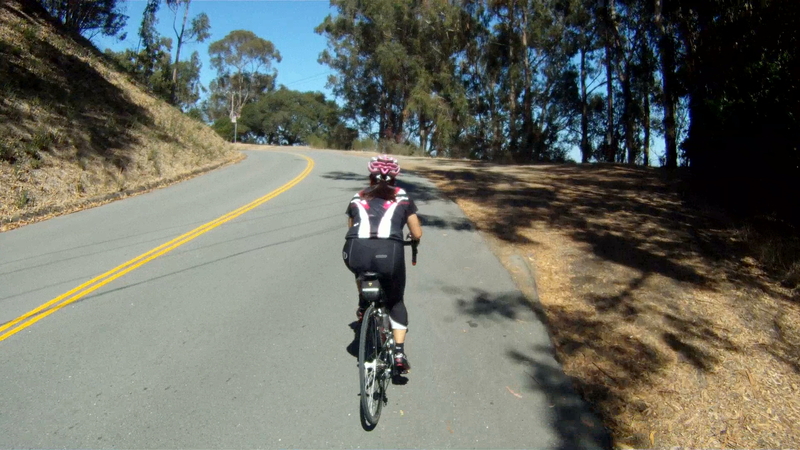 Keep climbing and you will eventually see the ridge line in the distance. 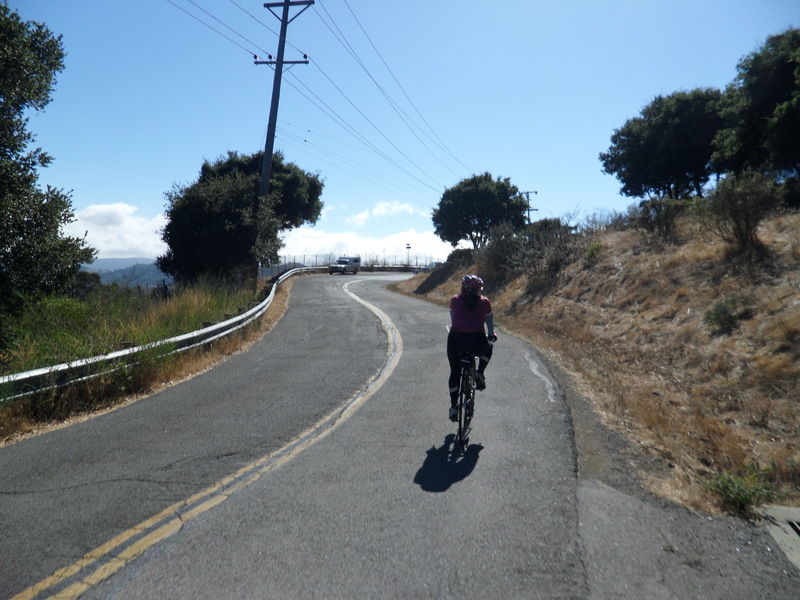 Once you reach the ridge line, get ready for a quick and windy descent! 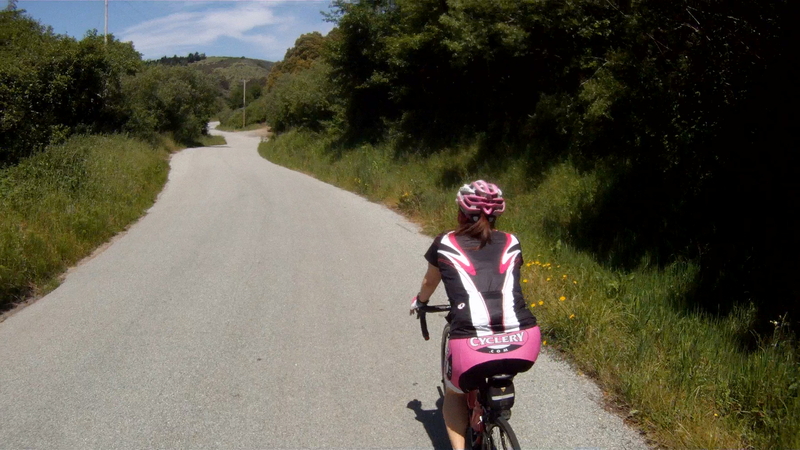 Quick corners, narrow roads and opposing traffic make this fun, but also keep to your side of the road. 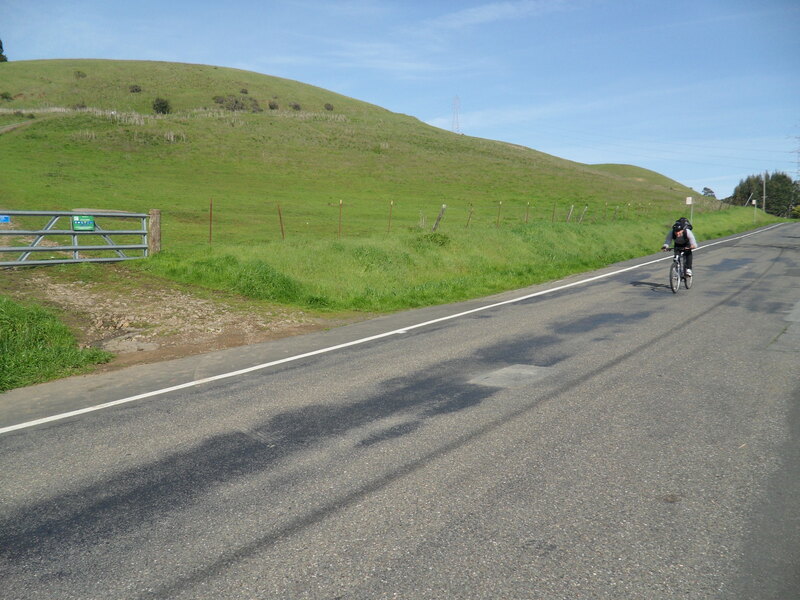 Once you reach the bottom of the descent, keep pedaling over the remaining rolling hills until you reach the flat farmlands. 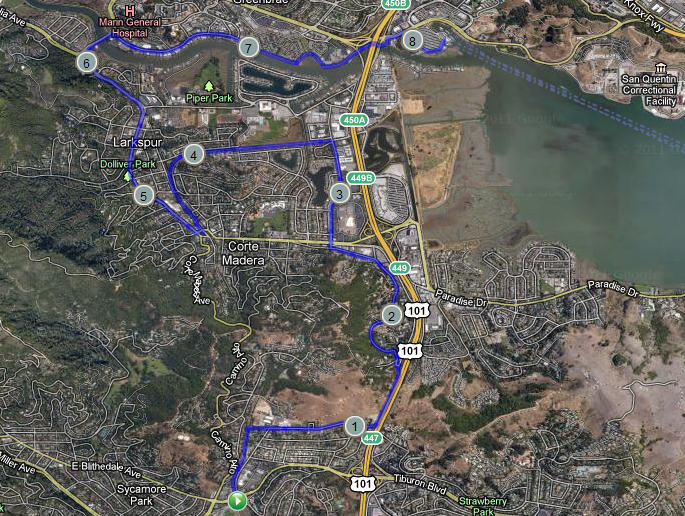 Just another couple of miles along the flats and you’ll be back to Half Moon Bay. 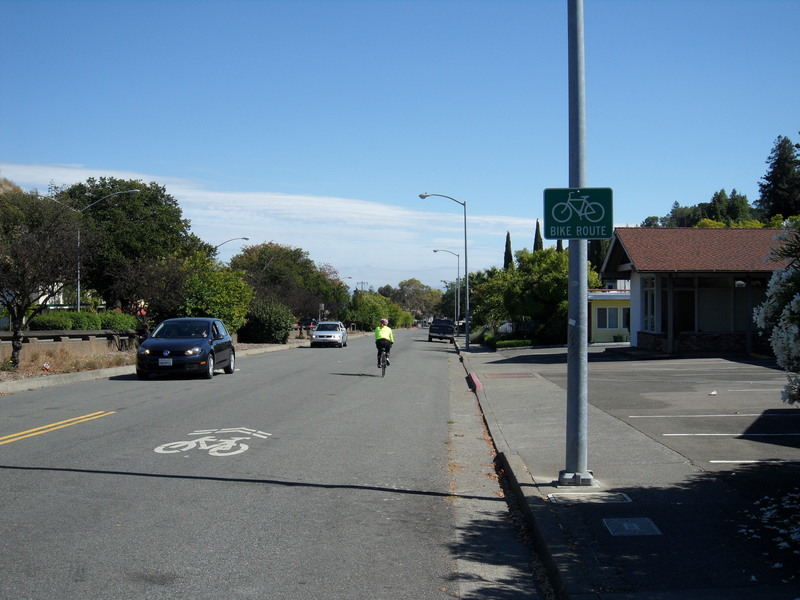 Make a right Main Street, just past the fire station heading back into downtown. 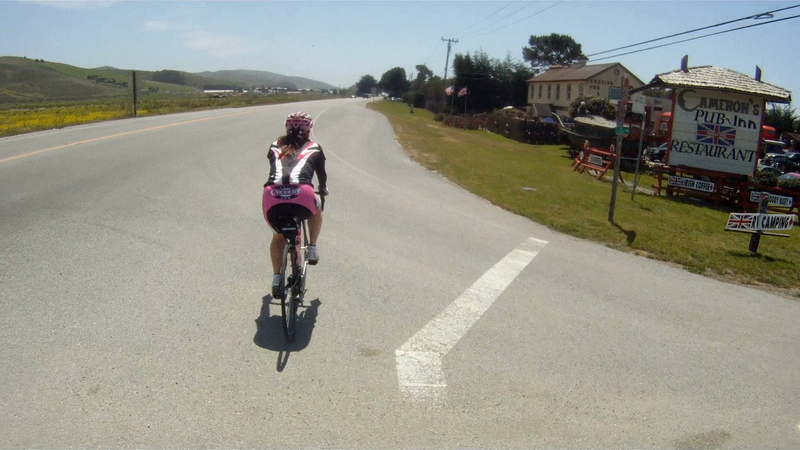 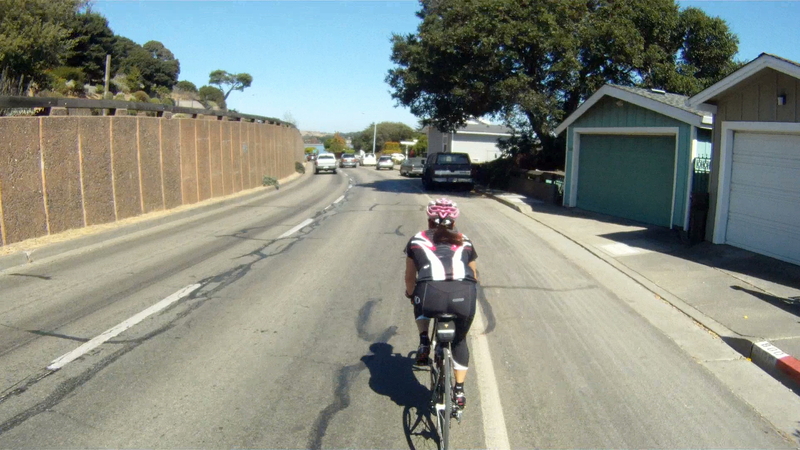 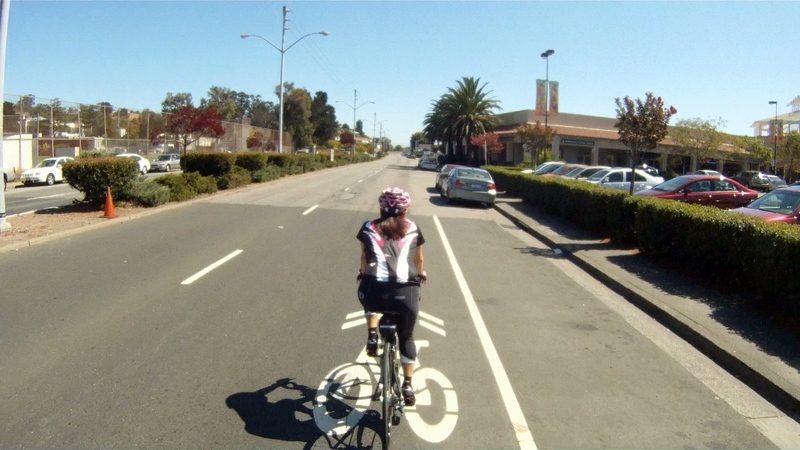 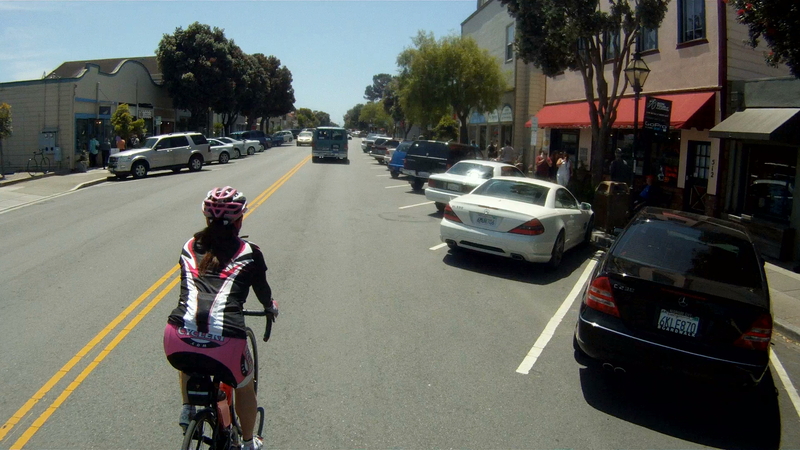 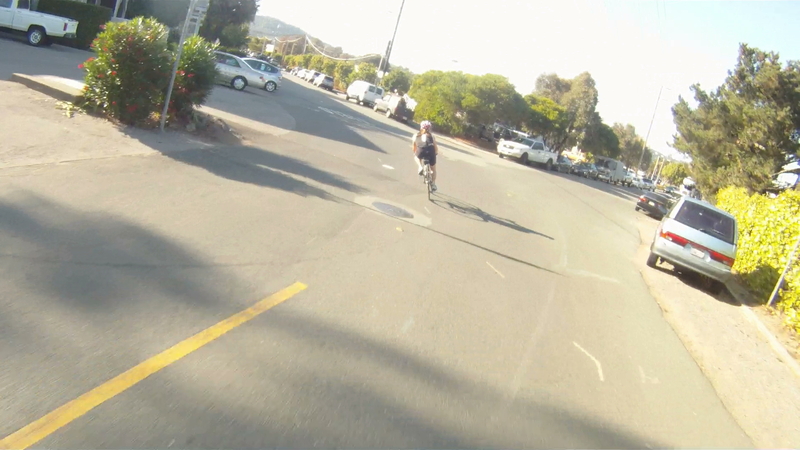 Once you’re back in Half Moon Bay, pedal back up Main Street to complete your ride. 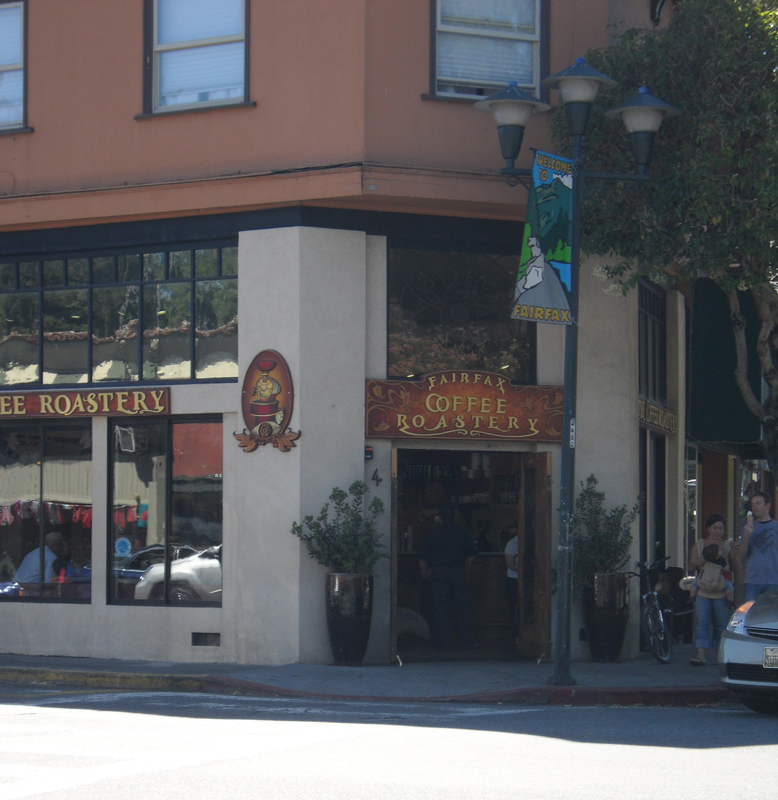 Once you’ve packed back up, it’s time for a bite to eat. 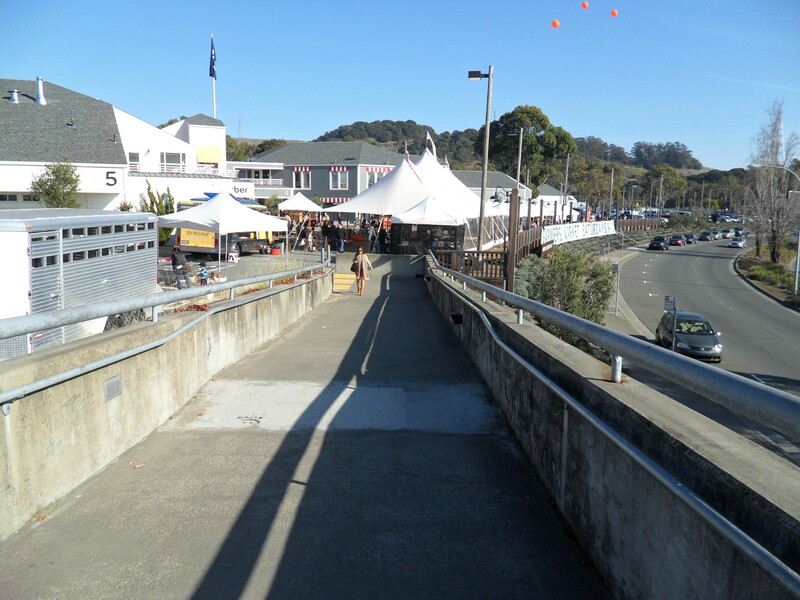 Our suggestion is to grab a crab melt sandwich on your way up CA-1 at Nick’s Restaurant on Rockaway Beach in Pacifica. 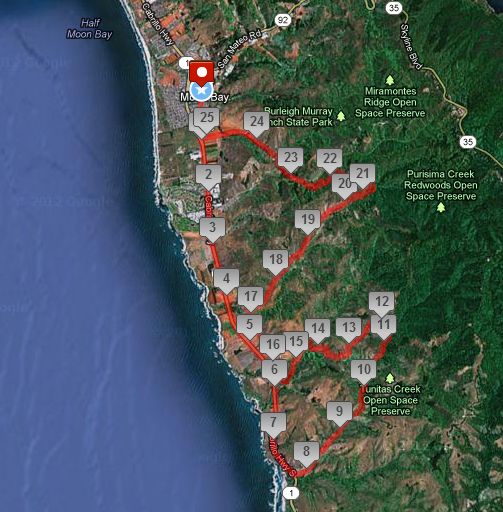 This first ride in Half Moon Bay is a great way to get acquainted with all of the different places you can explore in San Mateo County riding from the Pacific Ocean through the redwoods and beyond. 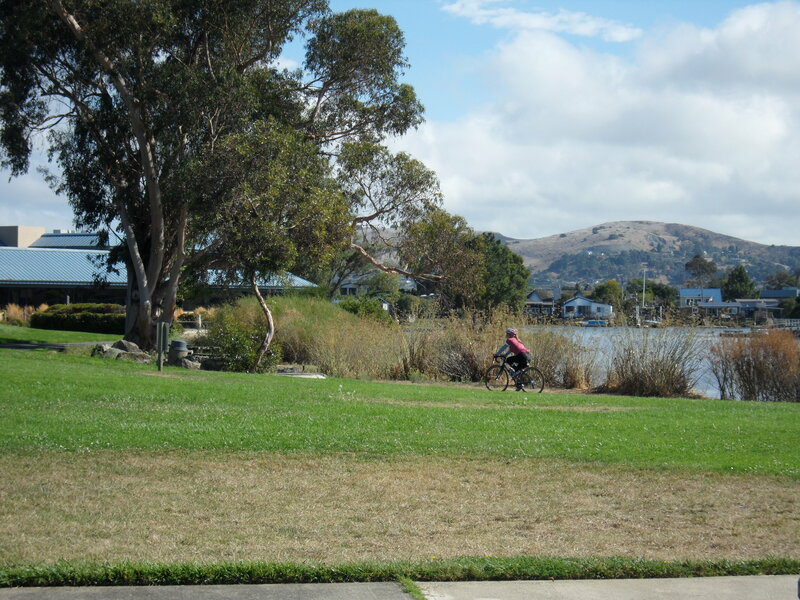 China Camp State Park is a short ride from San Rafael and is home to some of the area’s best beginner mountain biking along with tons of wildlife and gorgeous views of the San Pablo Bay. 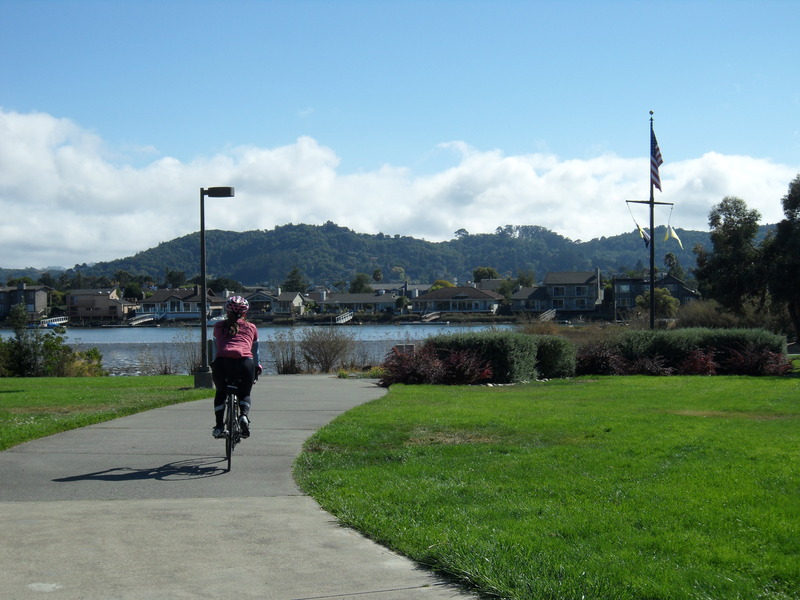 If road biking is more your thing, then China Camp offers you a great ride around the coast of the San Pablo Bay that can be added on to a ride, or can just be a destination for the day. 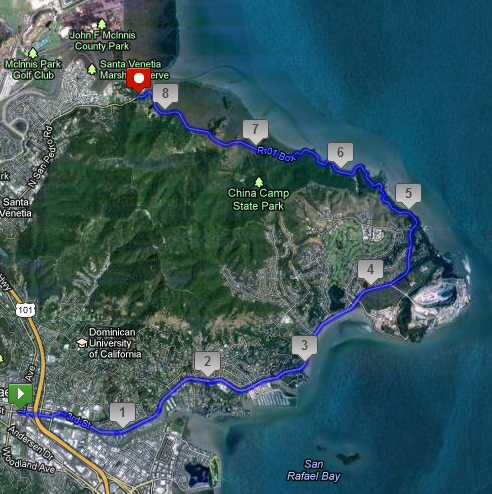 Distance from The Short Cut: 8.4 miles (16.8 miles round-trip); Larkspur Ferry Terminal and Larkspur Connection: 10.70 miles; Marin Crossroads: 18.92 miles; Distance from Sausalito: 22.94 miles; Distance from San Francisco Ferry Building (see Golden Gateway Trail): 32.75 miles. 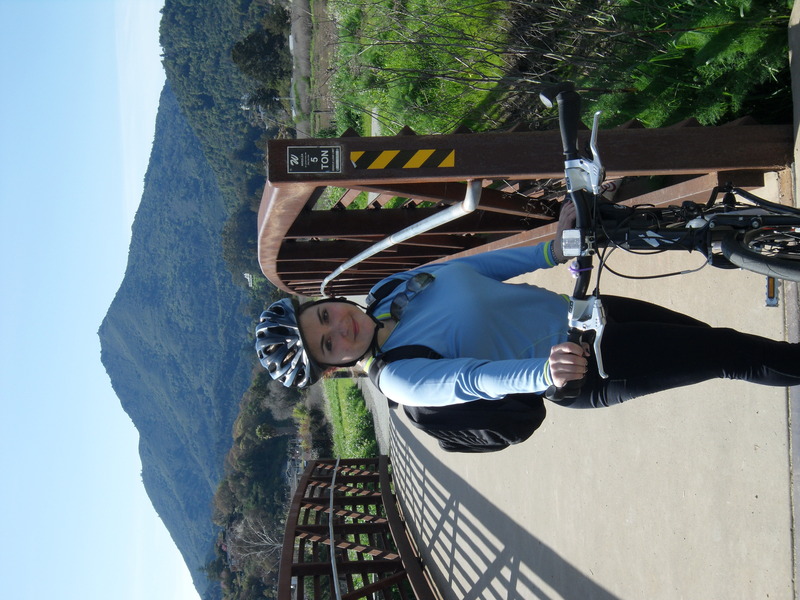 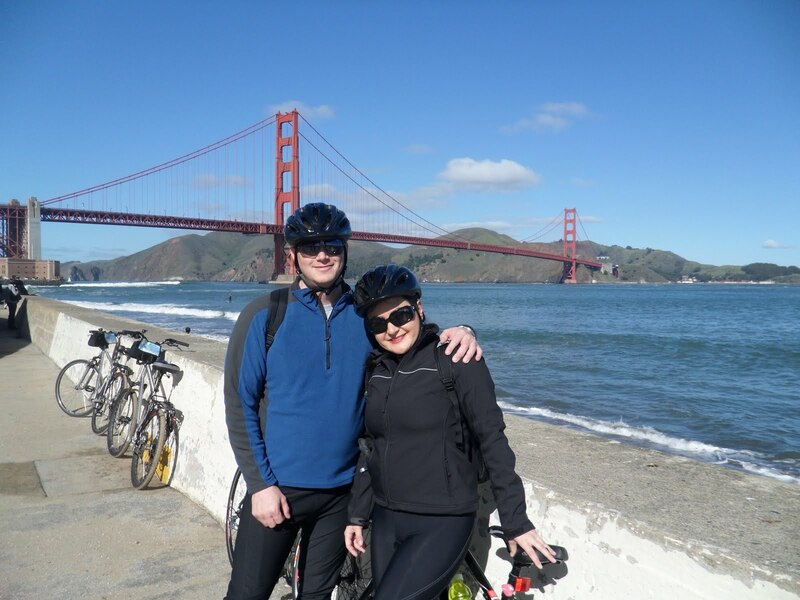 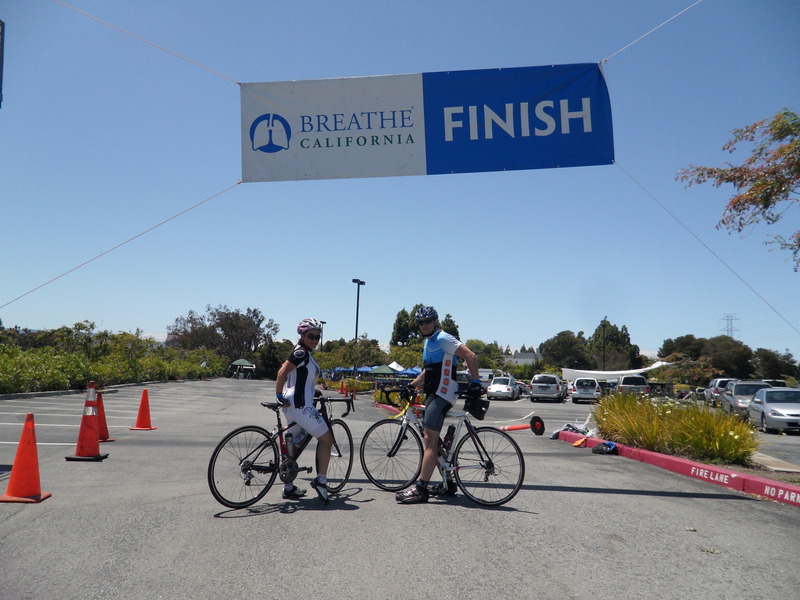 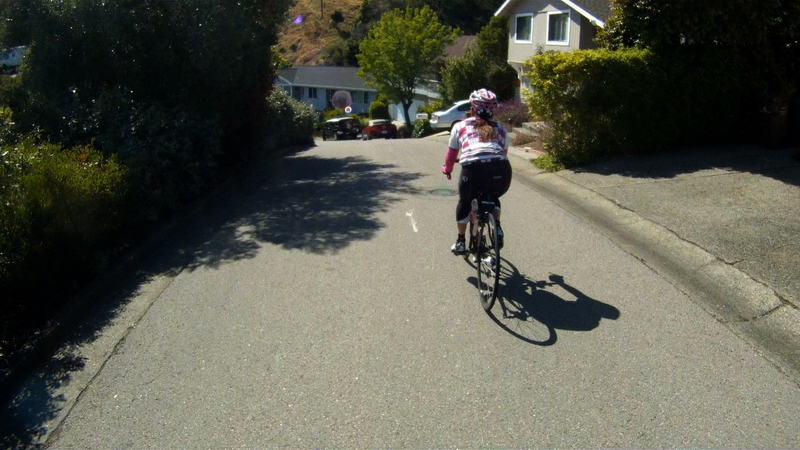 Difficulty: The ride features an urban ride through San Rafael which gives way to rolling hills and scenic views of San Pablo Bay, out far enough to make it a full day ride, but not so hard to get to a tourist couldn’t make it. 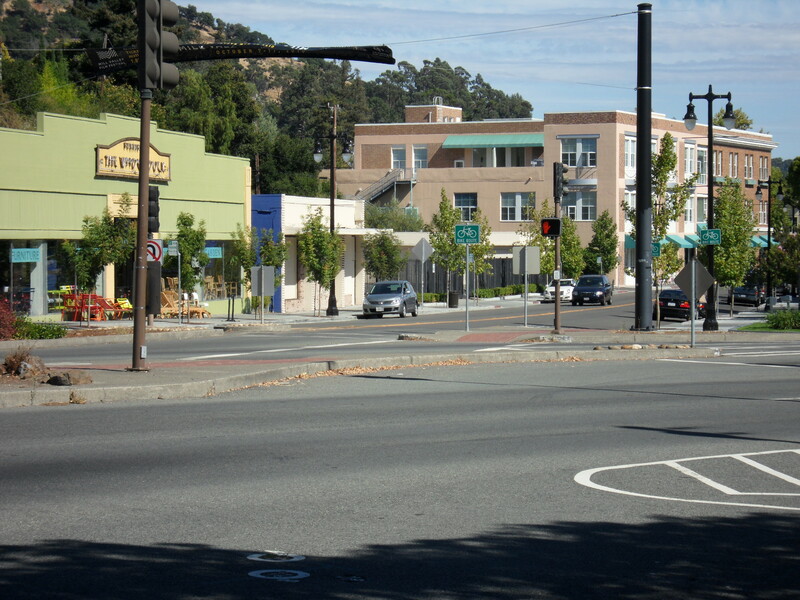 Starting at the intersection of Lincoln Avenue and Second Street in San Rafael, the end of The Short Cut or partially through Let’s Grab a Beer, continue north along Lincoln Ave. Basically, follow Lincoln Ave. across Second St., or with the heavy traffic on Second St. if you are coming from downtown San Rafael (the faster route detailed in Let’s Grab a Beer), the safer option is to make a right onto Lincoln Ave. from Second St. and do a U-Turn on Lincoln Ave. and then cross Second St. 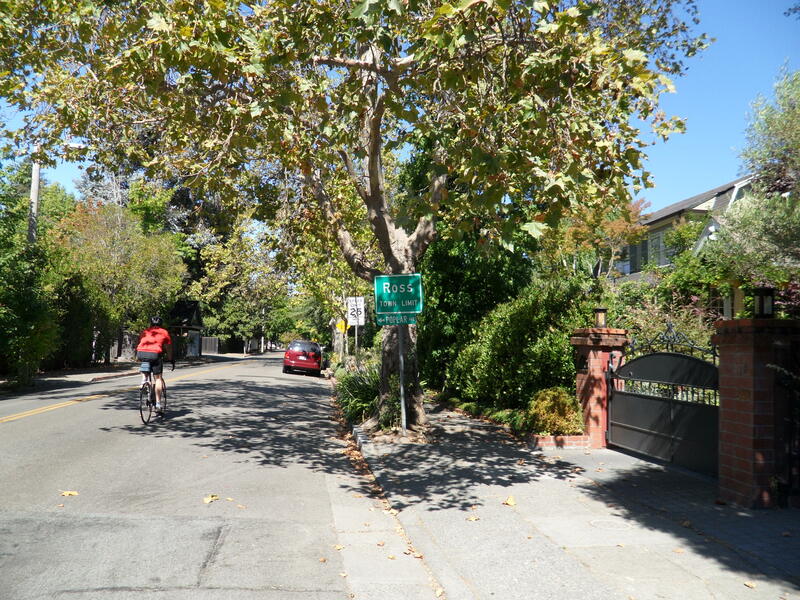 Follow Lincoln Ave. to Fourth Street (the route for the slower option detailed in Let’s Grab a Beer), then make a right onto Fourth Street, or continue to go straight if you are coming from Fourth St. 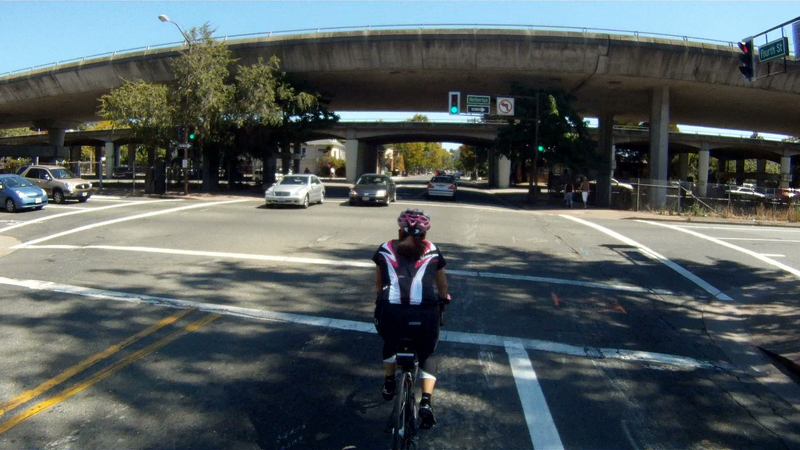 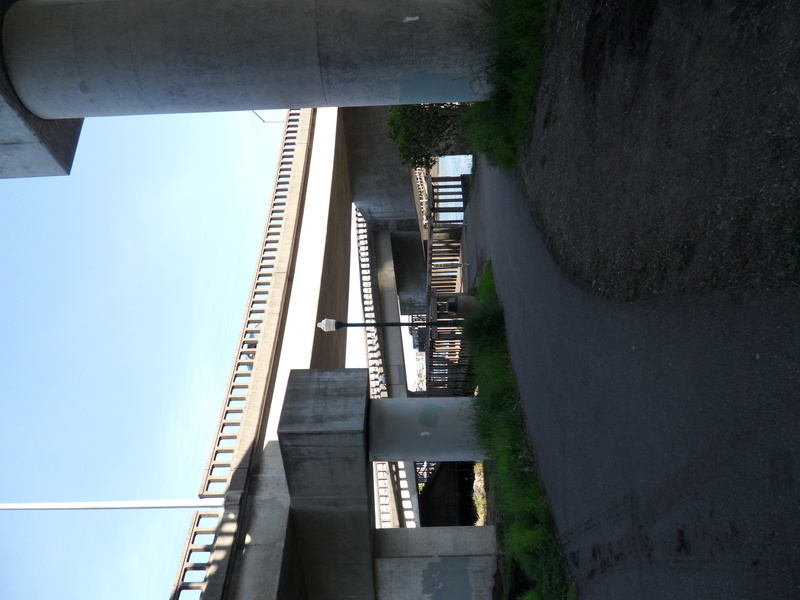 Follow Fourth St. as it crosses over the railroad tracks and under US-101. 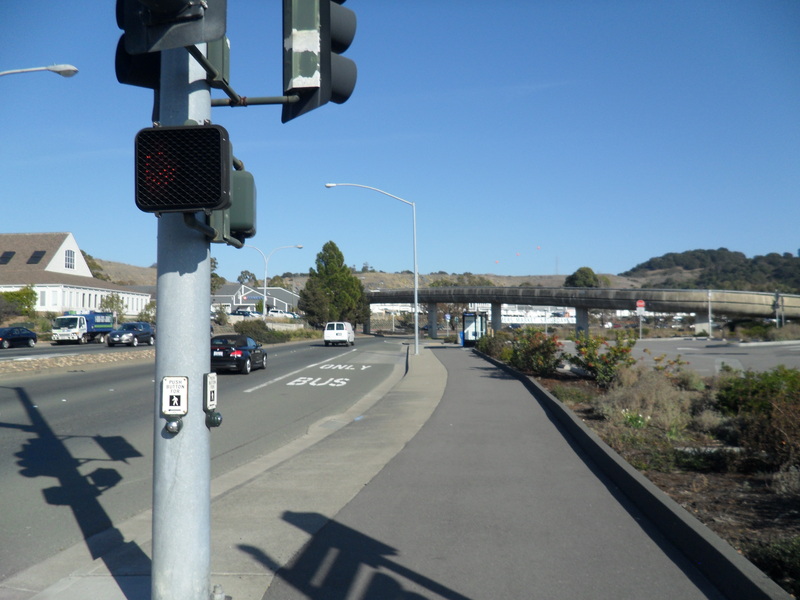 Continue to follow Fourth St. until you reach Union St. Make a right at Union St. 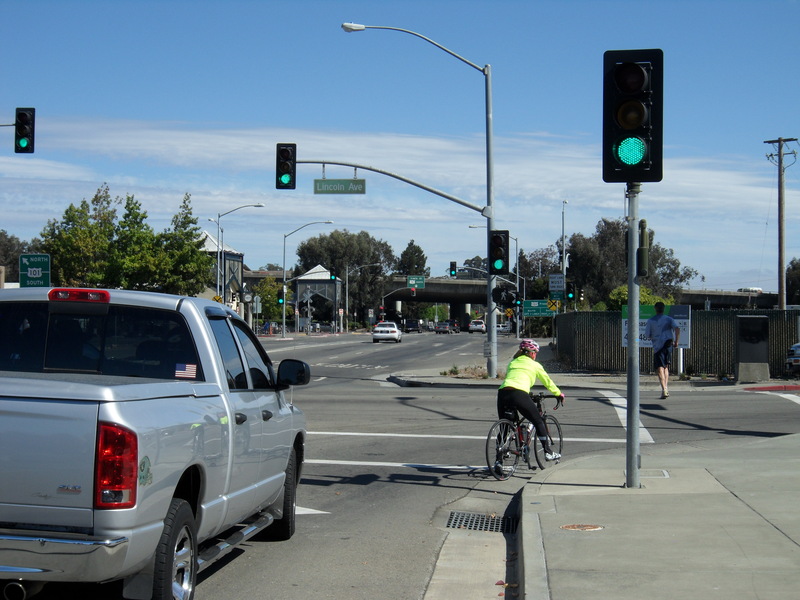 Follow Union St. and make a left onto Third St. at the light. 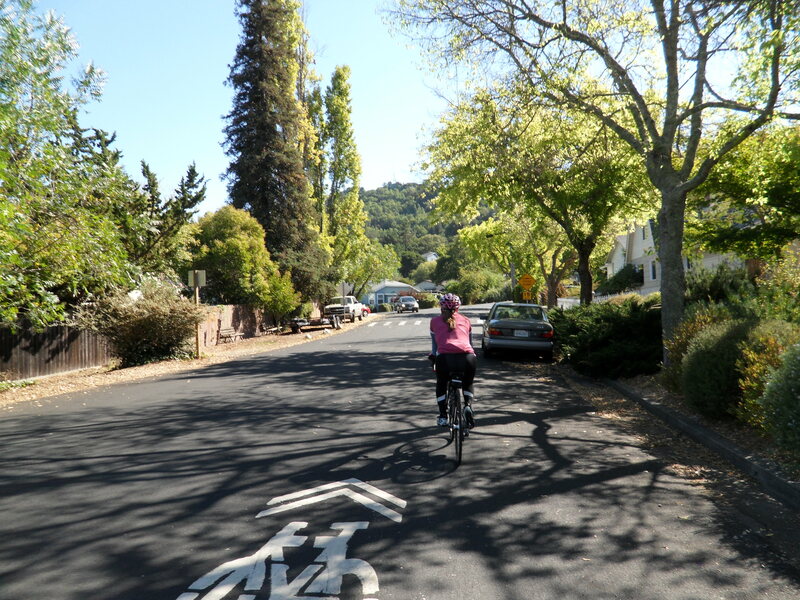 Follow Third St. through San Rafael as it leaves the city and climbs to the rolling hills toward San Rafael Bay. 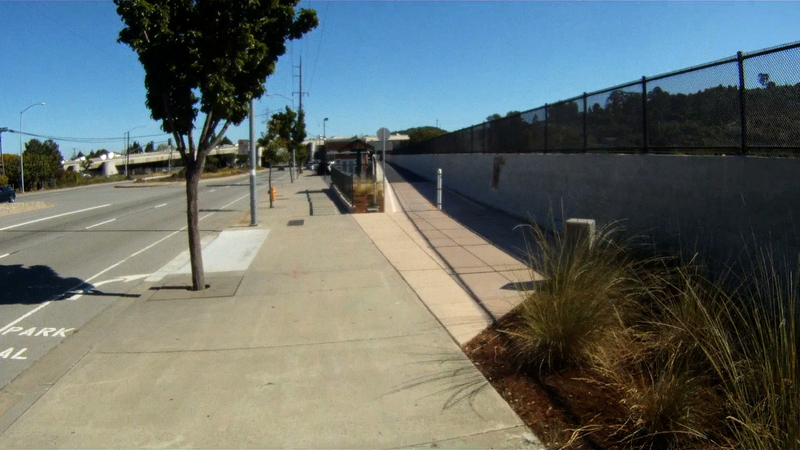 Third Street becomes Point San Pedro Rd. 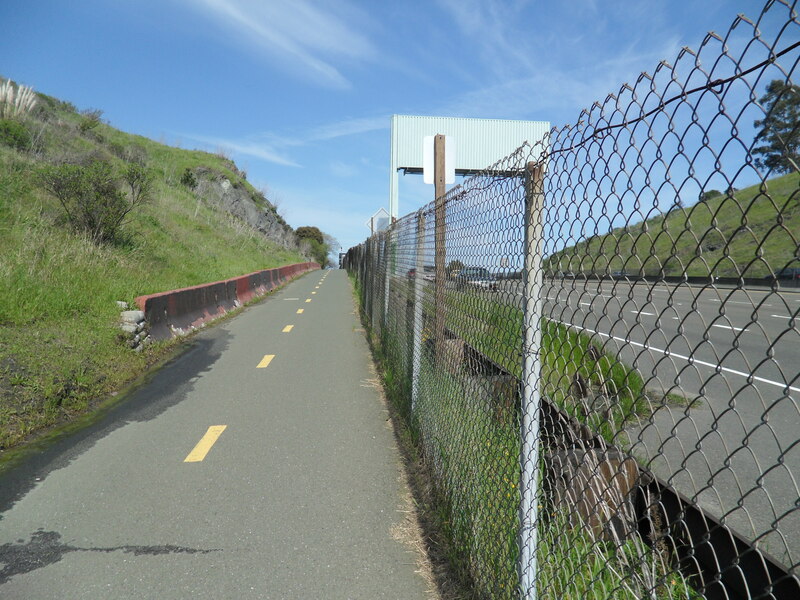 This is Bike Route 24. 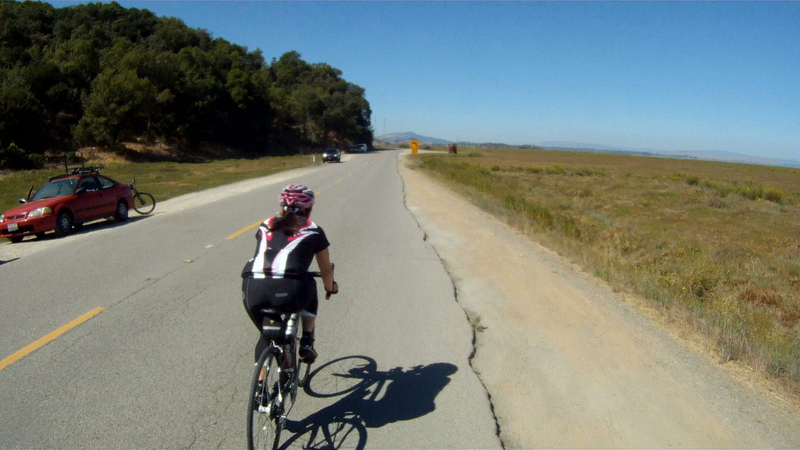 Continue to follow Route 24 as it passes by San Rafael Bay with views of the McNear Brickyard along the way. 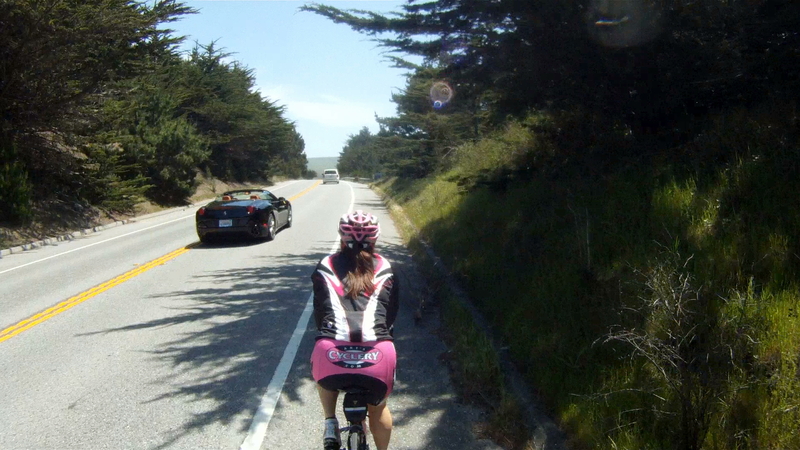 Just a bit further up the road is McNears Beach. 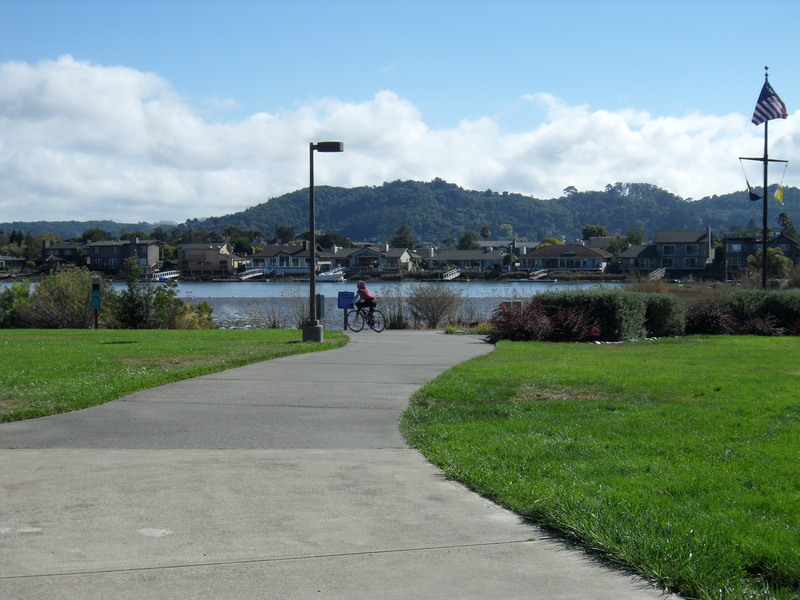 McNears Beach has an outdoor pool, tennis courts, fishing and walking trails. 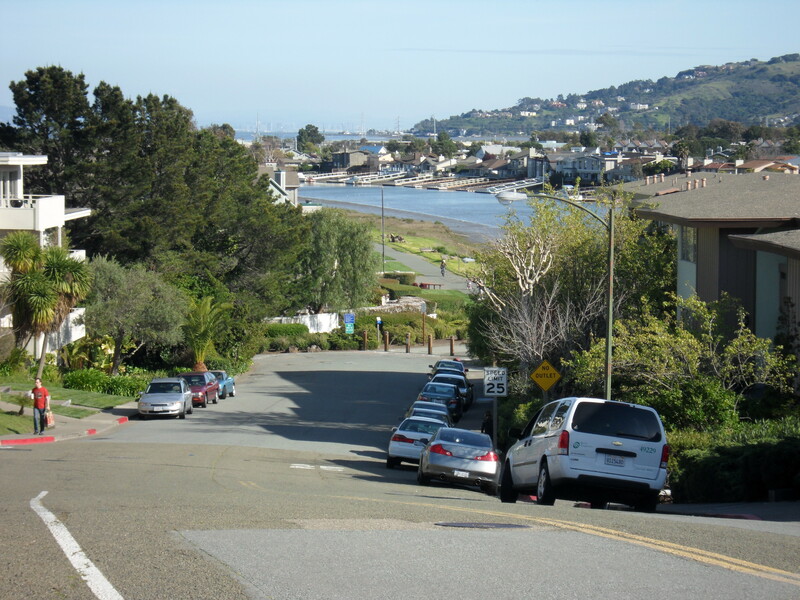 The hill leading up to and past McNears Beach is a tough climb ranging from 7 to 11%. 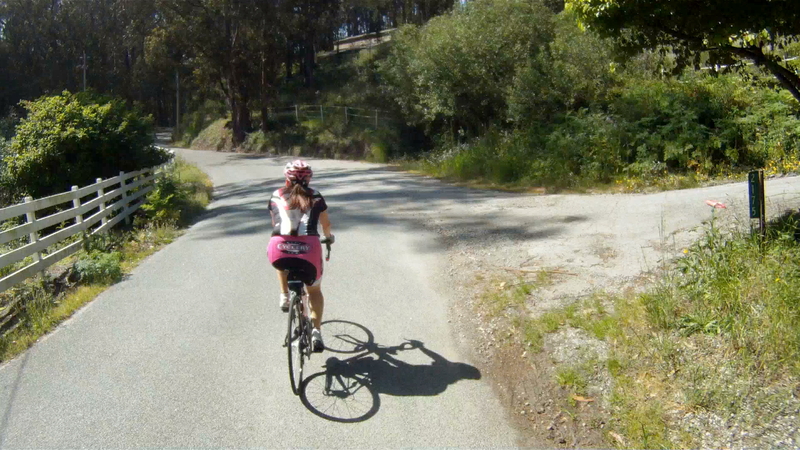 Fortunately, it’s a short hill, so just power through it and you’ll almost be to China Camp. 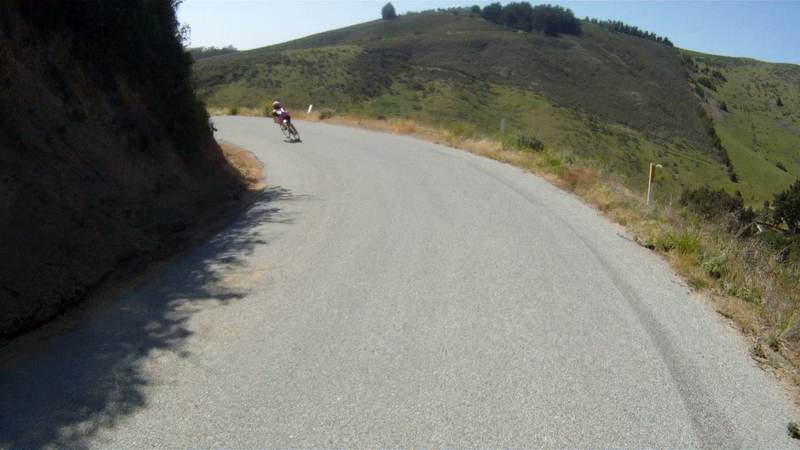 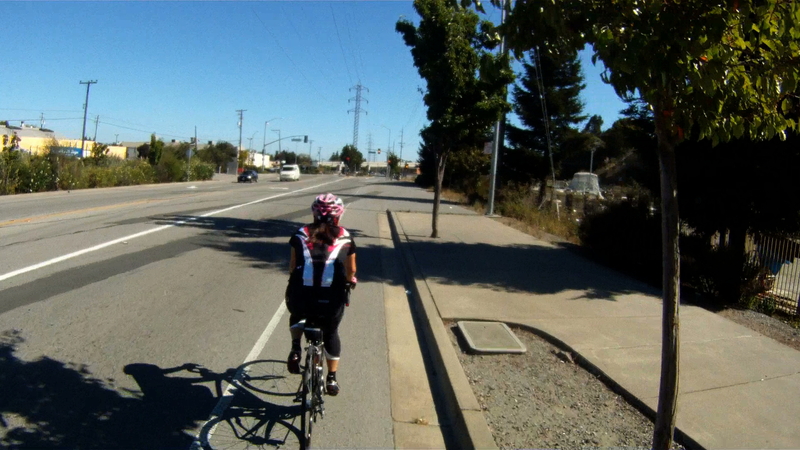 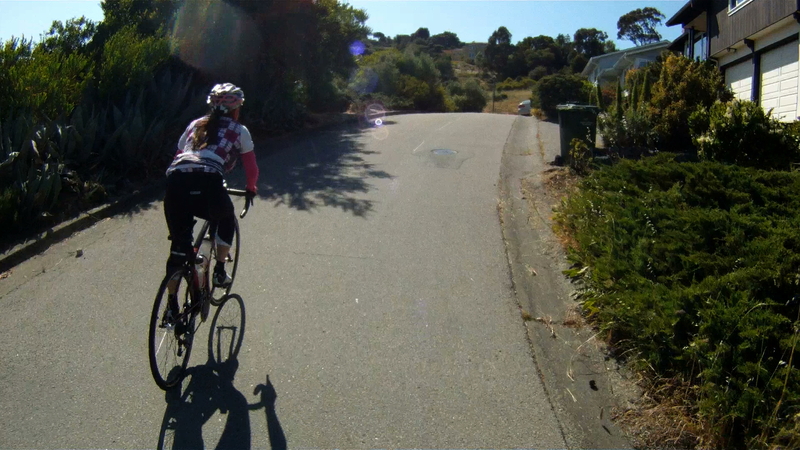 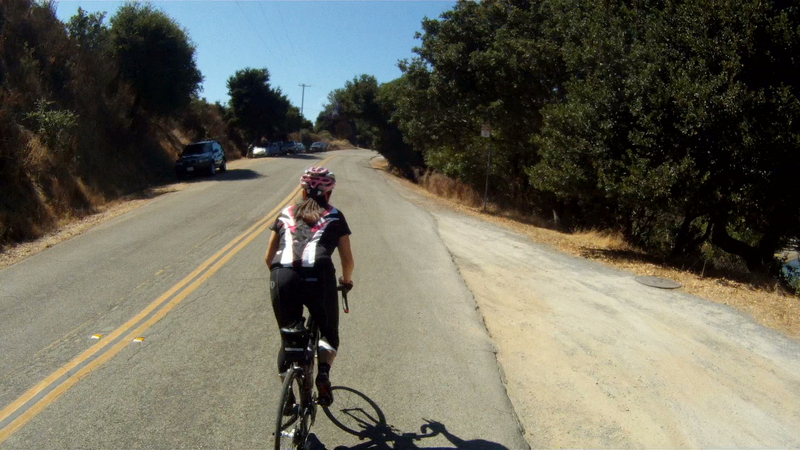 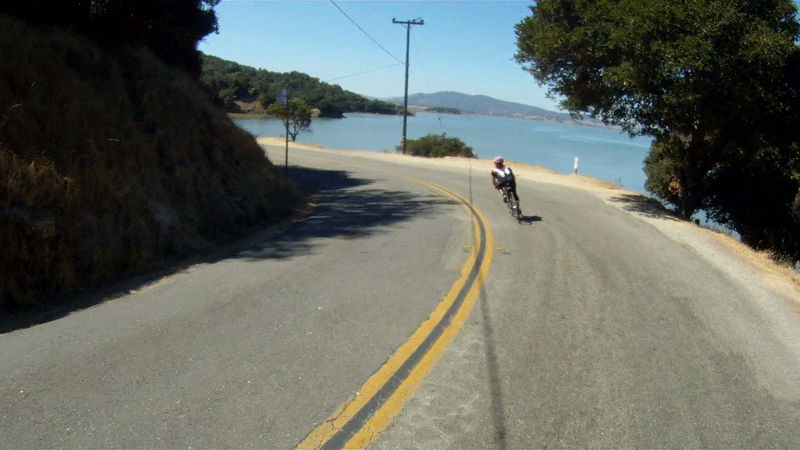 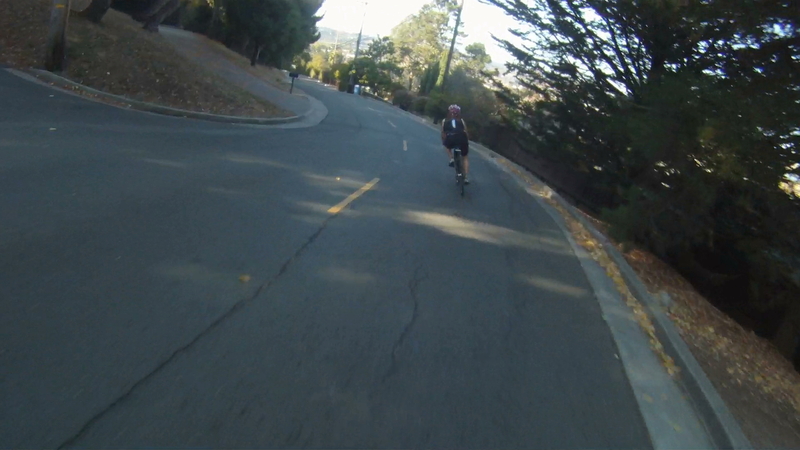 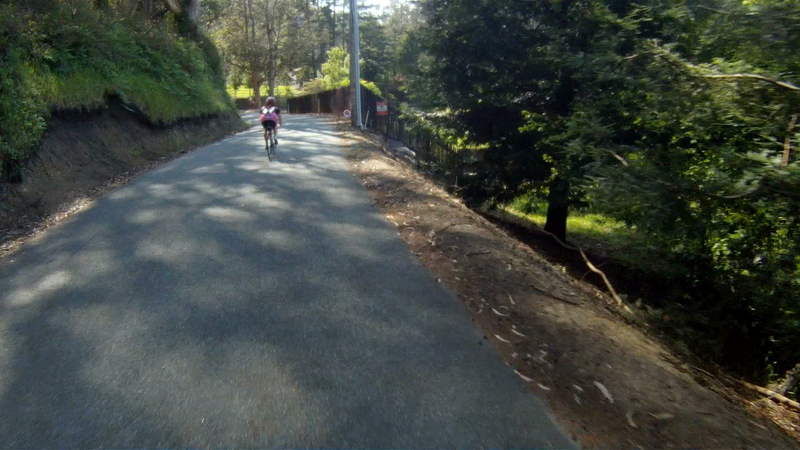 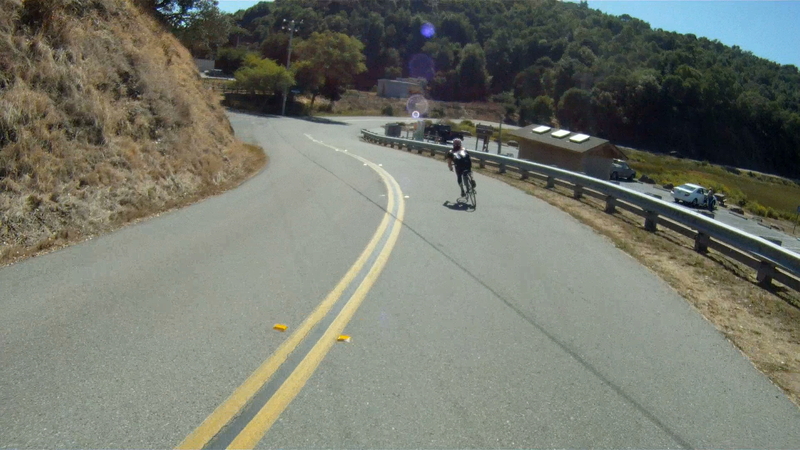 After the climb, you get a nice descent to gain some speed as you enter China Camp. 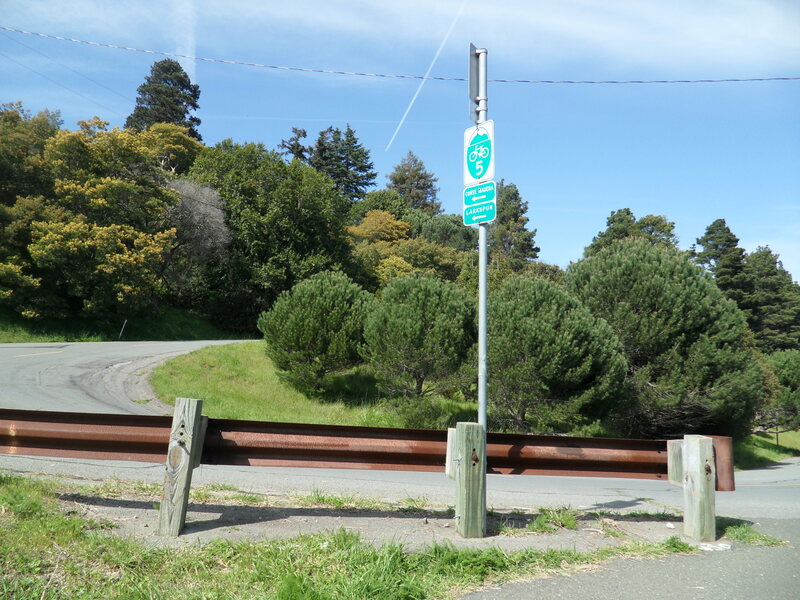 At the entrance to China Camp Route 24 ends and Route 26 begins. 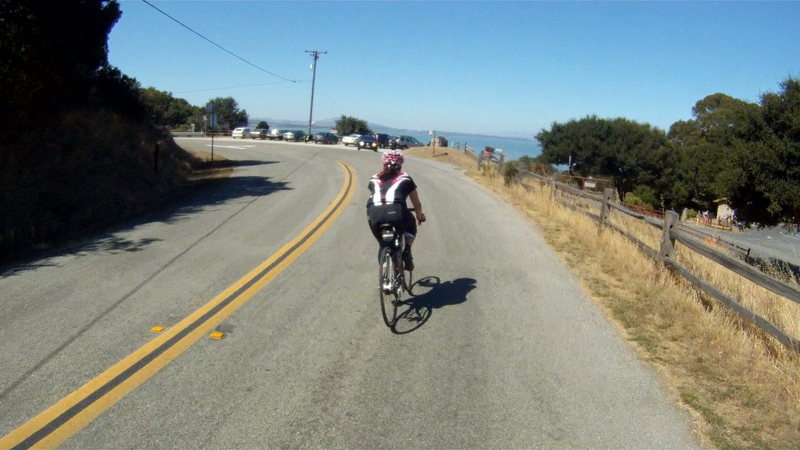 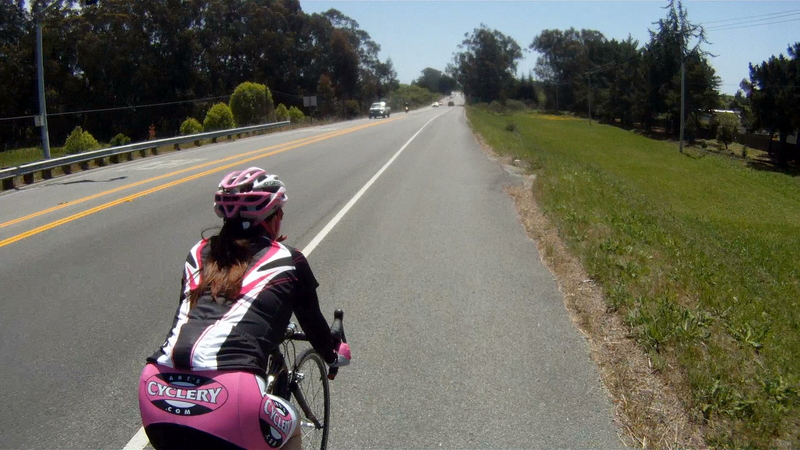 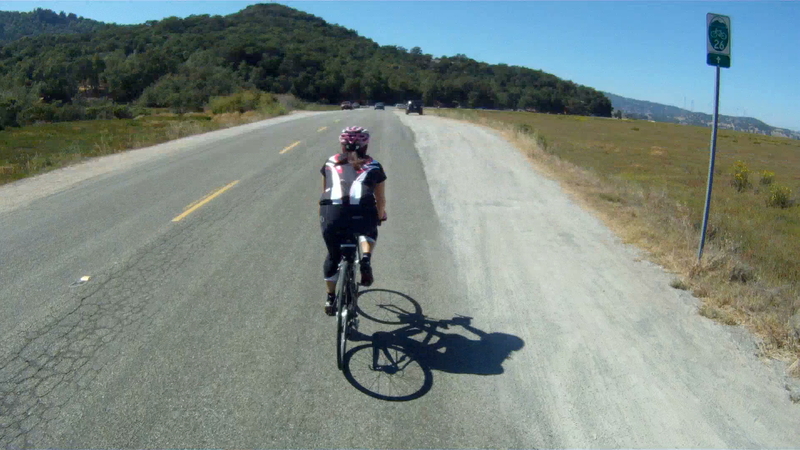 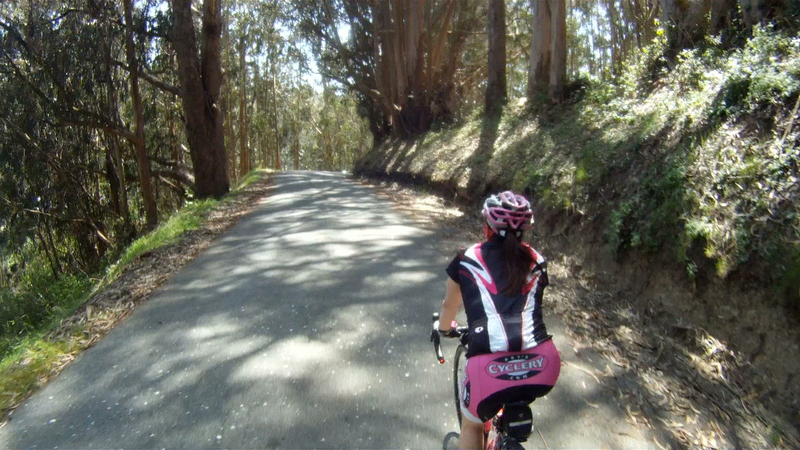 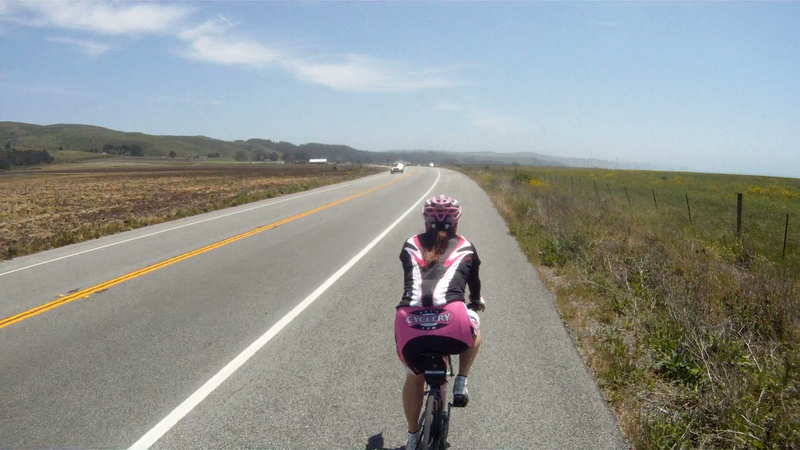 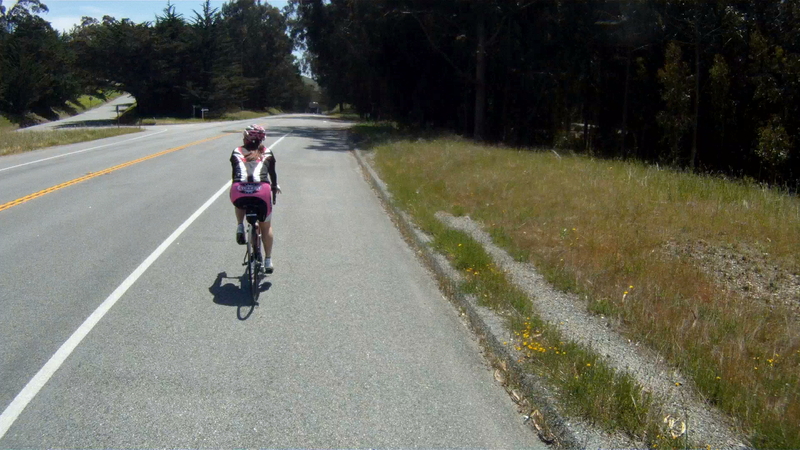 Continue through the next 3.5 miles of rolling hills through China Camp. 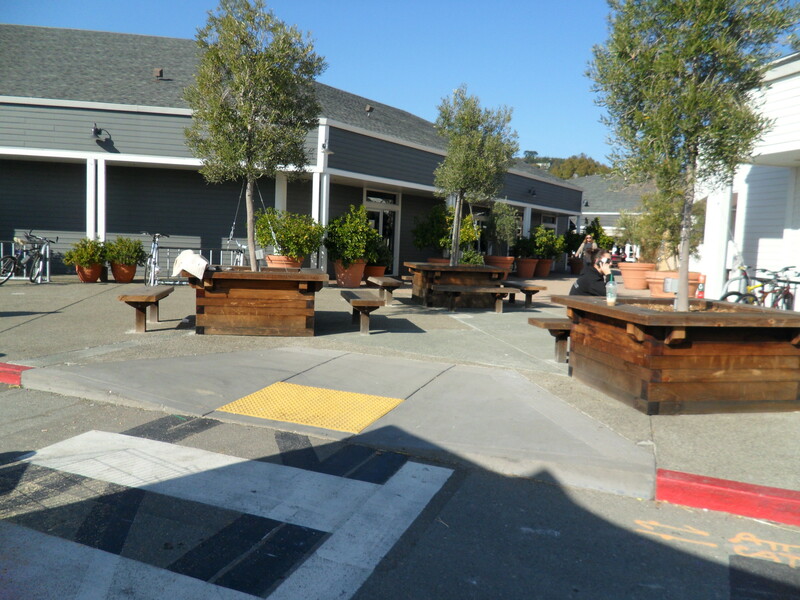 Click here for a map of China Camp. 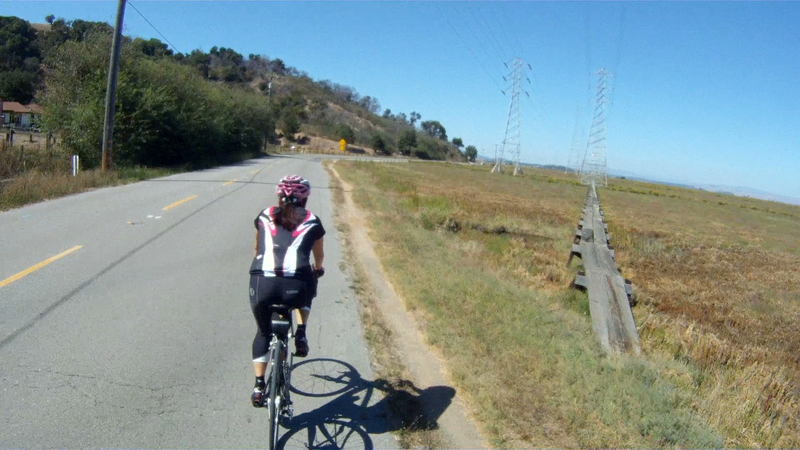 The first section of China Camp is a bit of a climb as you go by the entrance to the Shoreline Trail and mountain bike paths on your left. 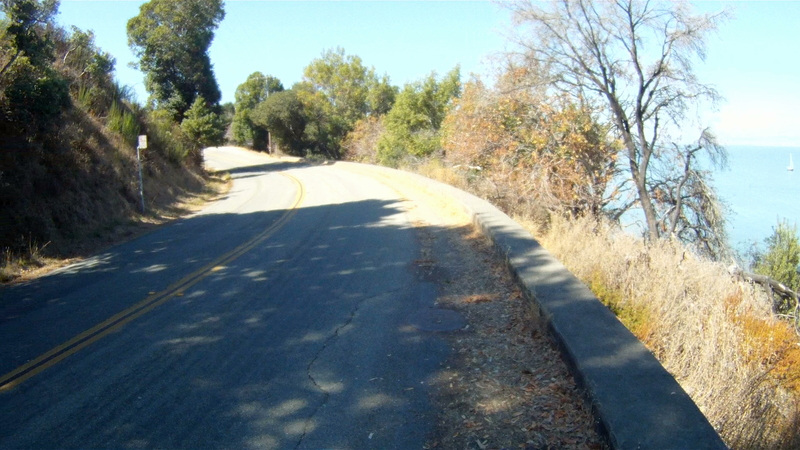 Your first descent takes you past China Camp Point as you round the sweeping left hand curve which leads to Five Pines Point. 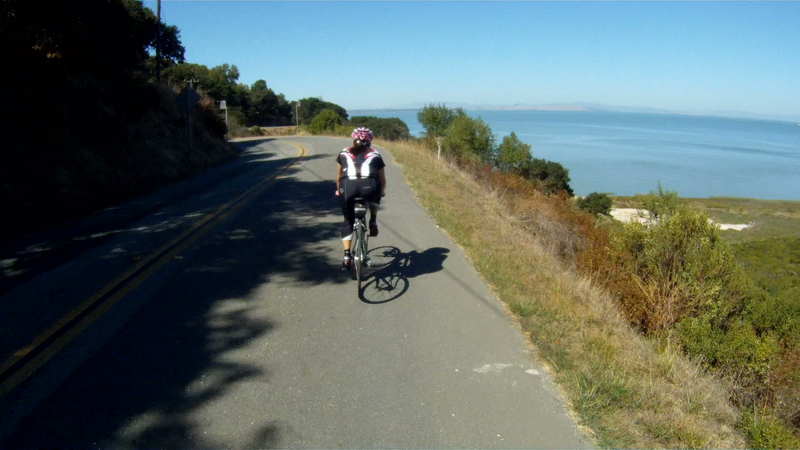 Rounding Five Pines Point takes you on a descent with views of San Pablo Bay. 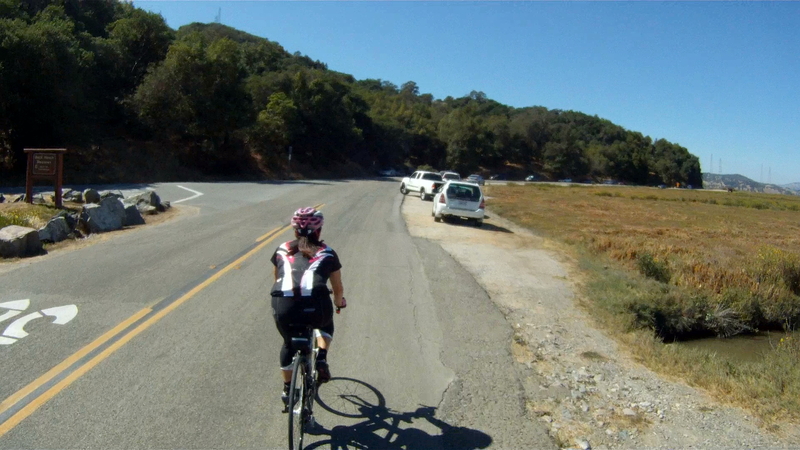 You’ll pass the Ranger Station on your right and then the road levels out for a short stint before climbing up to Weber Point where you can stop and take a short break. 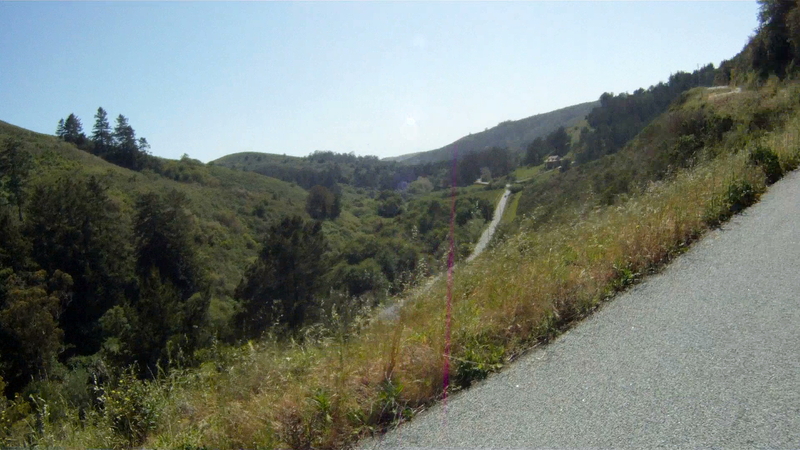 The hills keep coming as you make another climb past Buckeye Point and descend through a couple of “S” curves to the next section of flats and the first section of marshlands. 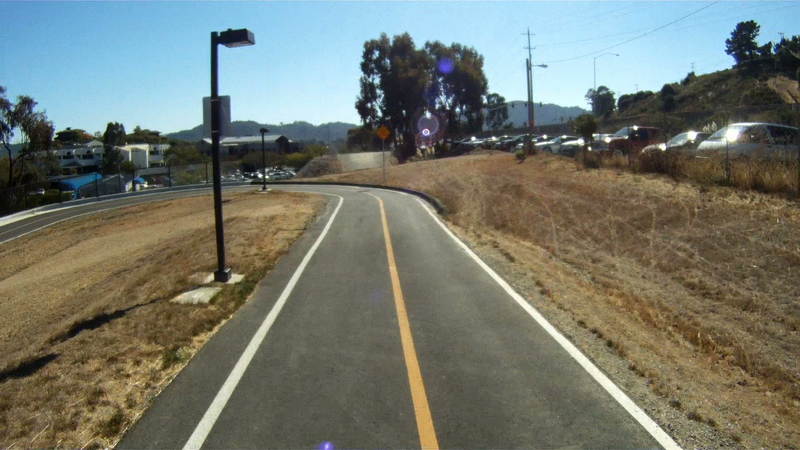 Continue past Chicken Coop Hill and another entrance to the Skyline Trail will be on your left. 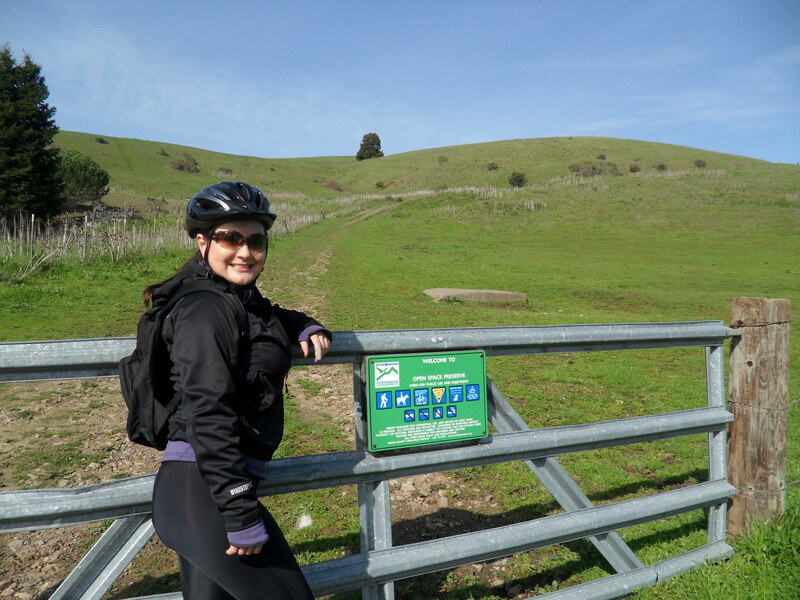 You’ll then pass by Bullet Hill with the Bullet Hill Trail entrance on your left and marshlands on your right. 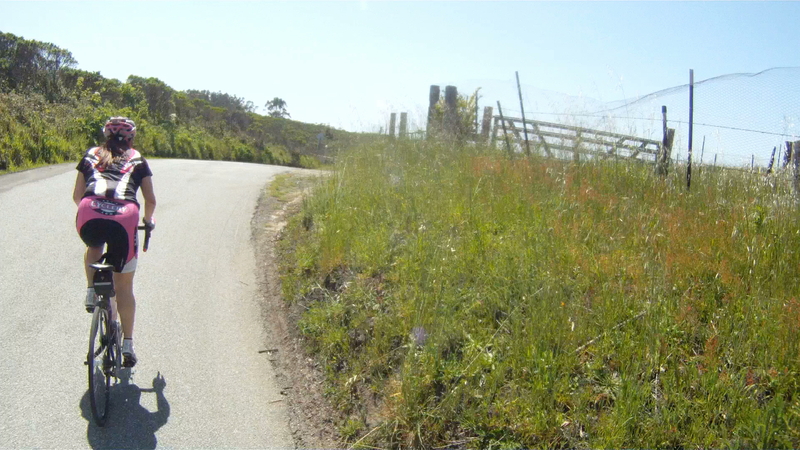 Another quick rolling hill takes you past Turtle Back Hill with another trail entrance on either side of the road. 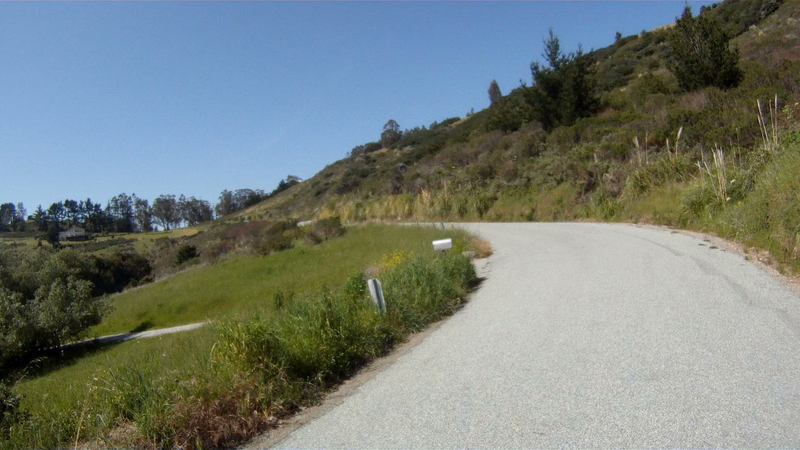 The flats after the descent from Turtle Back Hill takes you past the campground entrance on your left. 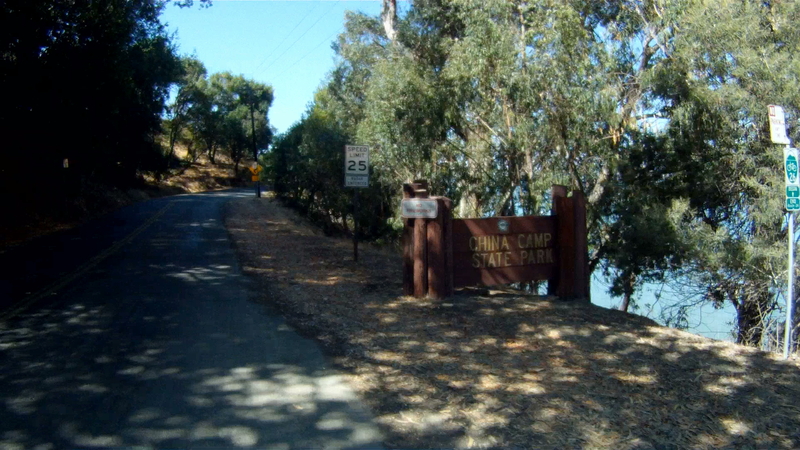 Once you past the campground entrance, you are just about out of the China Camp. 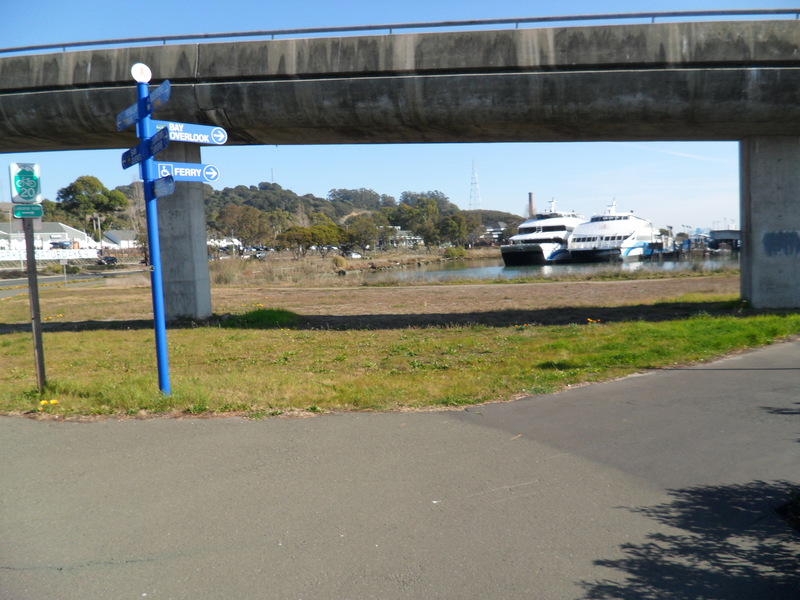 Another mile and a half of flats brings you up to the boat launch area, which is where we typically turn around. 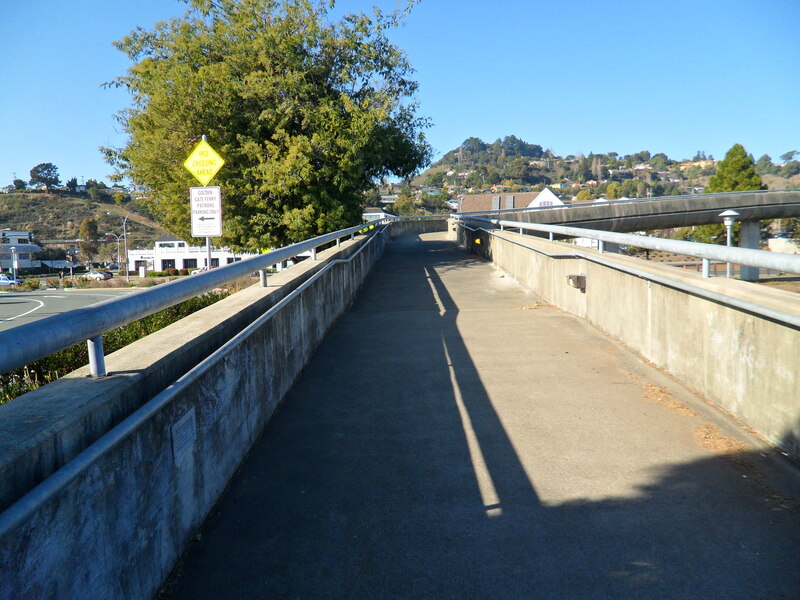 At this point, you have two options for returning back to San Rafael. 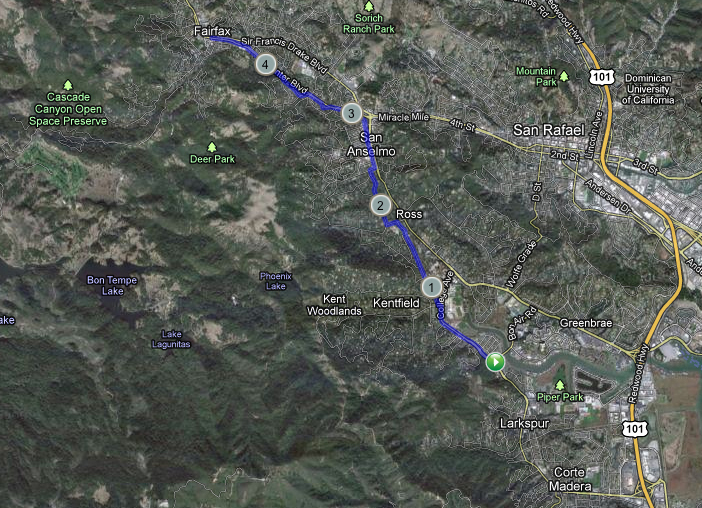 The first is to turn around and take the same route back to San Rafael. 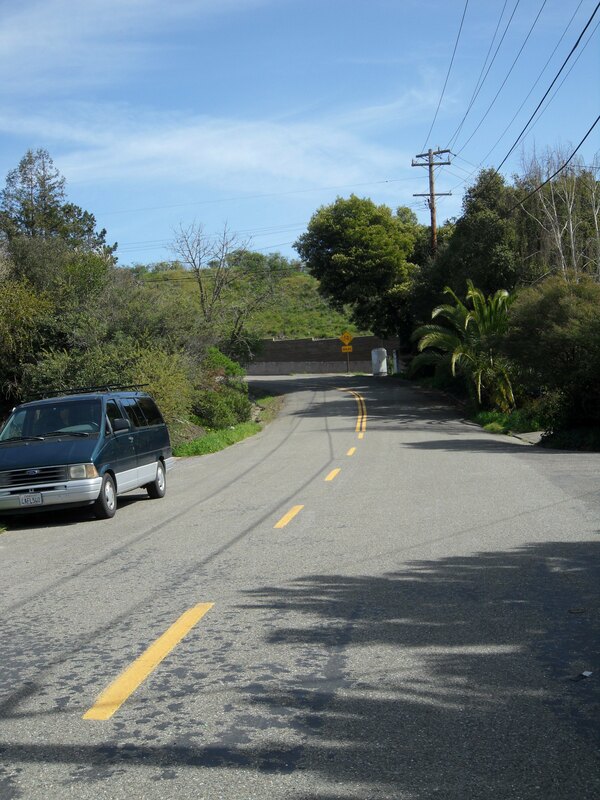 The second option is to continue along North San Pedro Rd. 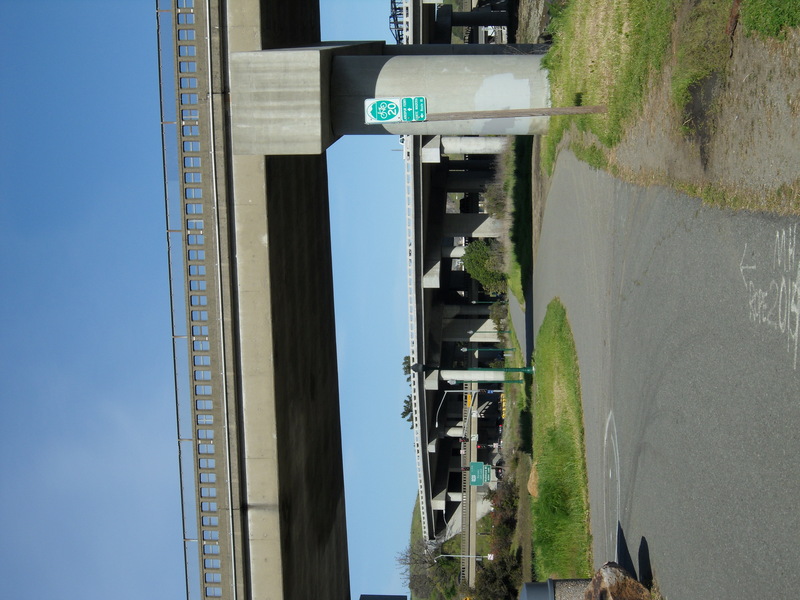 under US 101, make a left at Los Ranchitos Rd. 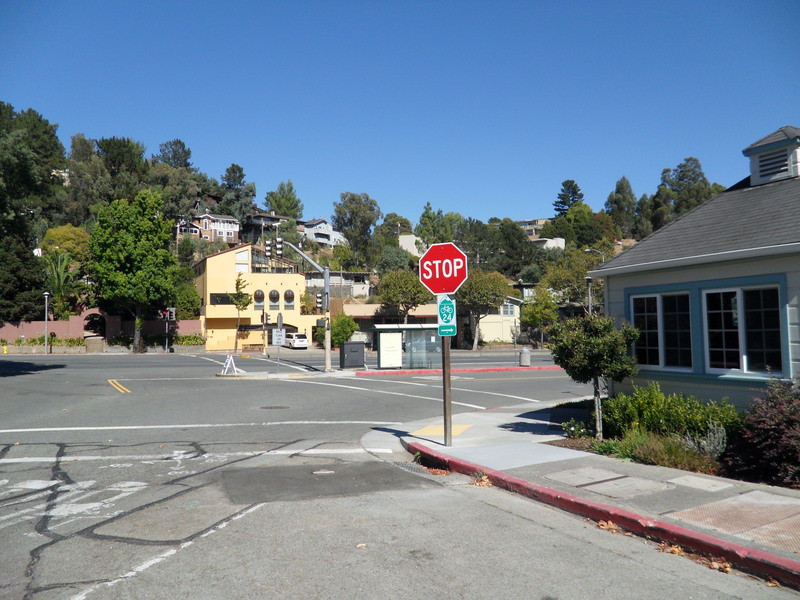 and Los Ranchitos until it become Lincoln Ave. Continue along Lincoln Ave. until you cross Second St. in San Rafael and then make a right onto Irwin St. You will then meet up with Let’s Grab a Beer or The Short Cut and head back to Larkspur. 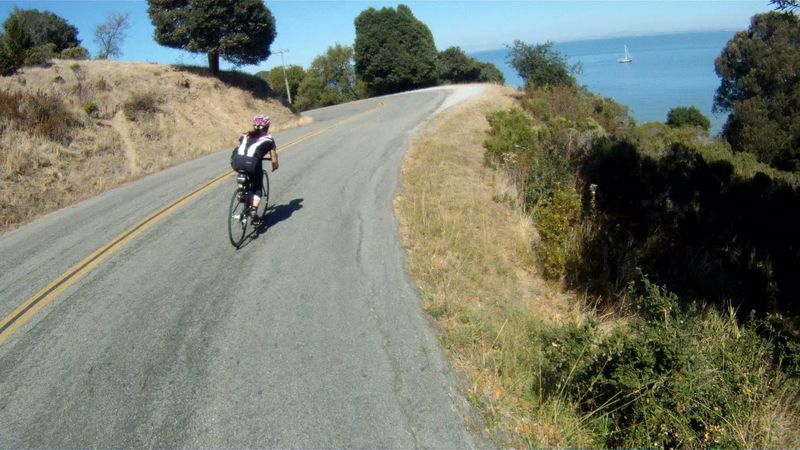 We typically turn around and take the scenic route through China Camp back to Larkspur. 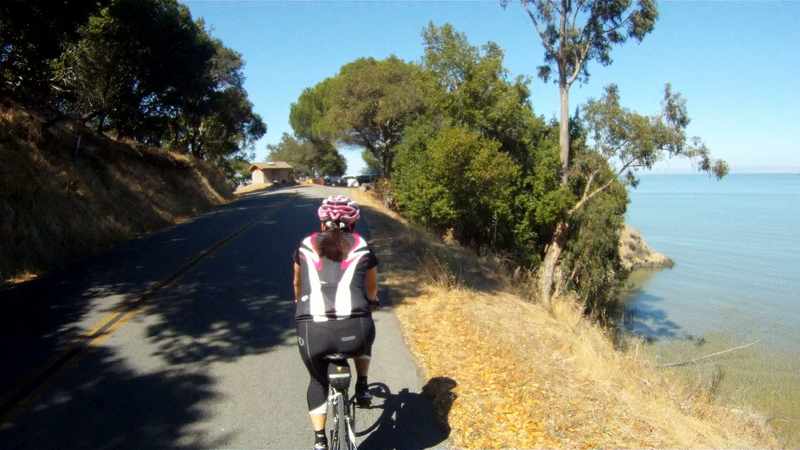 It’s a nice ride with a lot less traffic. 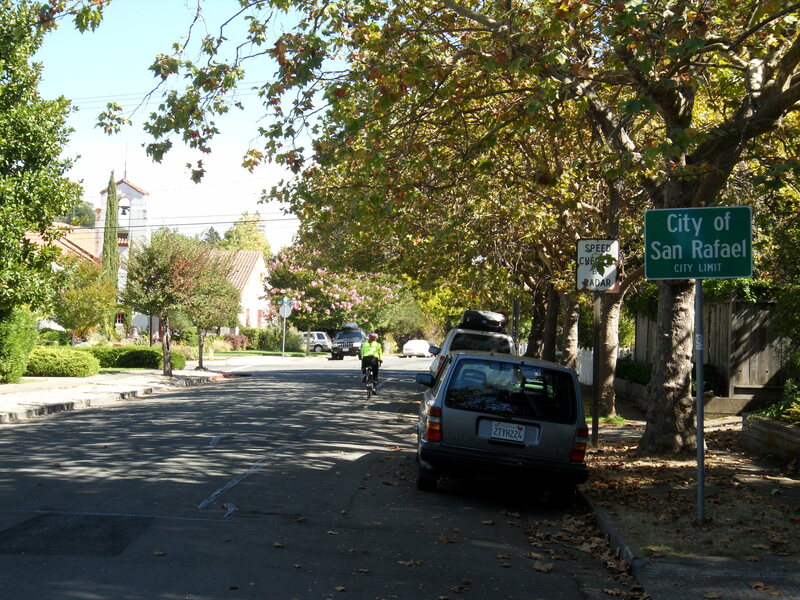 If you decide to turn around as well, follow the road and once you get to San Rafael, continue on Third Street until you reach Lincoln Avenue, then make a left on Lincoln Ave. 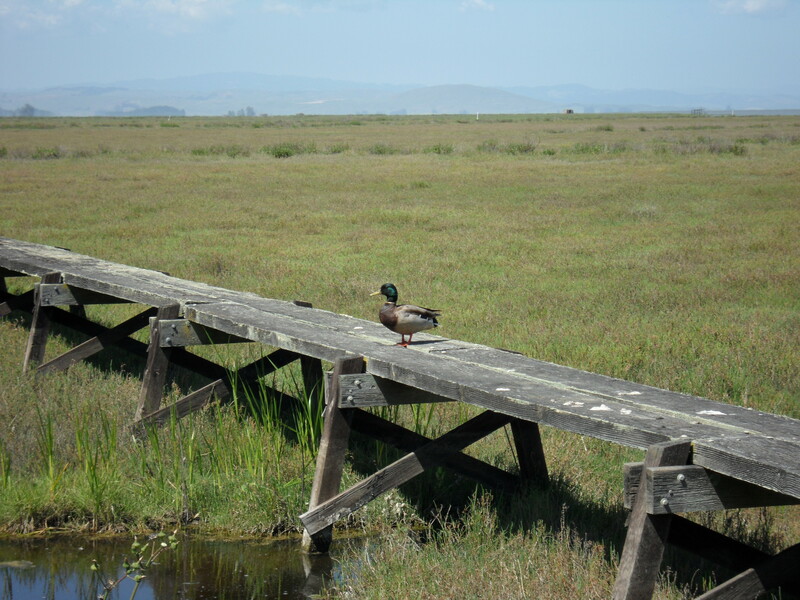 Follow Lincoln Ace. 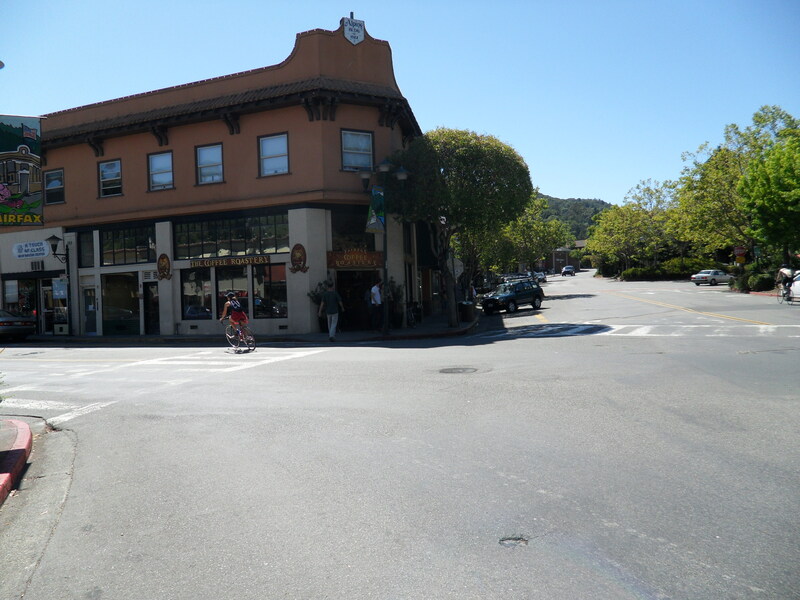 as described above and you’ll be back to Larkspur in no time. 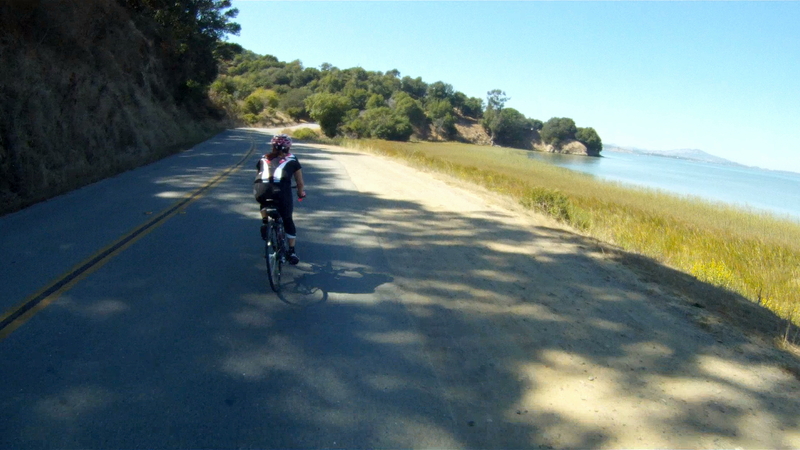 No matter if you are looking to add some extra miles, or have just never been past San Rafael, China Camp is a great place to cycle. 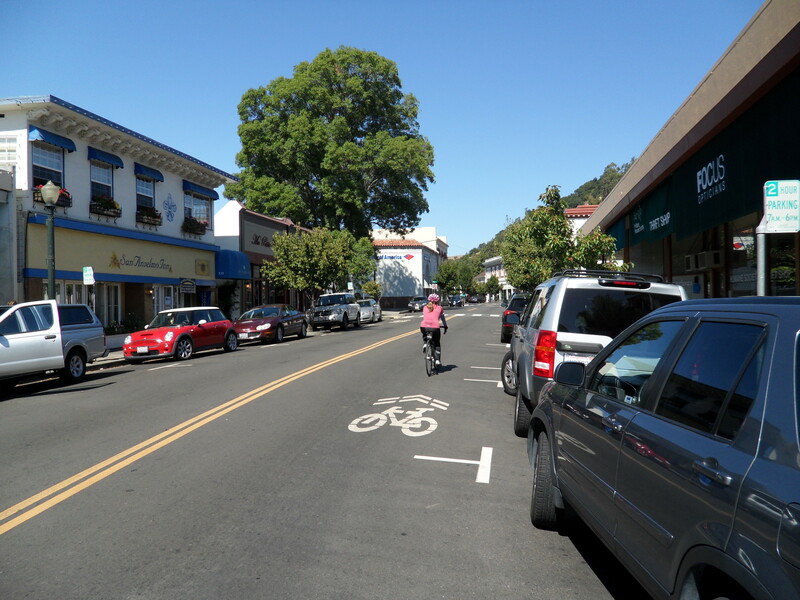 San Rafael is the gateway to China Camp and a great way to return to the Larkspur Ferry from Fairfax or San Anselmo. 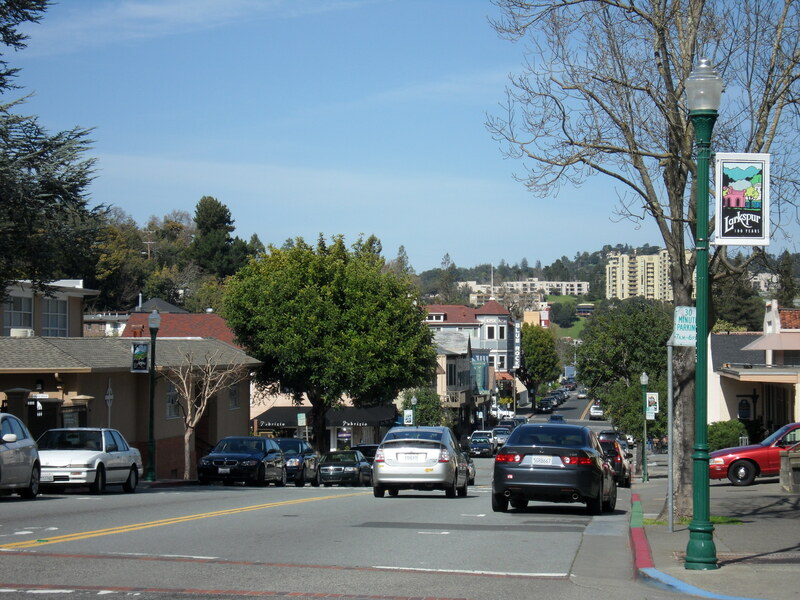 San Rafael is not for the faint of heart! 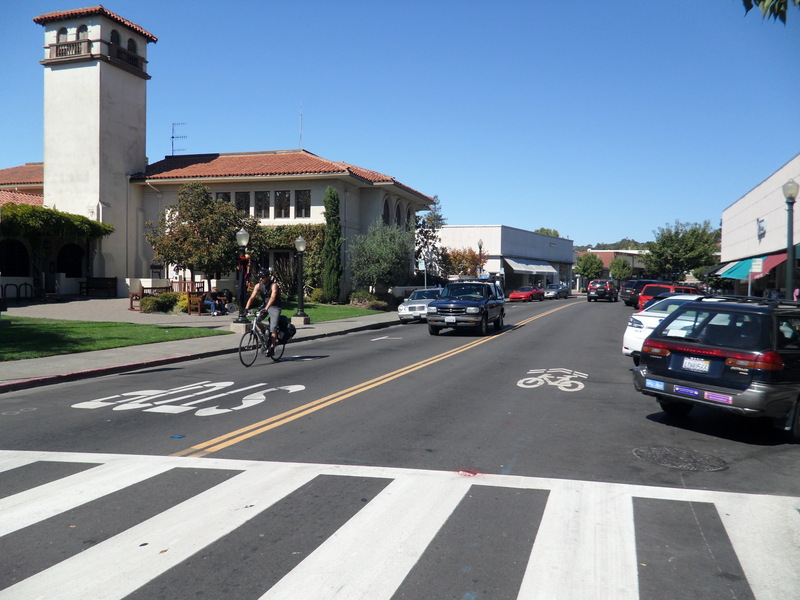 The high traffic environment along 2nd Street requires superb bike handling skills and nerve as there are no bike lanes and the drivers see you as an intruder with no right to the road. 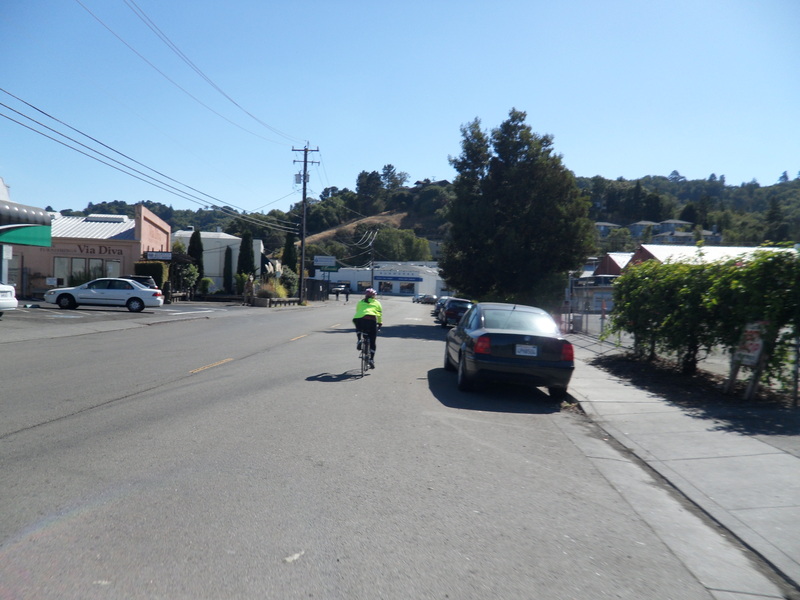 If you are not ready for the intense traffic, a slower alternate route through San Rafael is also available. 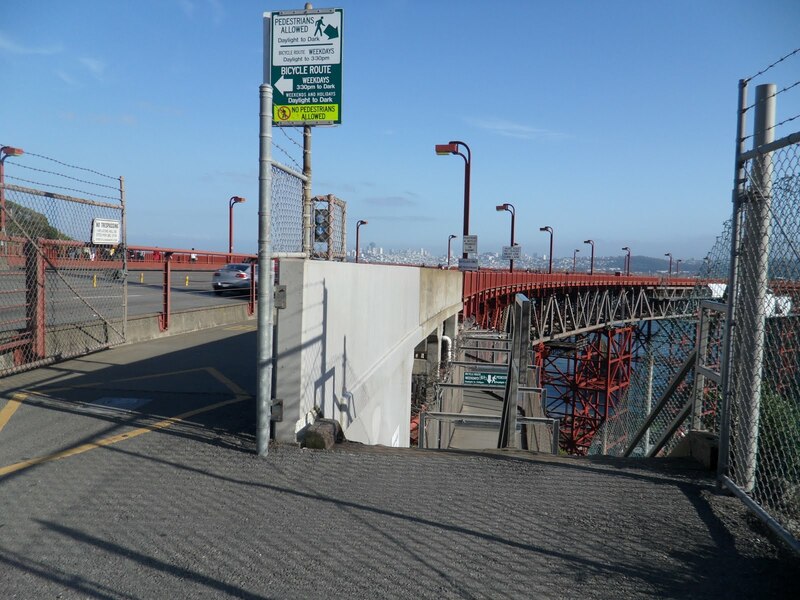 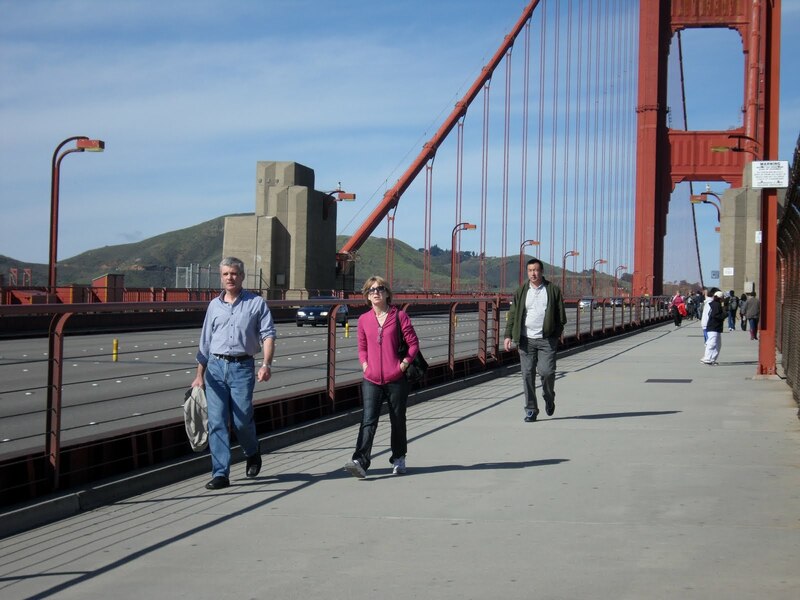 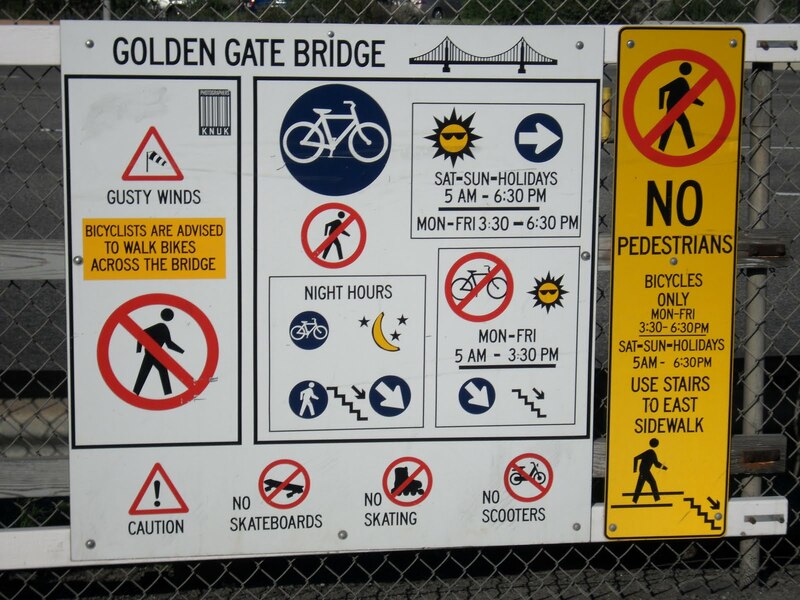 -Distance from San Francisco Ferry Building (see Golden Gateway Trail): 44.39 miles; Distance from Marin Crossroads: 30.96 miles; Distance from Sausalito: 34.98 miles; Distance from San Anselmo: 6.37 miles. 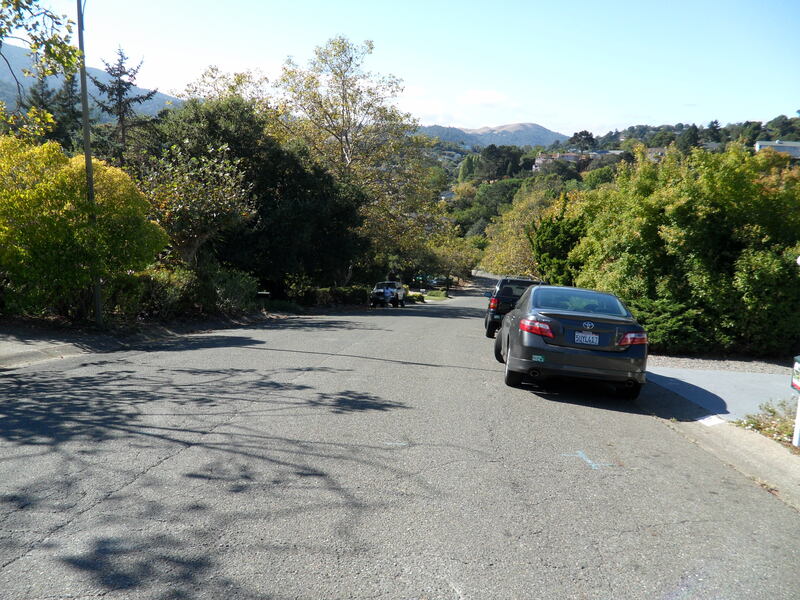 Difficulty: Overall, this is not a difficult route, although the traffic is a bit intense through San Rafael along 2nd Street and the last descent along The Dragon’s Spine is quite fast with a short stopping distance at the end. 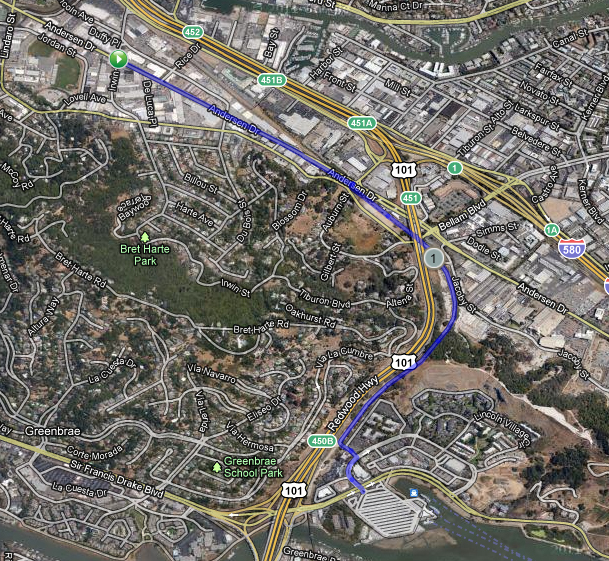 The two alternate routes provide easier alternatives to both potential obstacles. 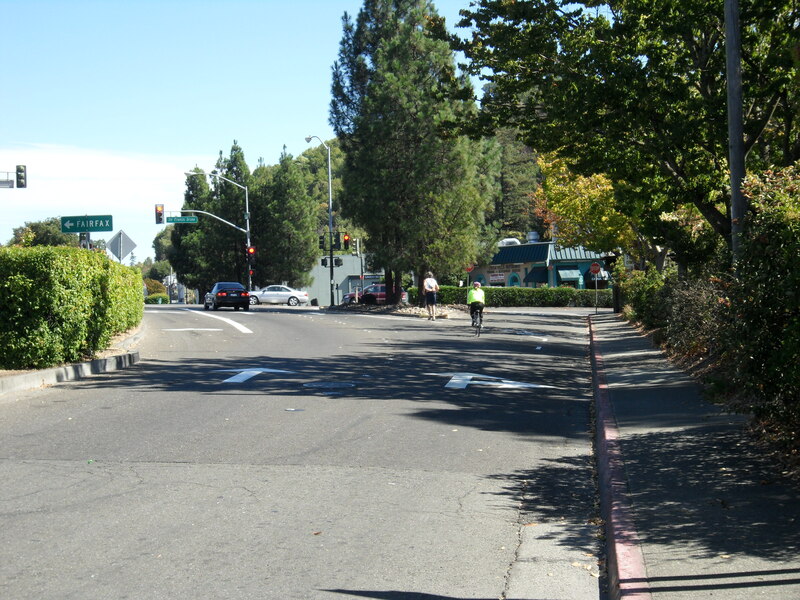 Make a right onto Center Boulevard, following Route 24, follow Center Boulevard across Sir Frances Drake Boulevard. 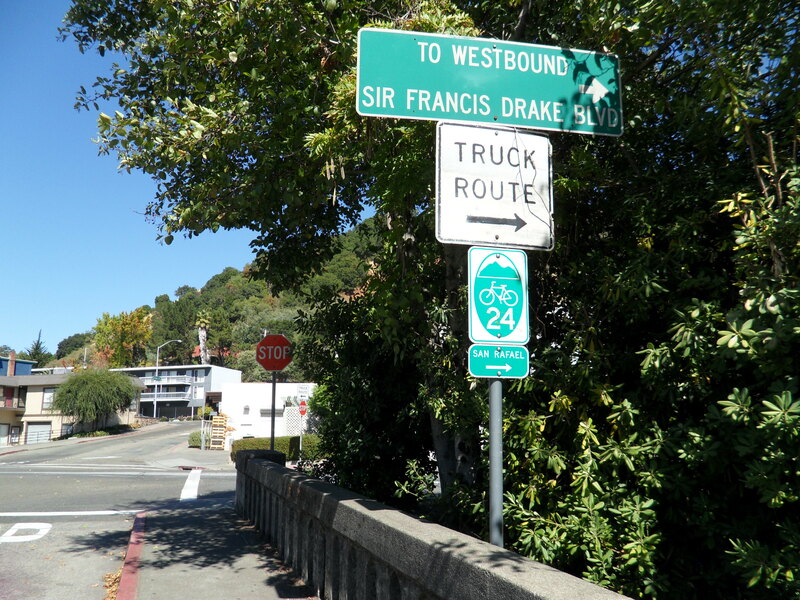 Just after crossing Sir France Drake Boulevard, keep following Route 24 and make the jog to the right off of Center Boulevard and on to Greenfield Avenue. 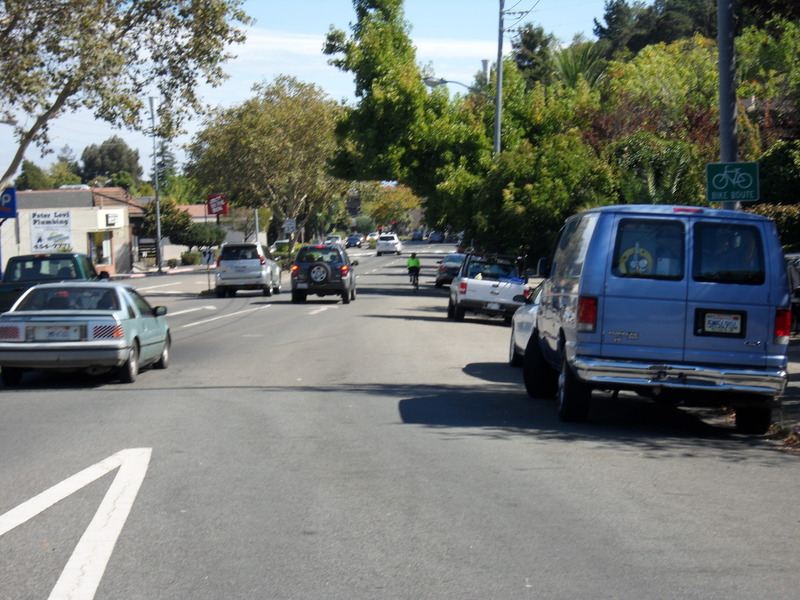 Follow along Greenfield Avenue until just before it reaches the stoplight, make a right along West End Avenue at that point. 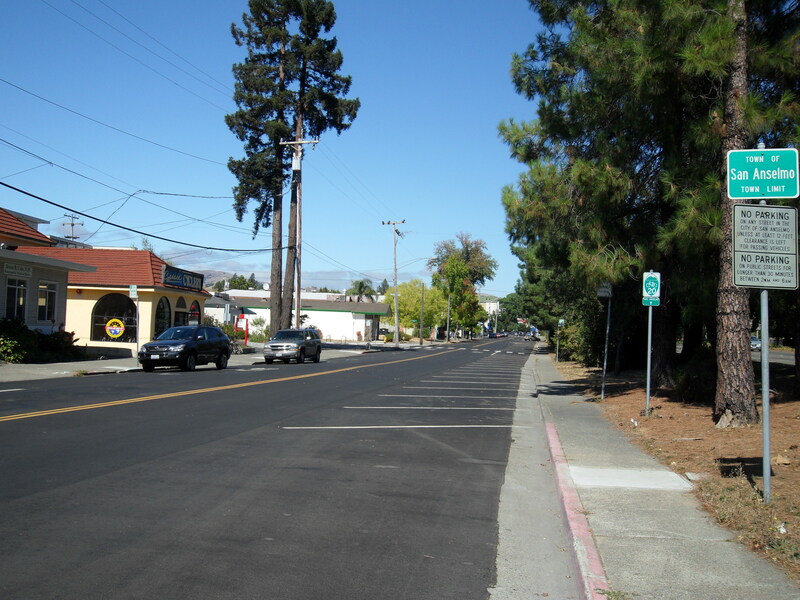 Follow the short West End Avenue until it meets with 2nd Street. 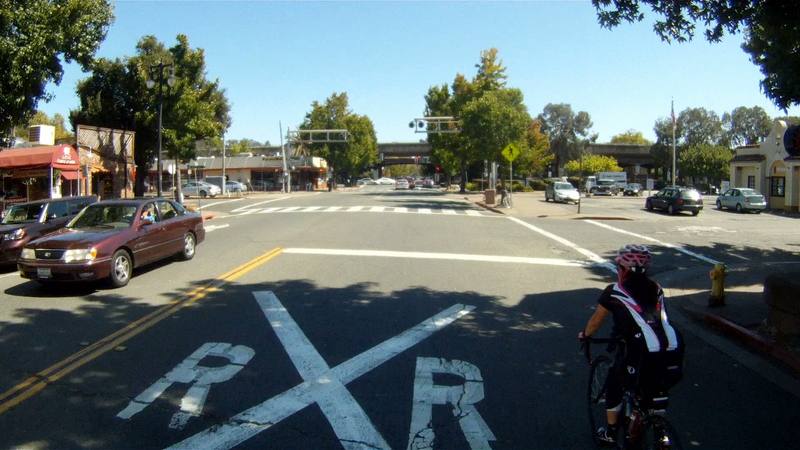 At this point you have two options for going through San Rafael. 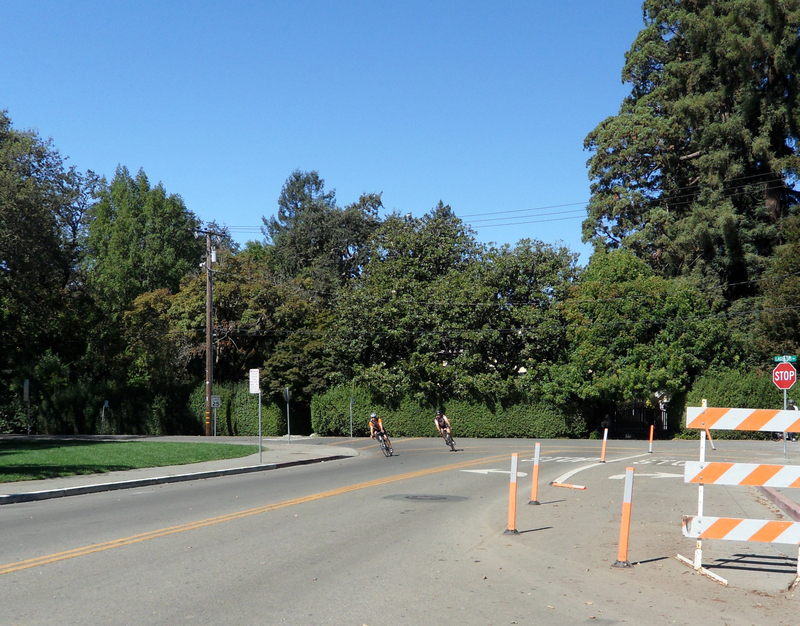 The shorter, more direct route is to merge with 2nd Street and follow along 2nd Street all the way to Lincoln Avenue. 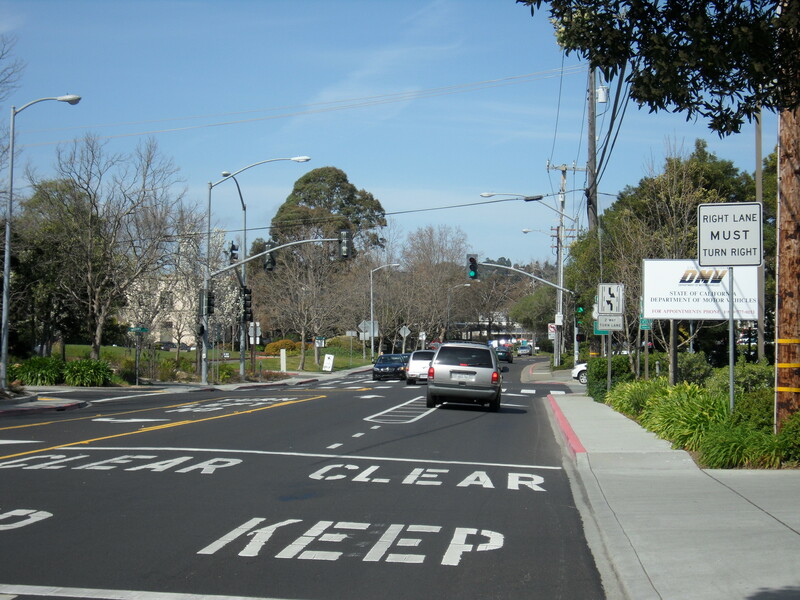 The slower, less intense alternate route, above, is to cross 2nd Street and take 4th Street all the way to Lincoln Avenue and make a right. 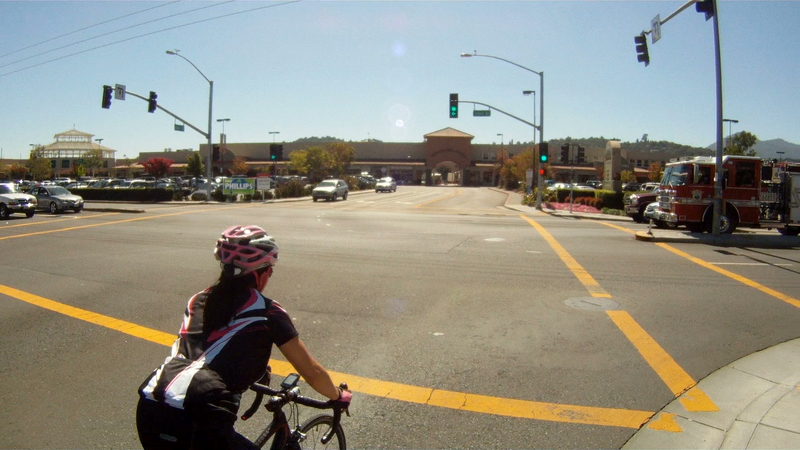 This route has a bit less traffic, but more stop lights. 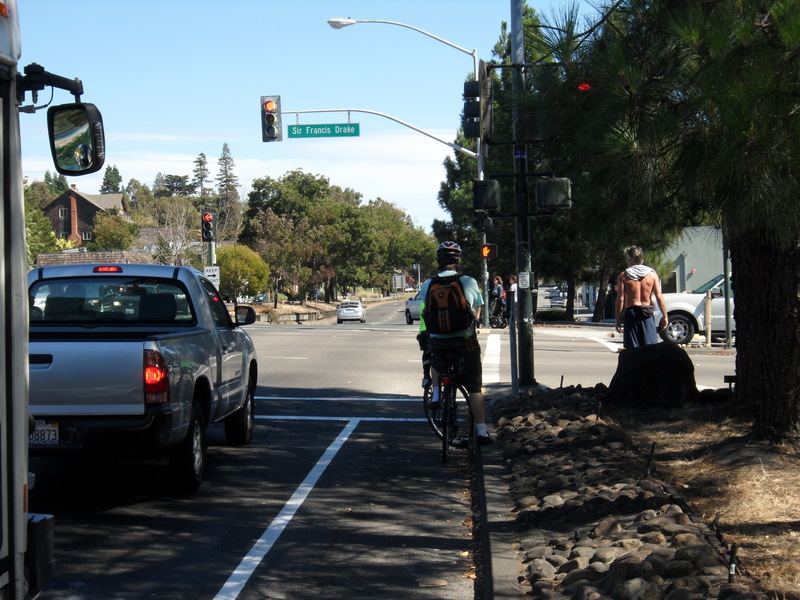 Neither route has a dedicated bike lane, but the traffic is a bit more friendly on 4th Street. 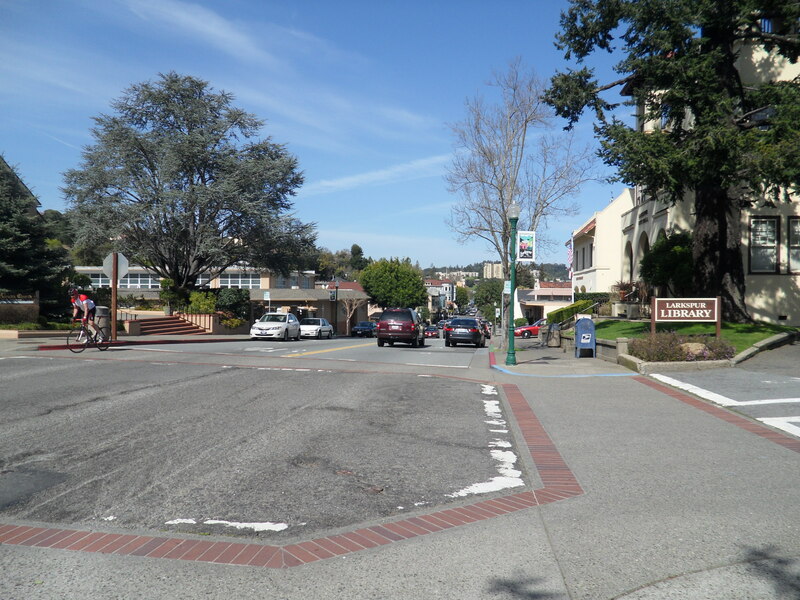 Once you reach Lincoln Avenue, turn right. 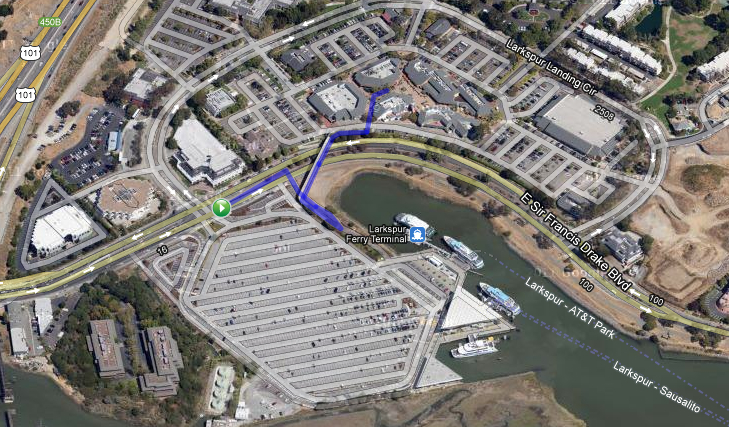 Follow Lincoln Avenue until it reaches Irwin Street, then make a right on Irwin Street. 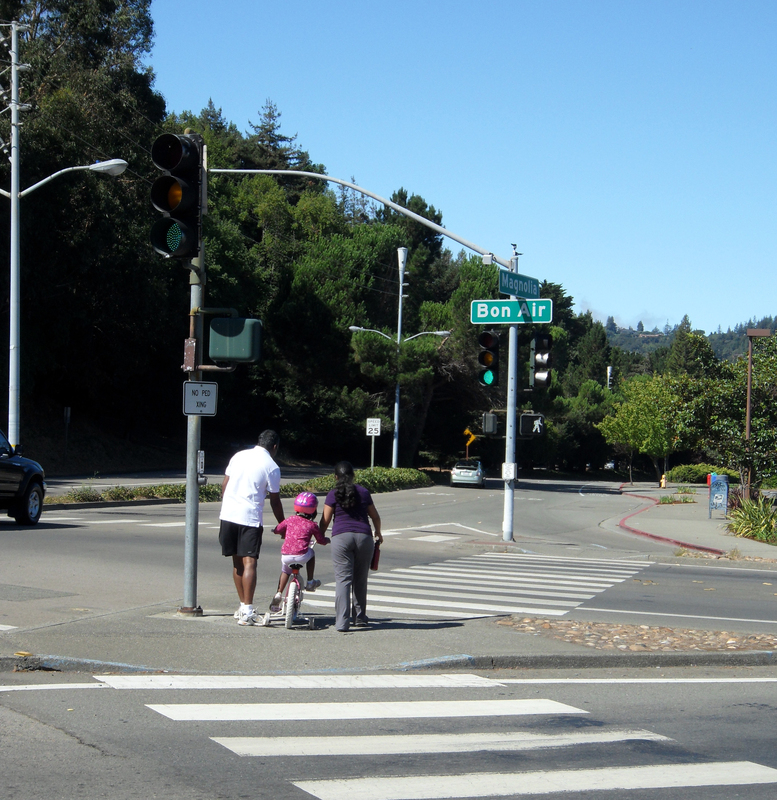 The next traffic light is at Anderson Drive, which is your next decision point. 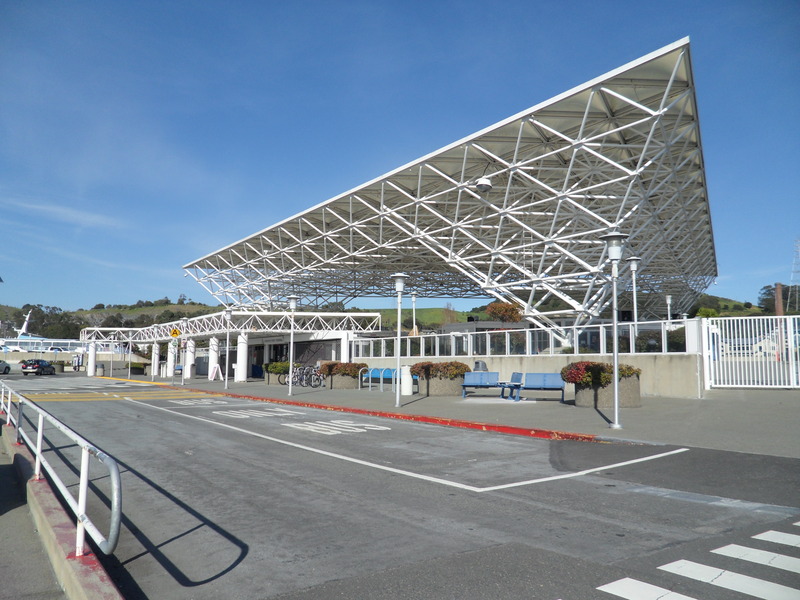 There are distinct options for getting to the Larkspur Ferry from this point, the first is our favorite, while the second is a good option if you are short on time, or have already had a long ride. 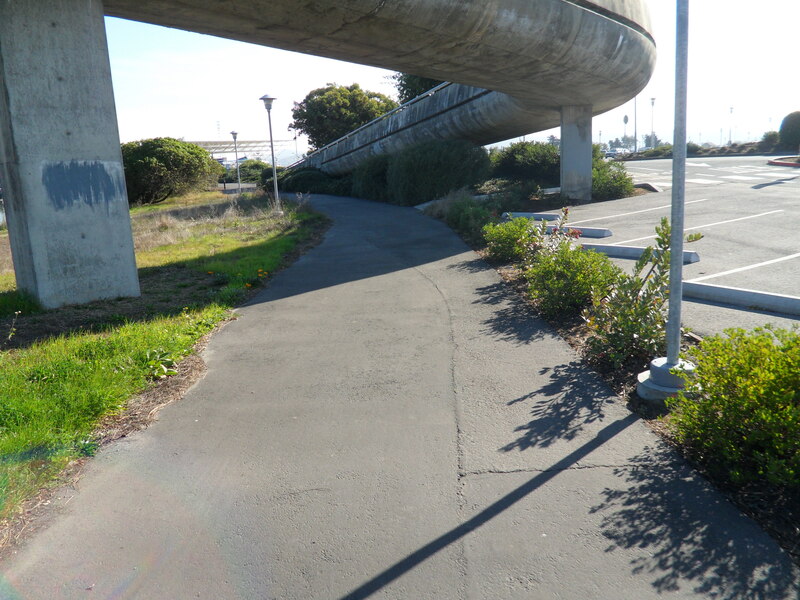 To follow The Dragons Spine, go straight through the light at Andersen Drive and continue to follow Irwin Street. 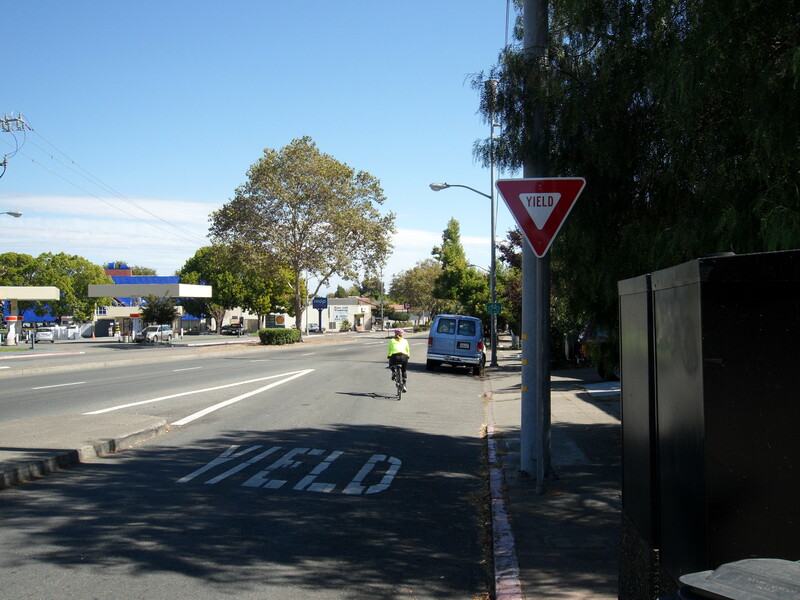 There is a stop sign at the intersection with Woodland Avenue, follow Irwin Street straight through the stop sign. 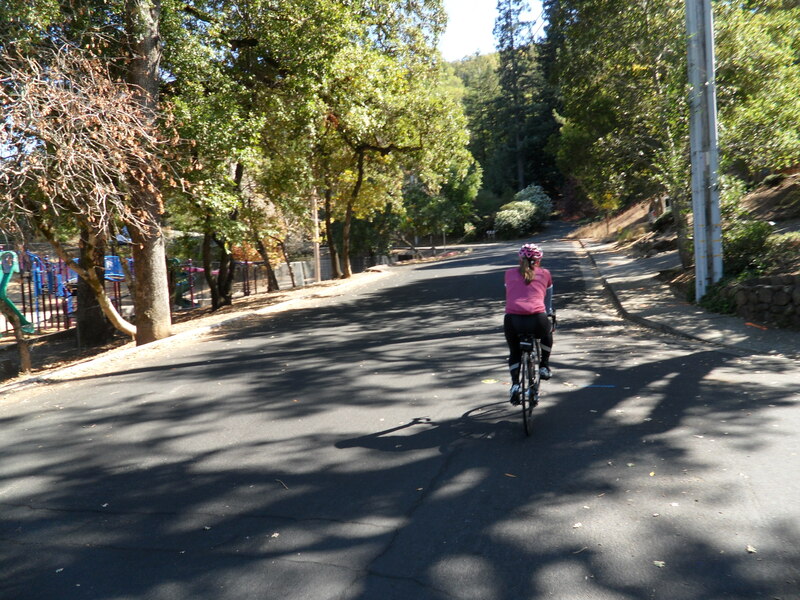 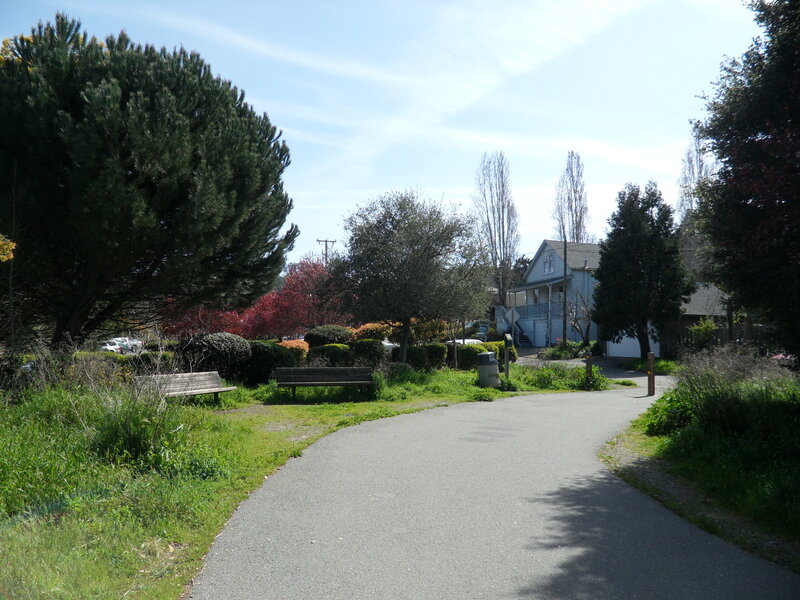 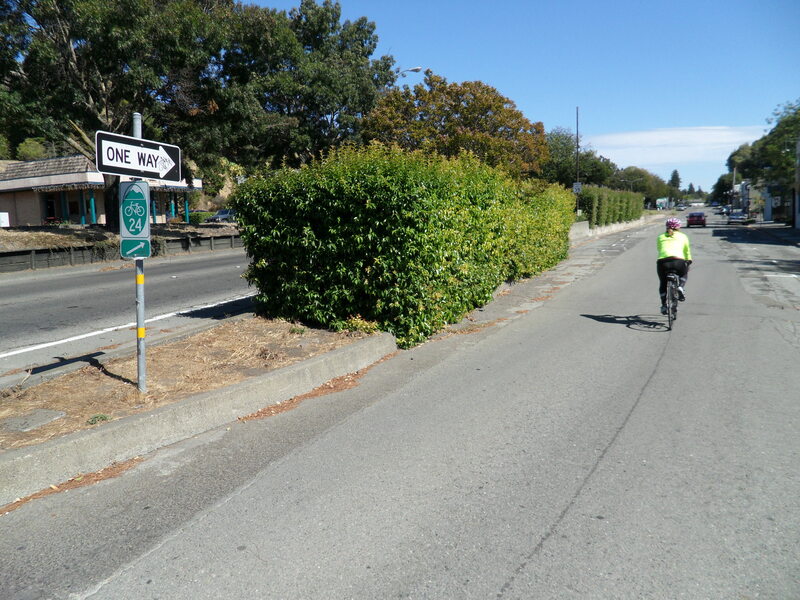 You will start a climb along Irwin Street as it winds its way through a residential neighborhood and by Bret Harte Park. 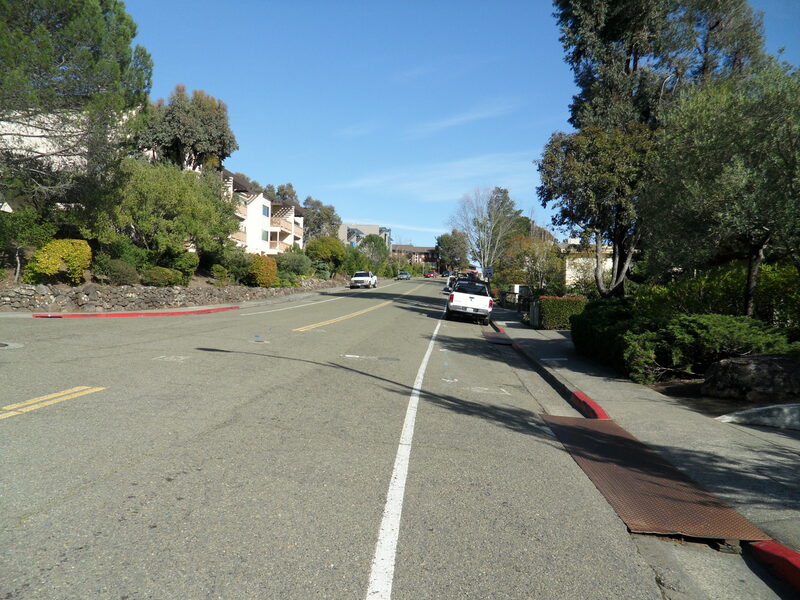 Along the climb Irwin Street becomes Tiburon Boulevard (although you will notice). 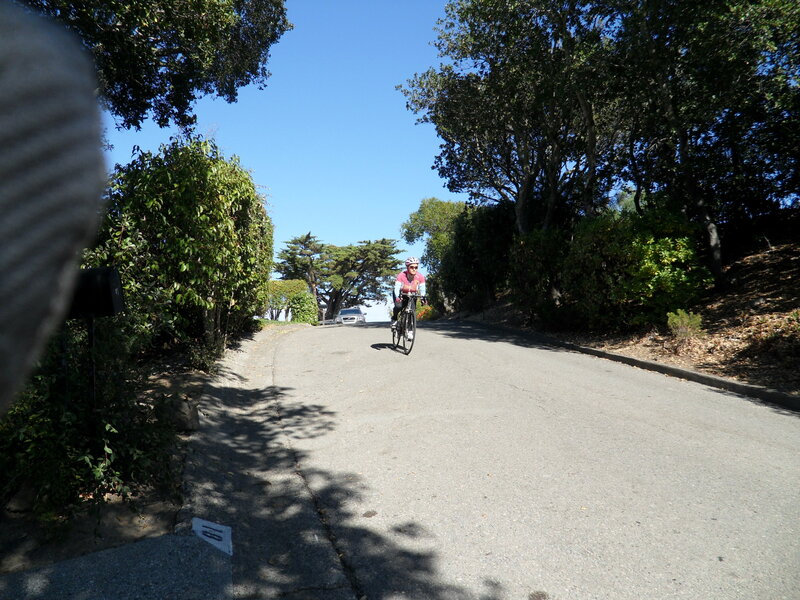 After 5 to 7 minutes of climbing, it then becomes Via La Cumbre and the fast rolling portion of the ride begins. 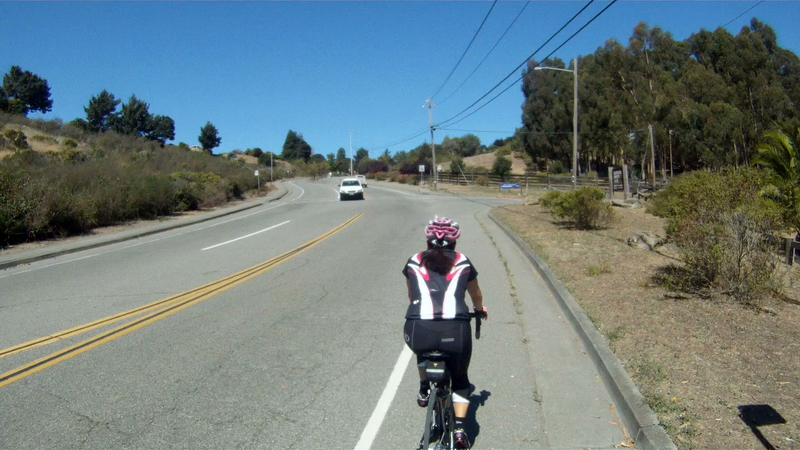 Via La Cumbre will skirt along the side of a hill with views of Larkspur and US-101 below. 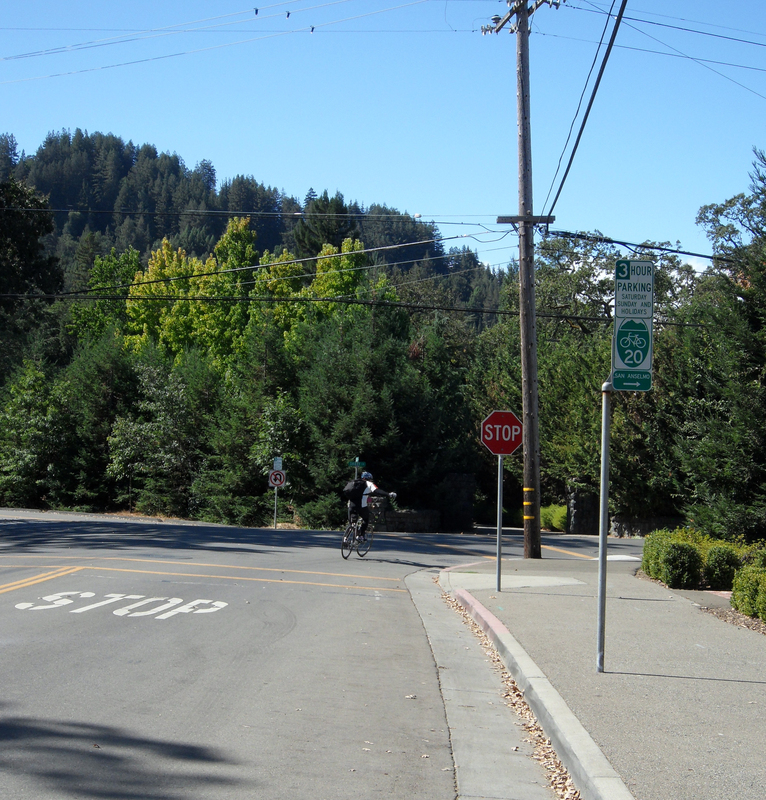 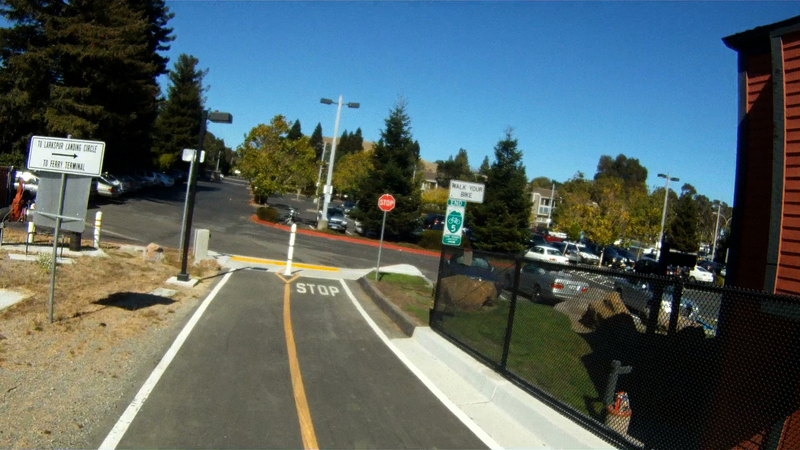 After another short climb you will pass the intersection with Bret Harte Drive. 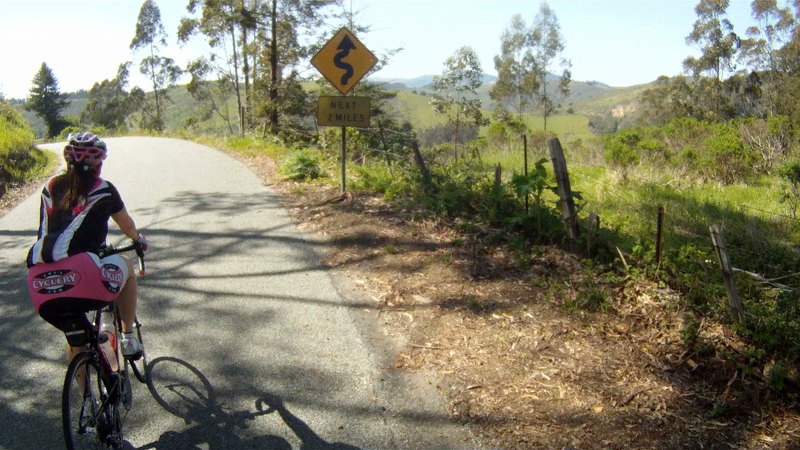 Stay to the right and stand for the short, but steep climb as Via La Cumbre splits into parallel one way roads. 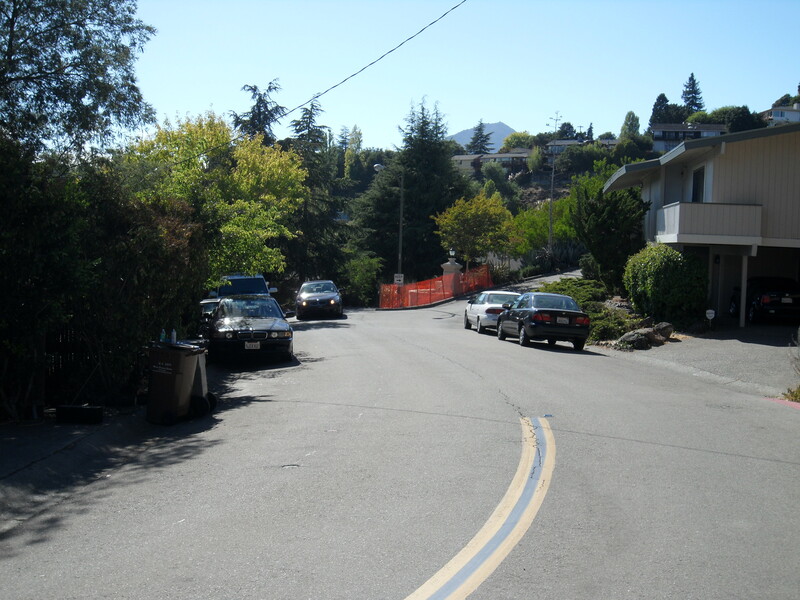 This narrow residential road has cars parked and driveways to your right, stay in control and watch for cars as you descend the next hill which will roll into another steep climb. 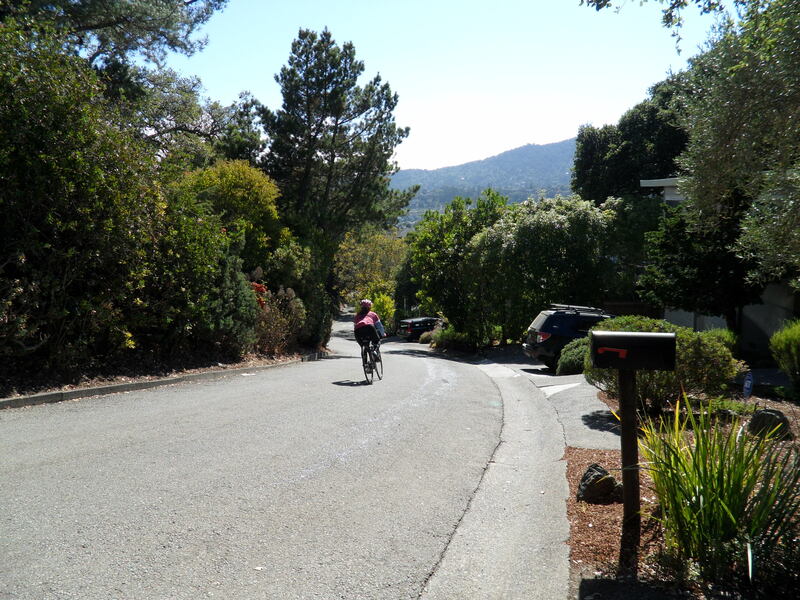 Follow the road as it continues to wind through the neighborhood to the first Stop sign. 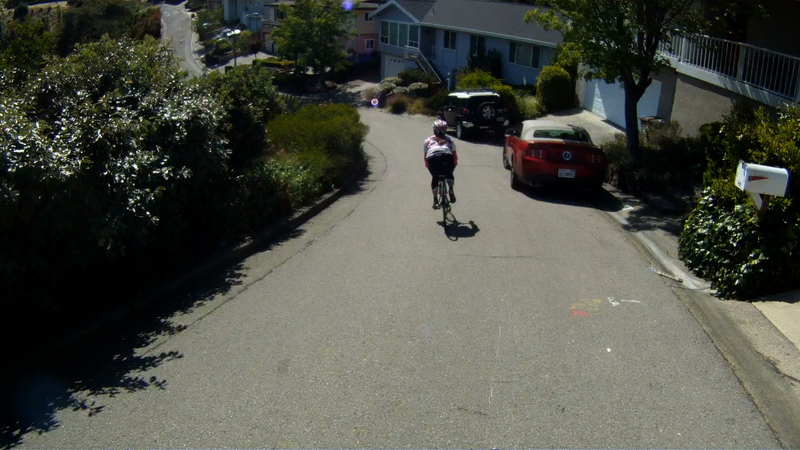 Go straight through the stop sign and climb the next small, steep hill. 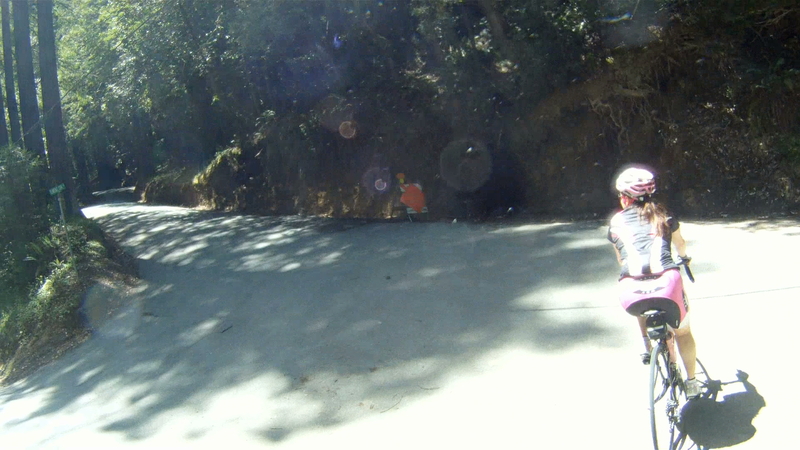 Then when the coast is clear let it rip and see what you can clock on the radar at the bottom! 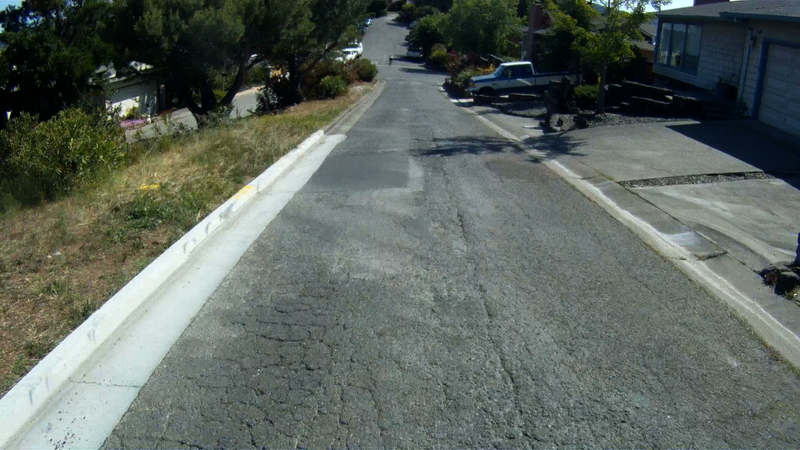 Stay vigilant though, as cars may start to back out of their driveways around the corner at the bottom of the run. 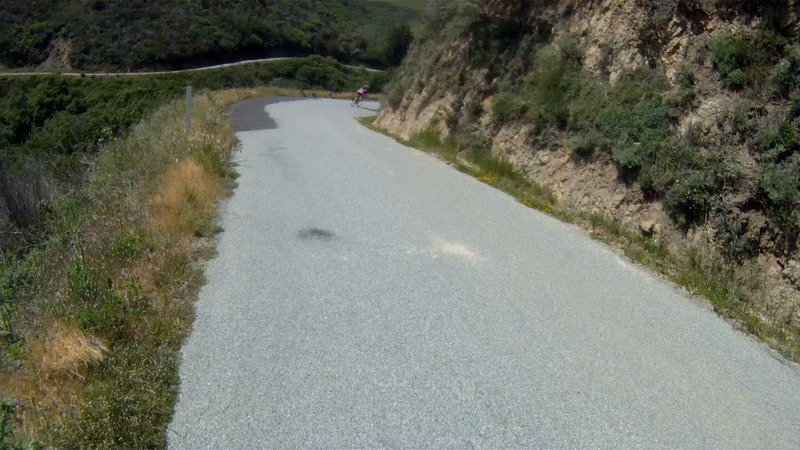 Then one last climb and a wide open “Wee Fast Fun” hill to go. 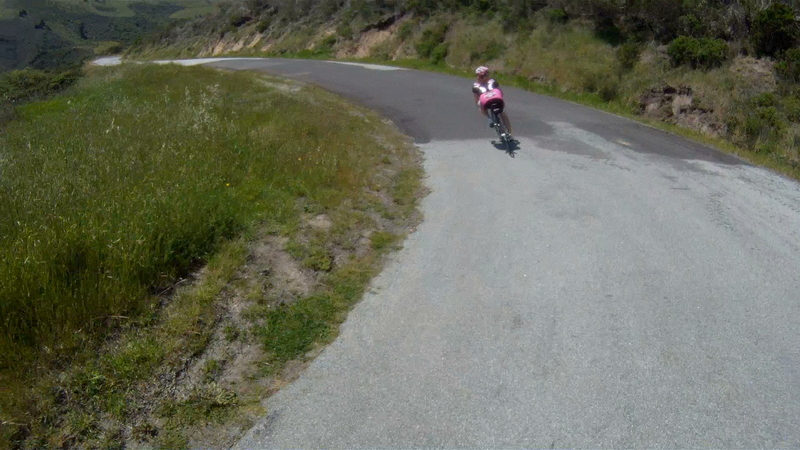 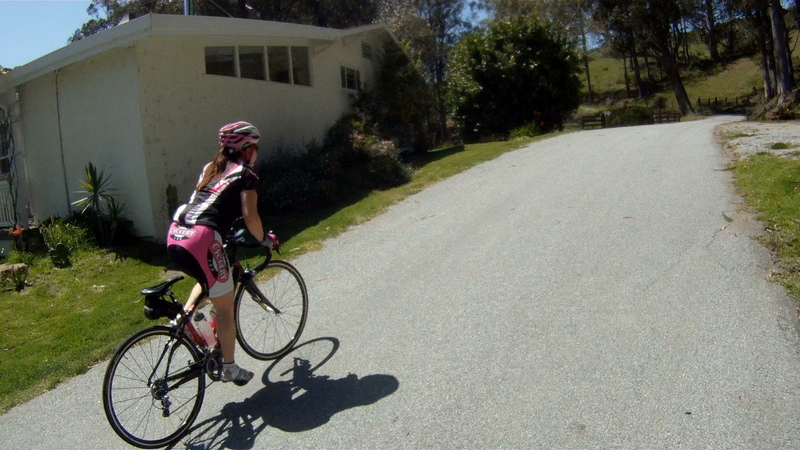 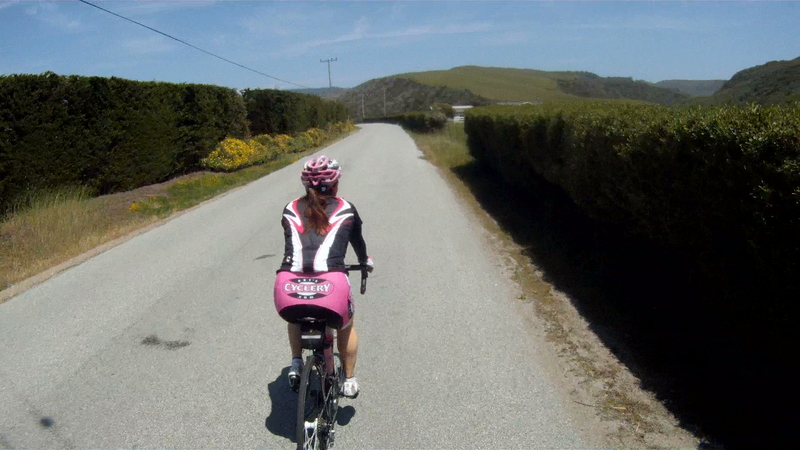 Again, wait for it to be clear and then follow the Pink Bomber’s lead and fly down the last of the descents! 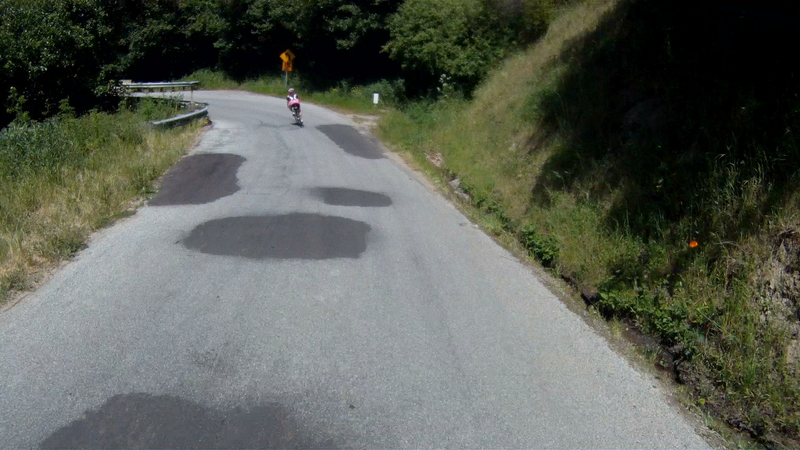 The next Stop sign is at the bottom of the hill just after the road starts to flatten out. 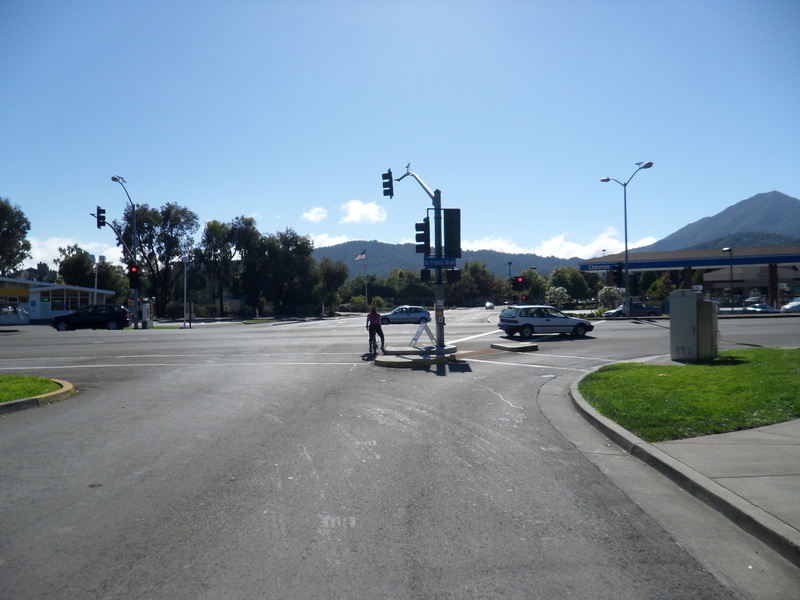 Be ready to stop at that point as Via La Cumbre intersects the busy Eliseo Drive. 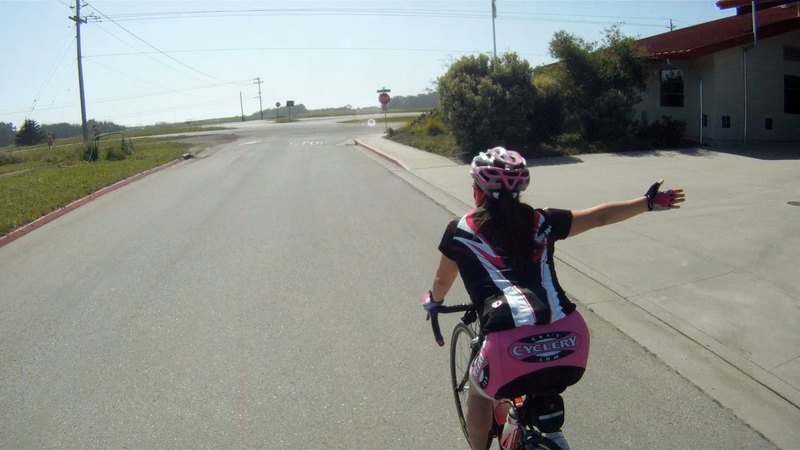 Turn left at Eliseo Drive. 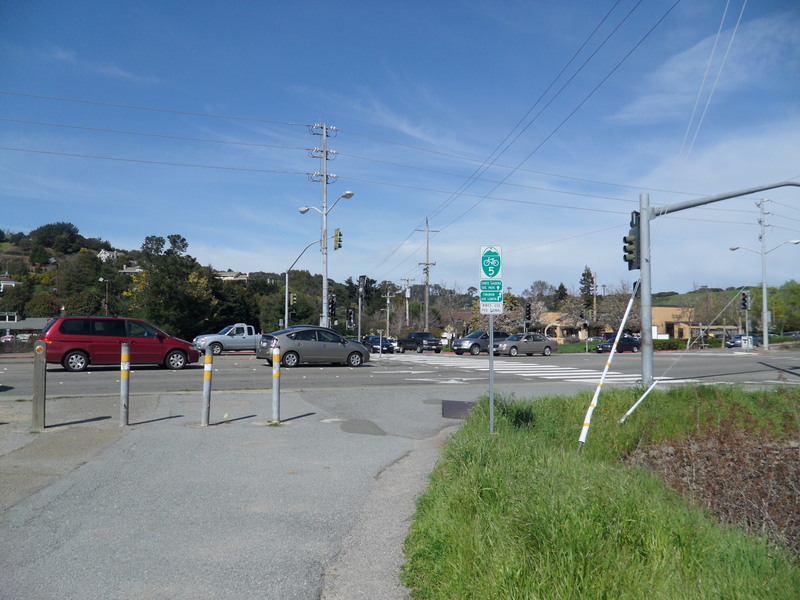 Eliseo Drive intersects Sir Frances Drake Boulevard at the stoplight. 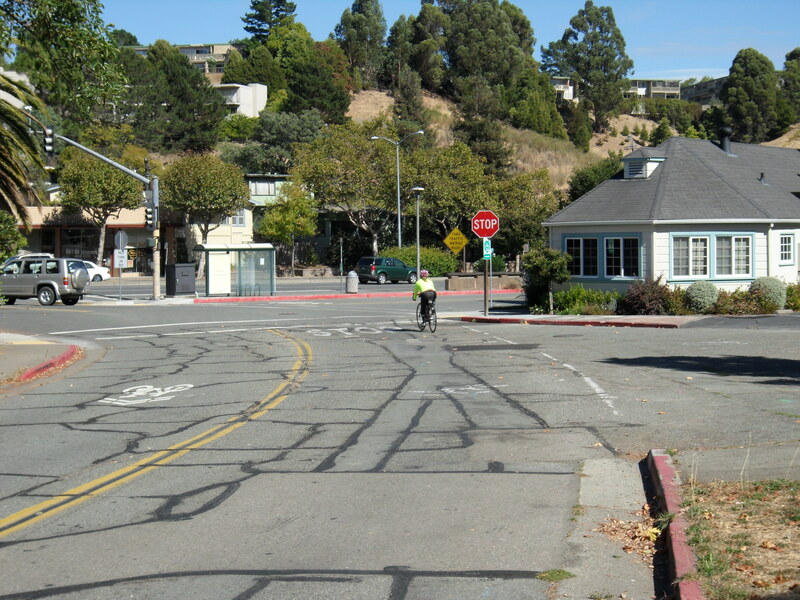 Keep following Eliseo Drive straight through the intersection to the next stop sign. 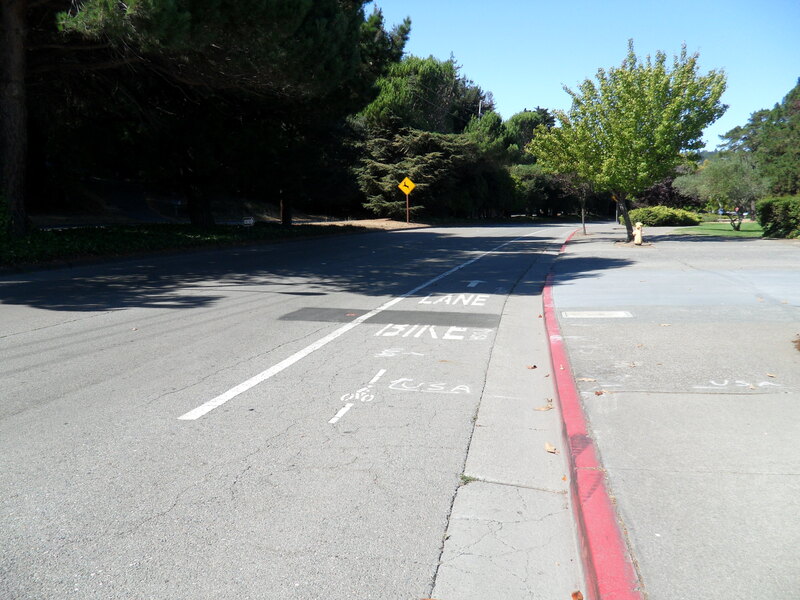 Make a left onto the sidewalk and follow the path into Niven Park. 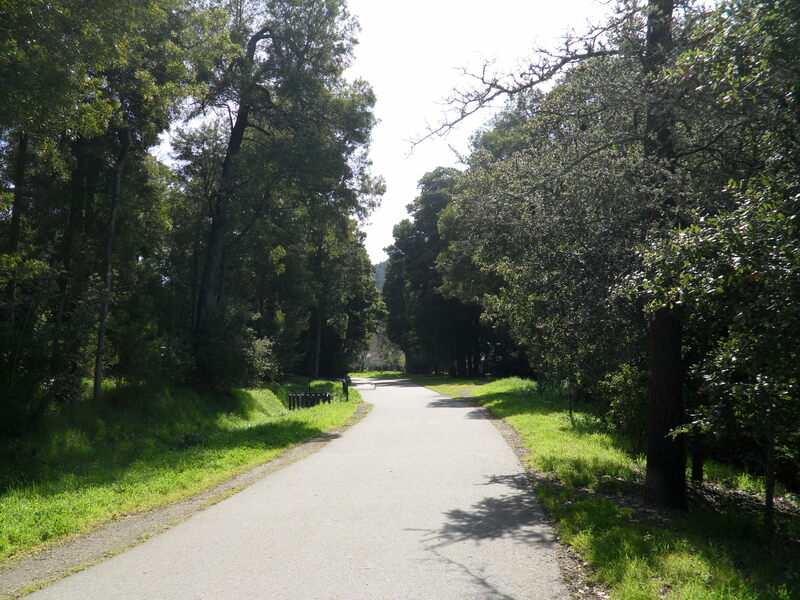 Keep following the path through the park, but watch for dogs off leashes. 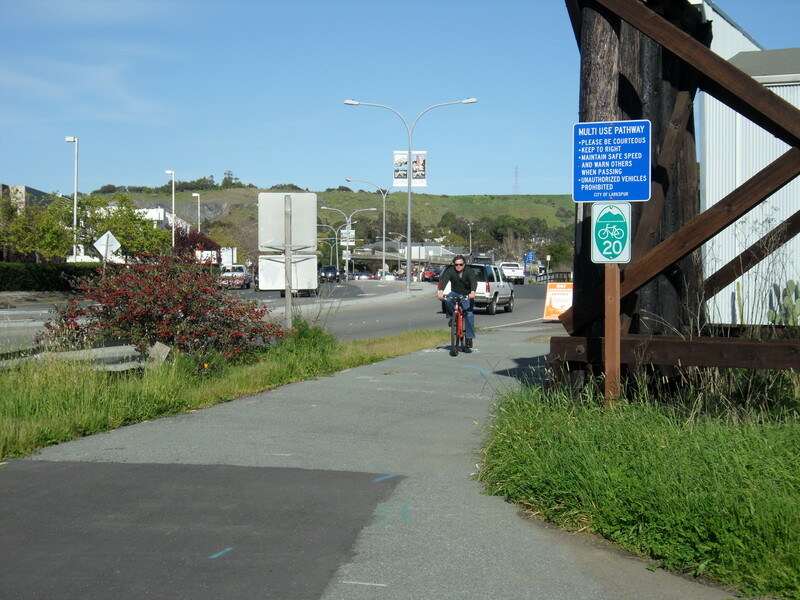 The path will shortly intersect Bike Route 20. 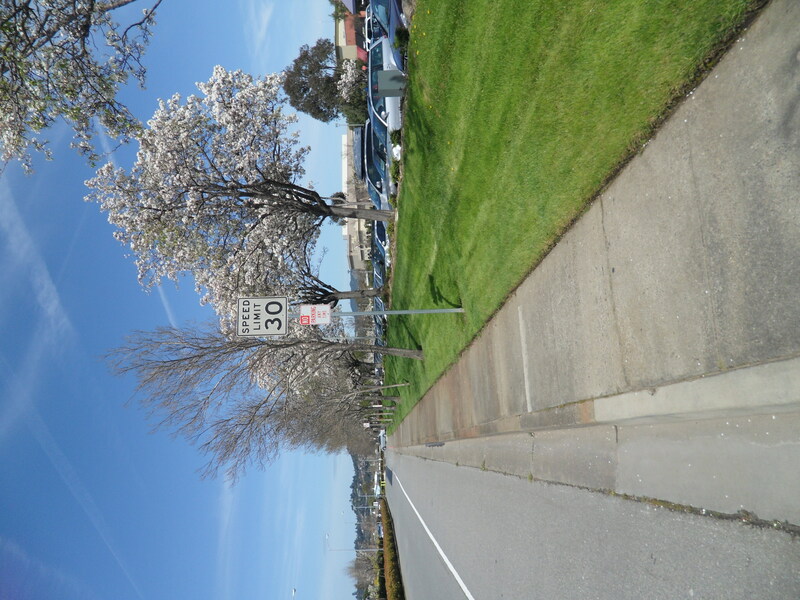 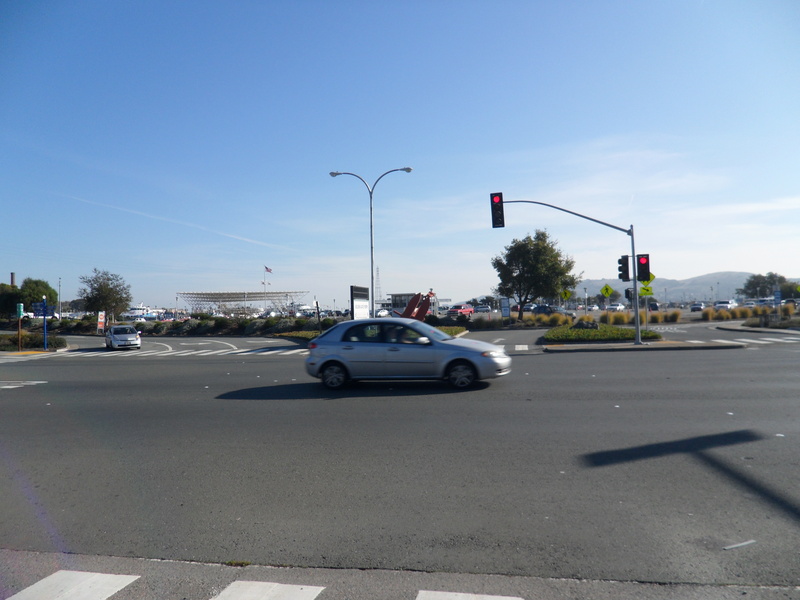 Make a left onto Route 20 and follow it to the Larkspur Ferry Terminal, but don’t turn in just yet. 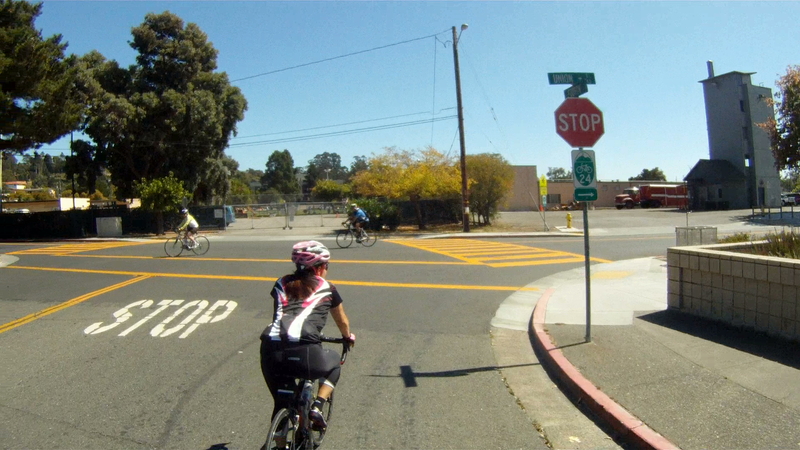 Keep going on the path to the stop light where we will meet with Option 2. 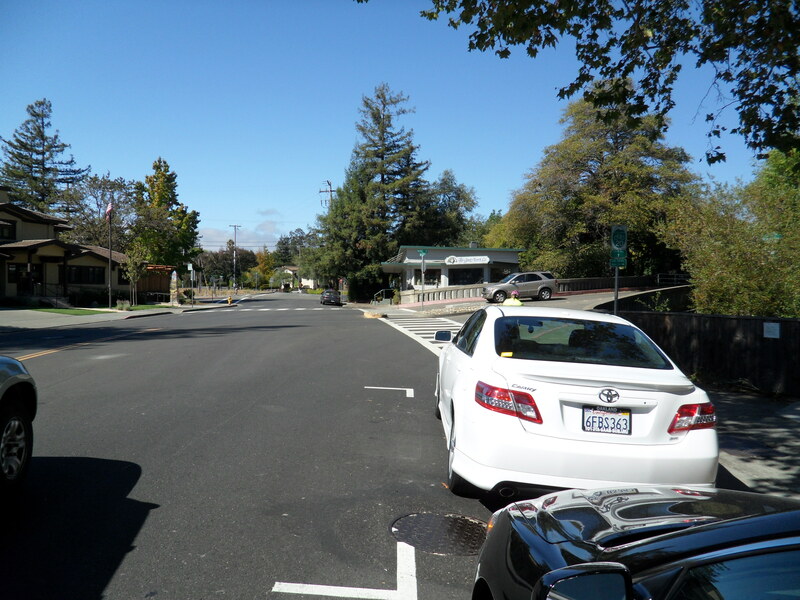 Back at the intersection of Irwin Street and Anderson Drive, to follow The Dragon’s Belly, make a left onto Anderson Drive. 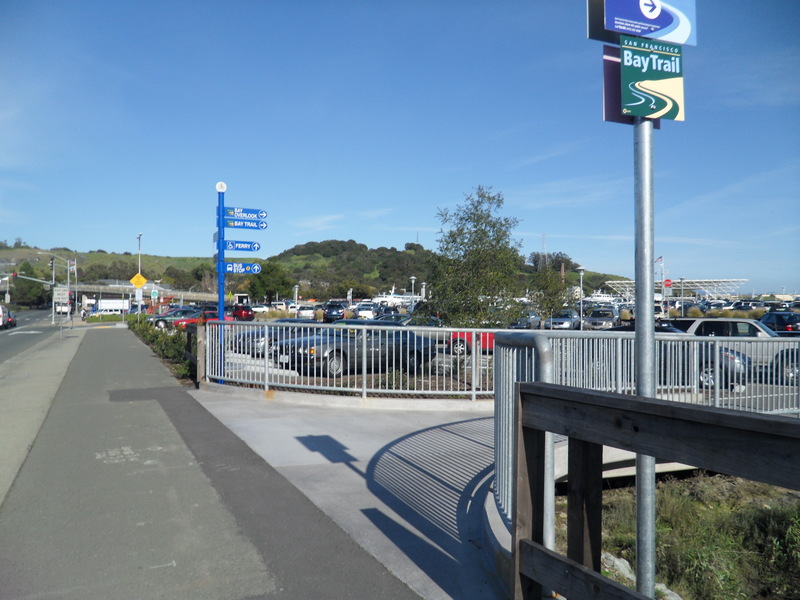 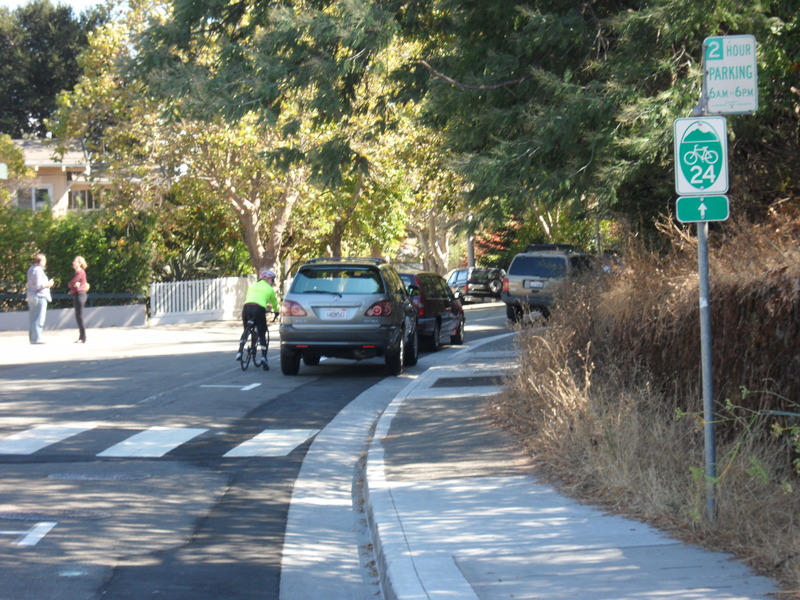 Follow Andersen Drive through lower San Rafael until you reach the bike path entrance just before the intersection with Francisco Boulevard. 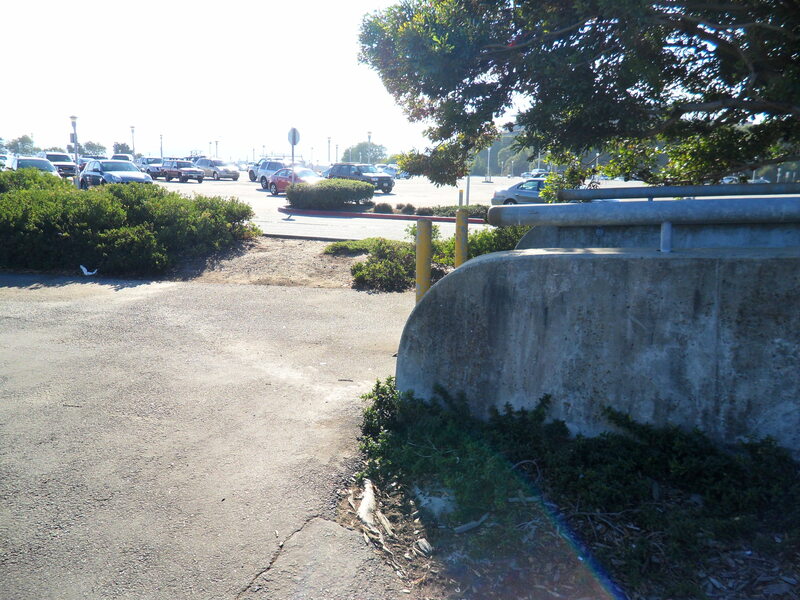 Turn onto the sidewalk at this point and follow the sidewalk to the path entrance a couple hundred feet (~70 meters) down the way. 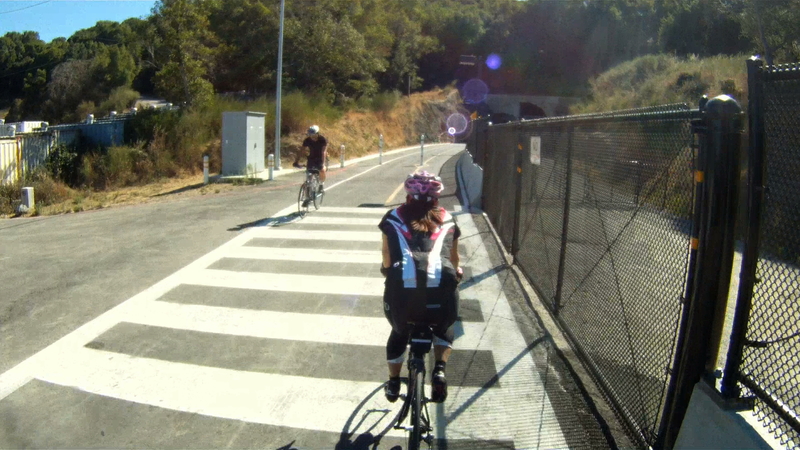 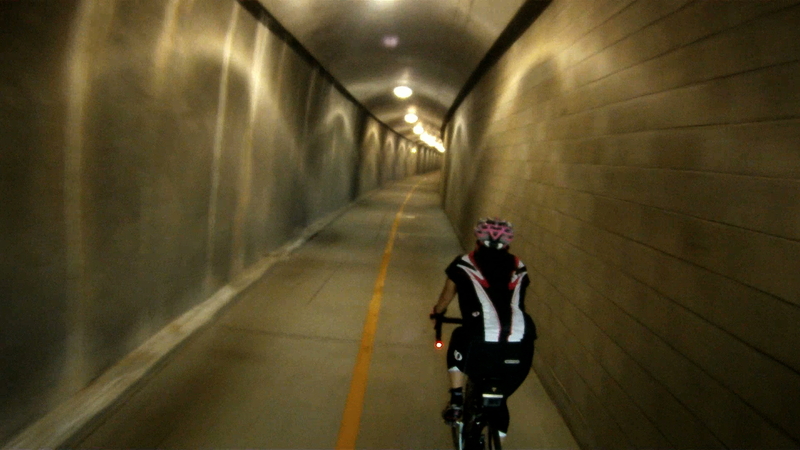 Follow Route 5 onto the Cal Park Hill Path and follow it through the Cal Park Hill Tunnel. 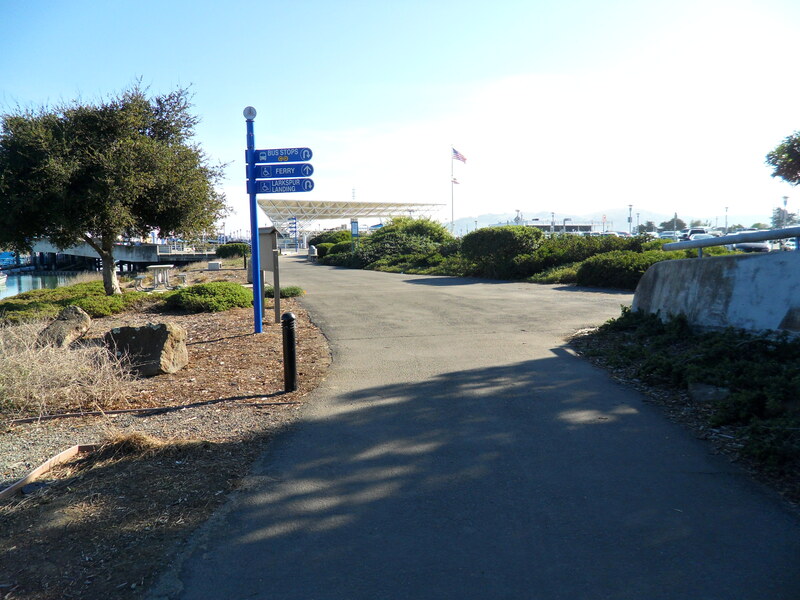 The path will drop you off at the parking lot of the Century Theater at Larkspur Landing. 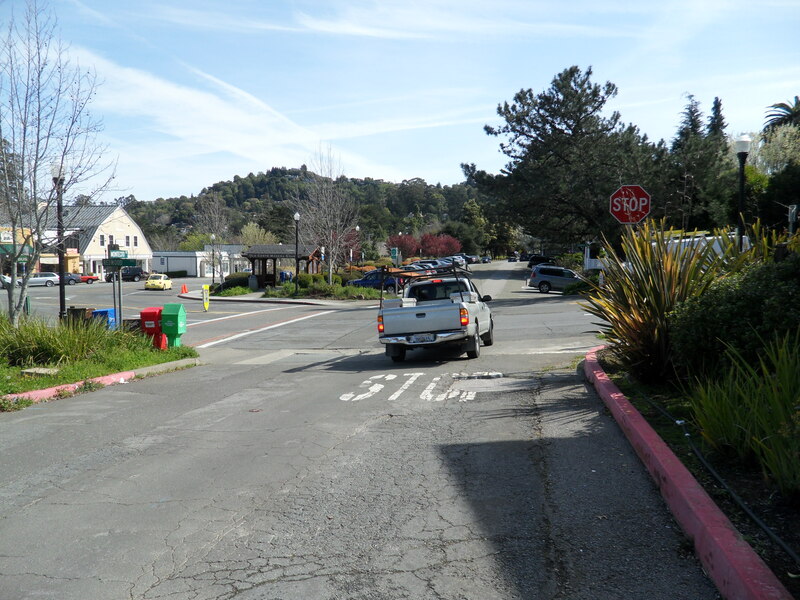 Turn right into the parking lot, then make another right onto Larkspur Landing Circle. 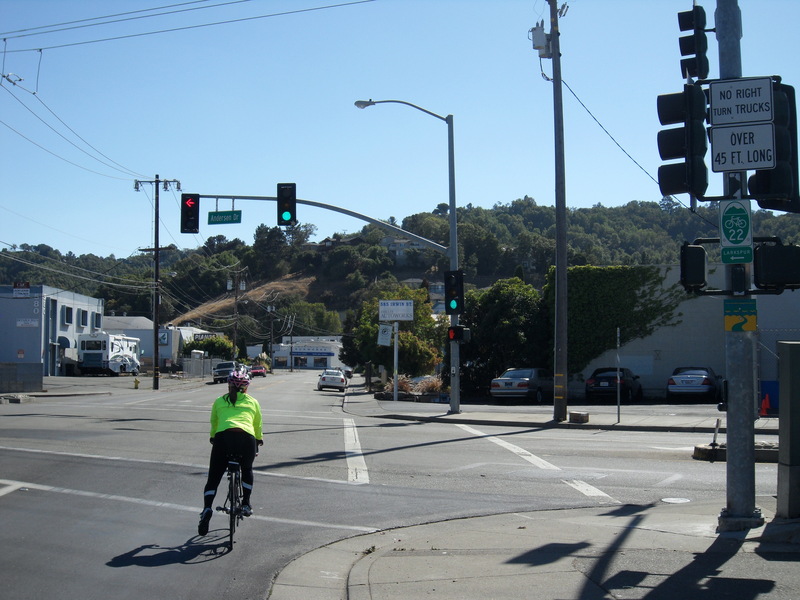 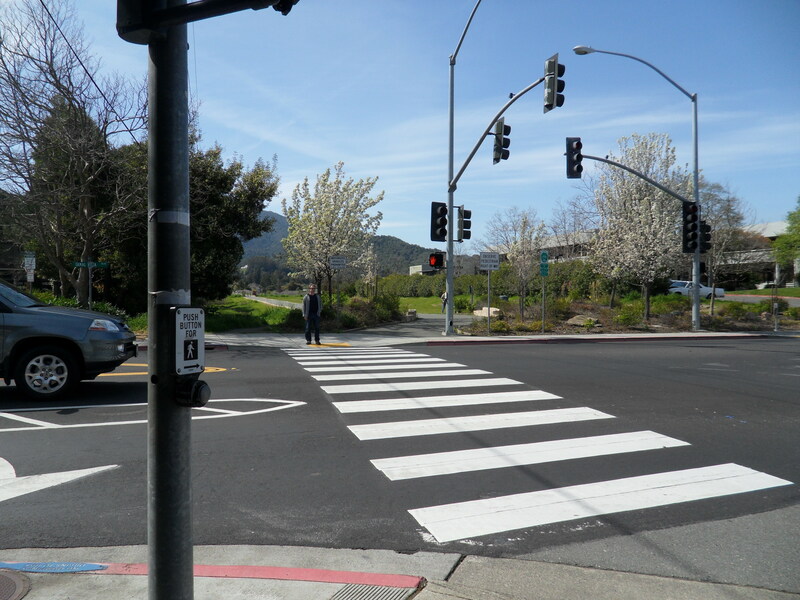 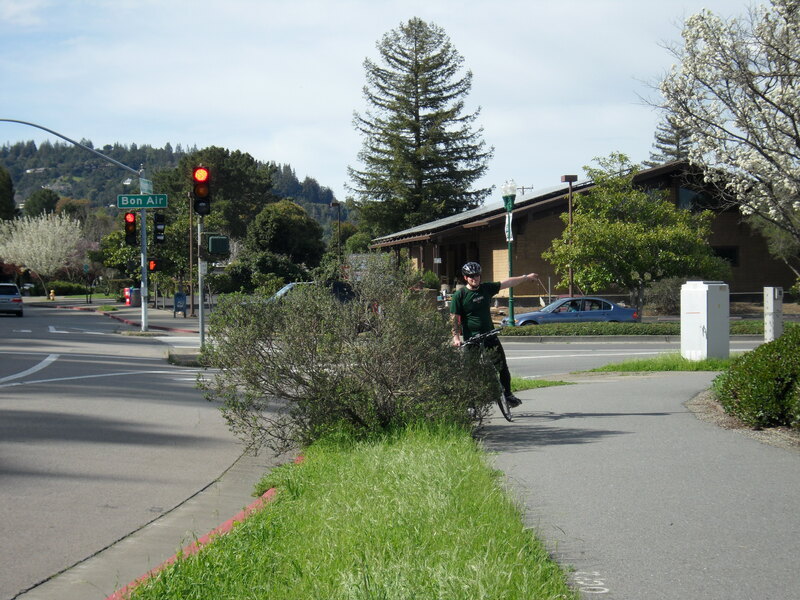 Follow Larkspur Landing Circle to the stoplight at Sir Frances Drake Boulevard. 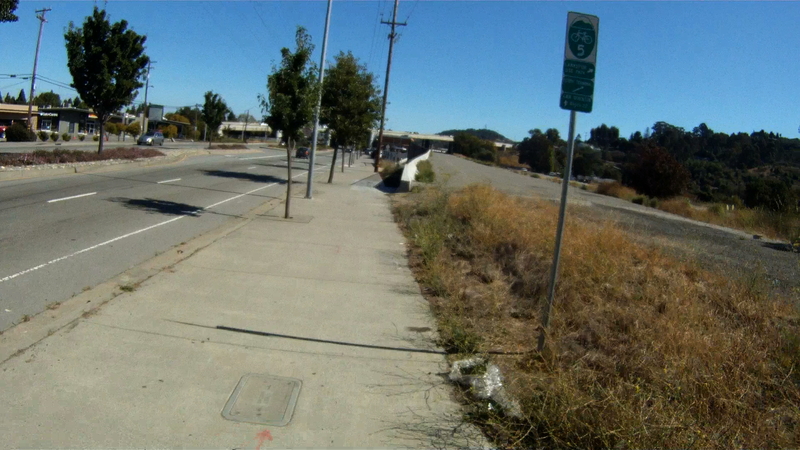 Cross Sir Frances Drake Boulevard towards the Larkspur Ferry Terminal entrance, but veer left onto the sidewalk and path. 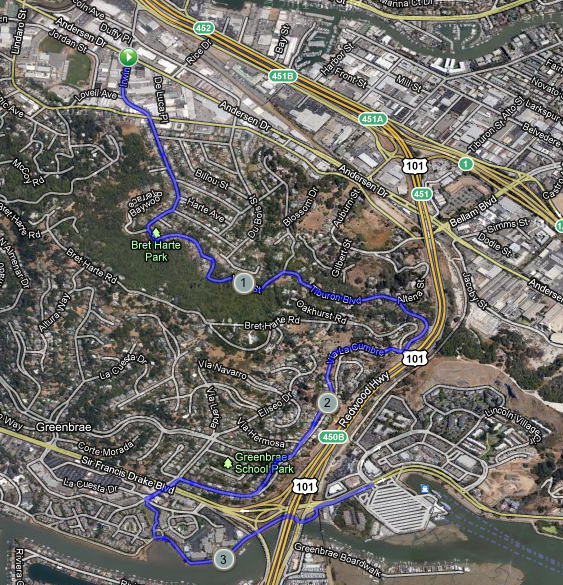 This is where Option 1: The Dragon’s Spine and Option 2: The Dragon’s Belly merge. 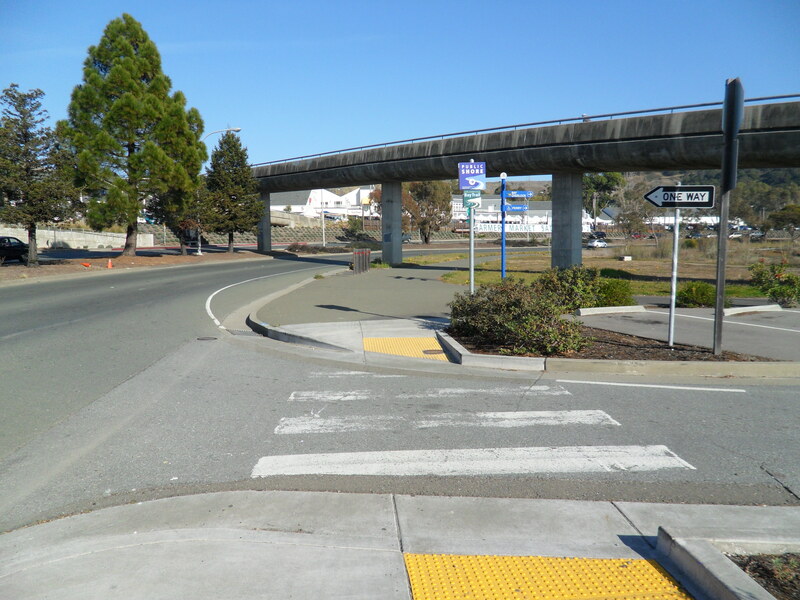 From the stoplight at the Ferry Terminal entrance, follow the path under the pedestrian bridge and then make a quick right. 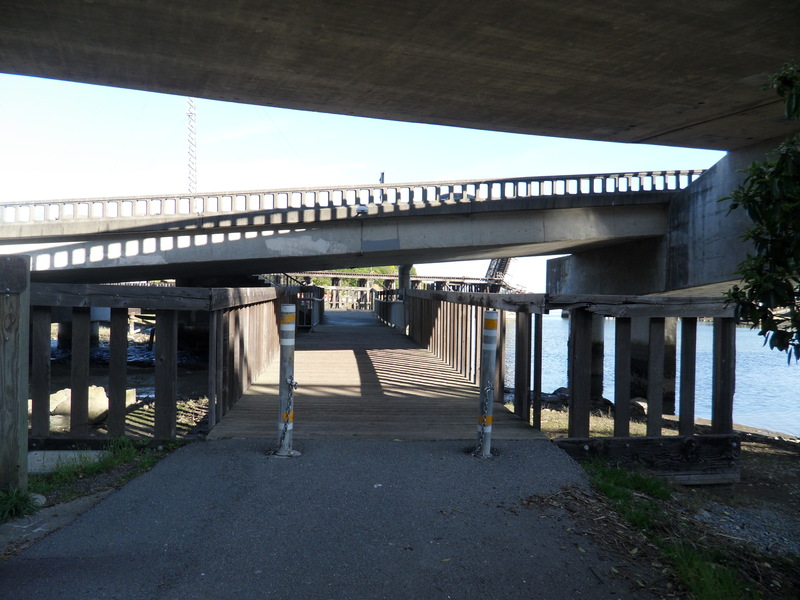 Where the path meets the base of the pedestrian bridge, make a 180 onto the bridge and follow it over Sir Frances Drake Boulevard. 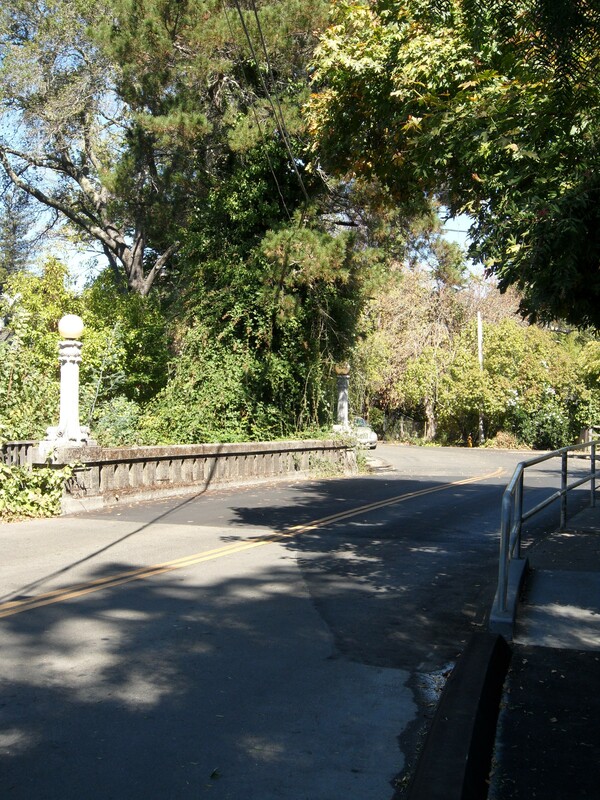 At the other end of the bridge, cross the road into the courtyard. 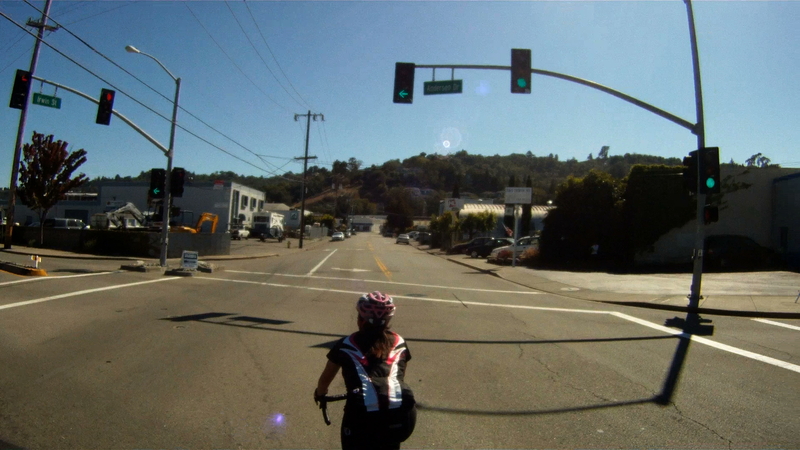 Just ahead of you is the Marin Brewing Company. 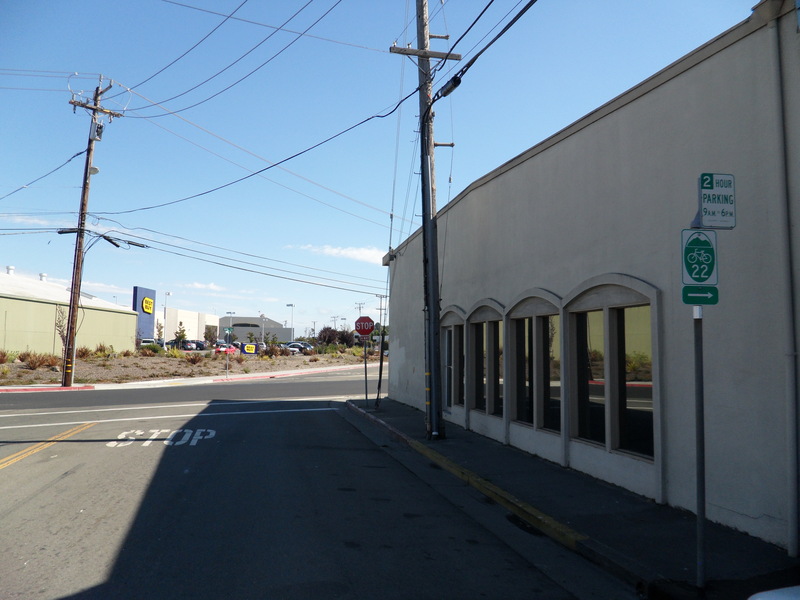 Stop in to have one of the Brewing Company’s microbrews before you catch the ferry back to San Francisco. 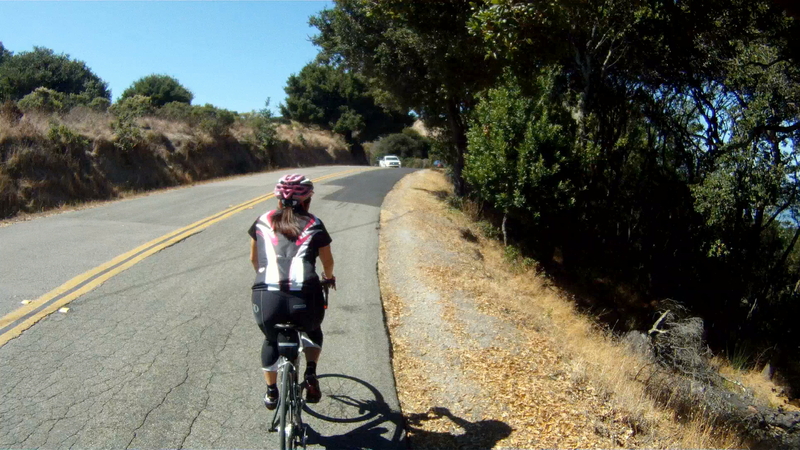 We always enjoy a Mt. 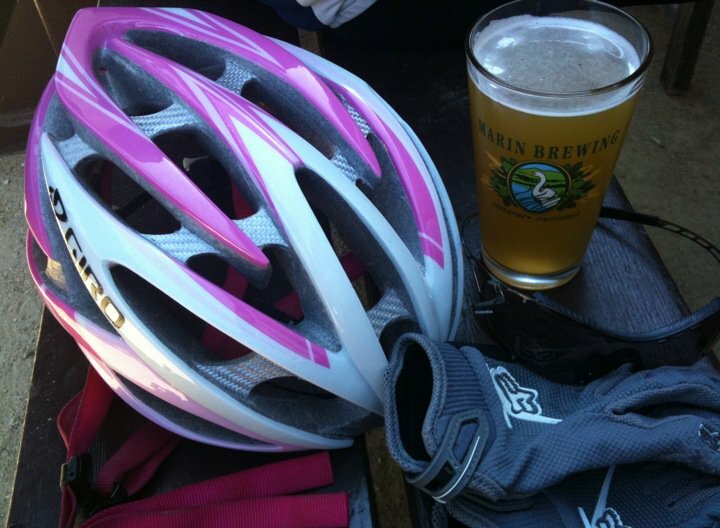 Tam Pale Ale or a seasonal brew after a long ride. 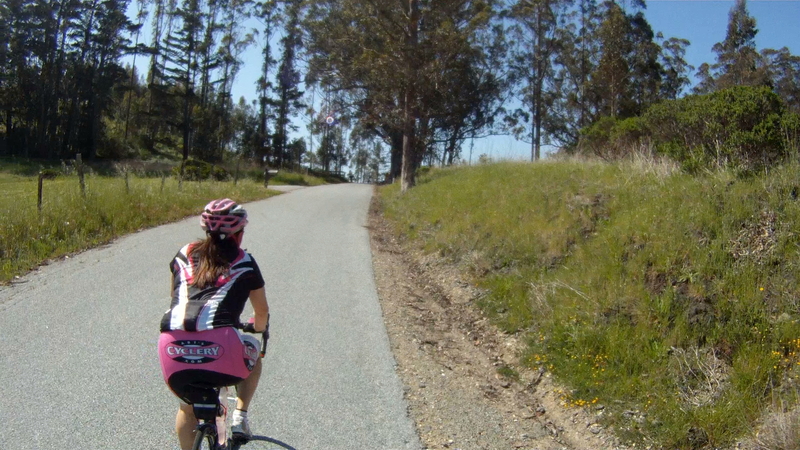 We also bring any of our friends that join us for a ride. 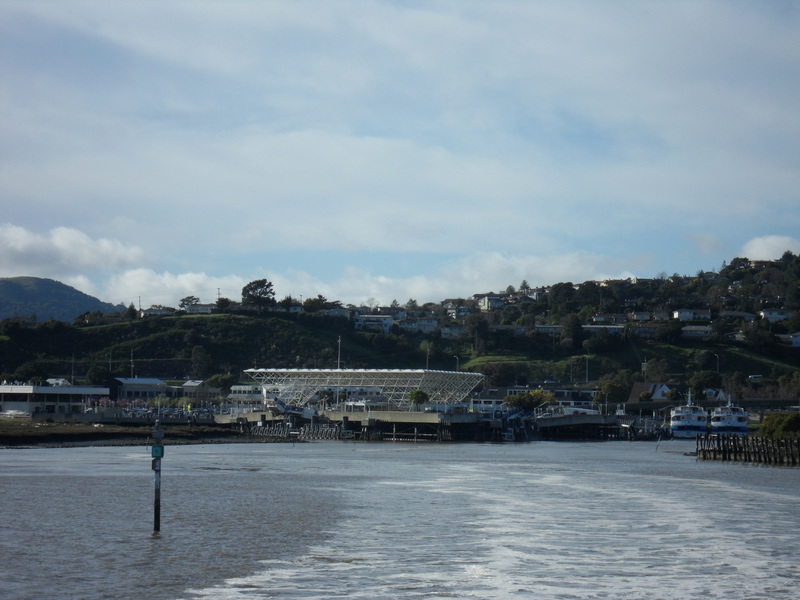 Being able to return to San Francisco via the Larkspur Ferry is a great way to extend a ride deeper into Marin County. 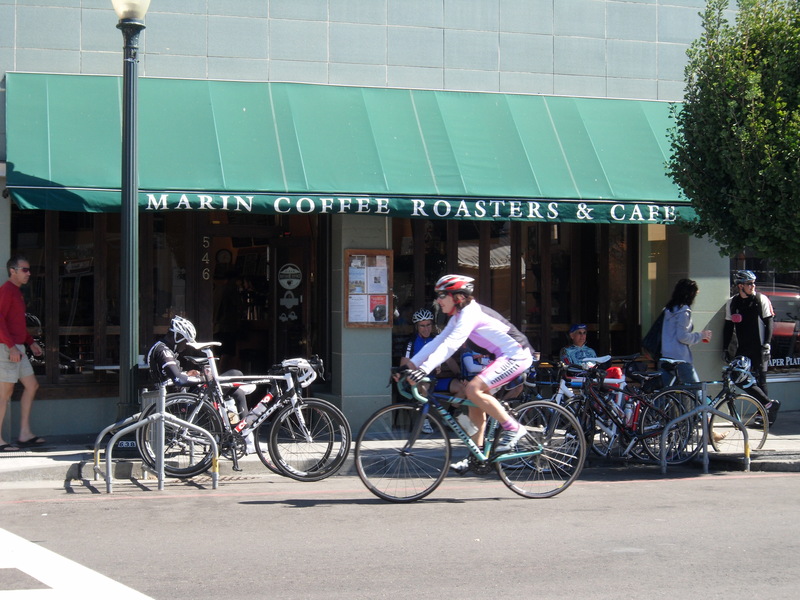 Whether you are hungry for a post-ride meal, have time to kill before the next ferry or just feel like a beer, stopping in at Marin Brewing Company is a great way to meet all those needs. 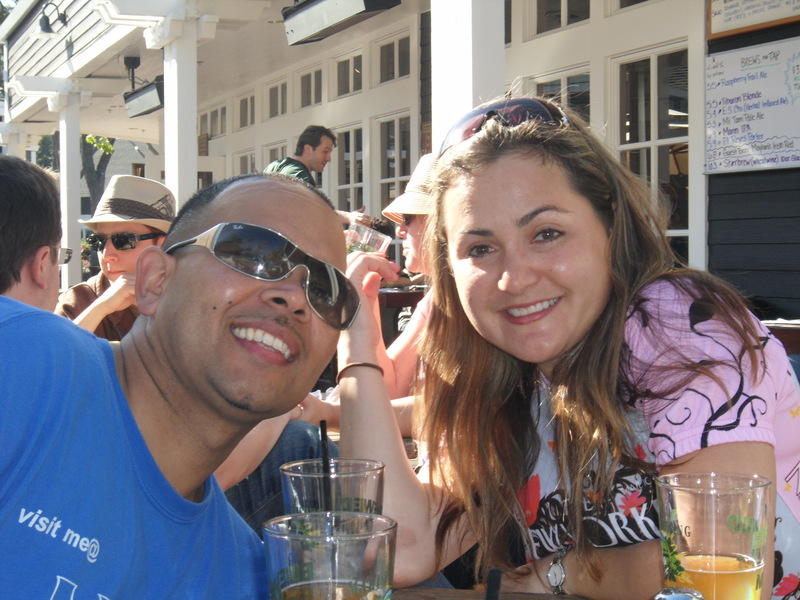 Make sure to say “Hi” if you see us there grabbing a beer! 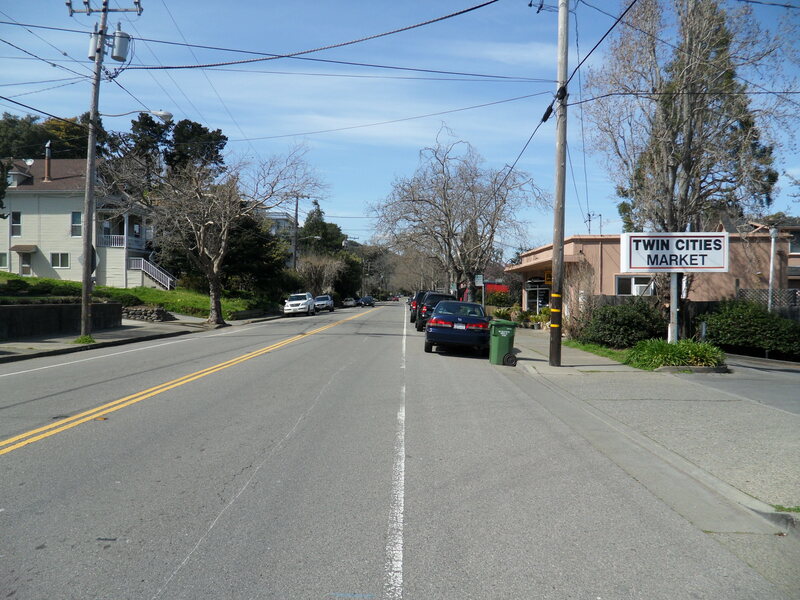 Starting at the intersection of Magnolia Avenue, Route 15, and Bon Air Boulevard, just outside of Larkspur, continue along Magnolia Avenue toward Ross. 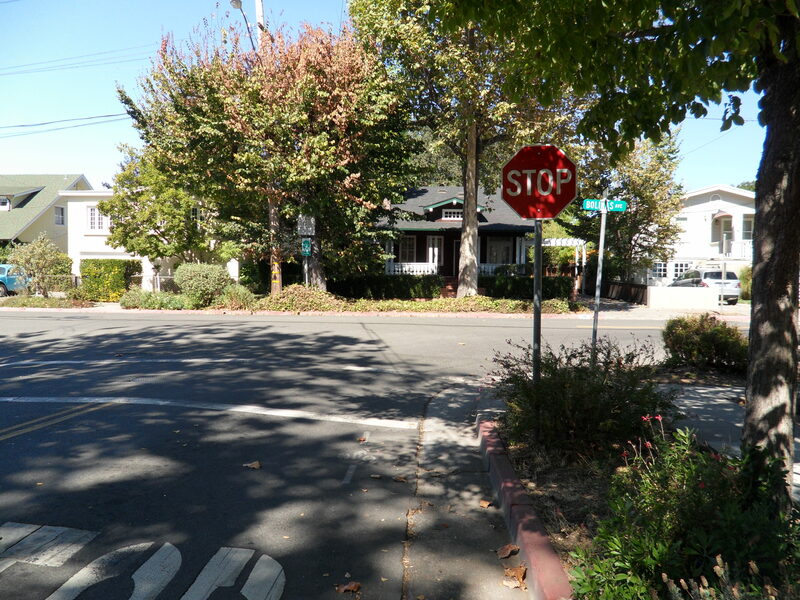 Follow Magnolia Avenue until you reach the stop sign at Kent Avenue. 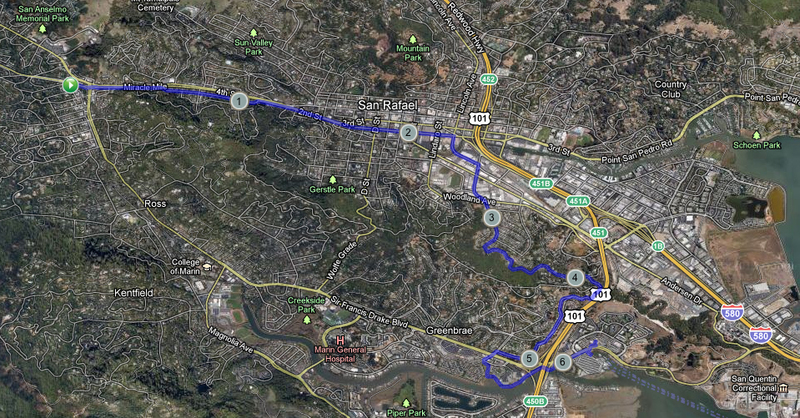 Make a left at the stop sign, then jog to the right onto Kent Avenue, continuing to follow Route 15. 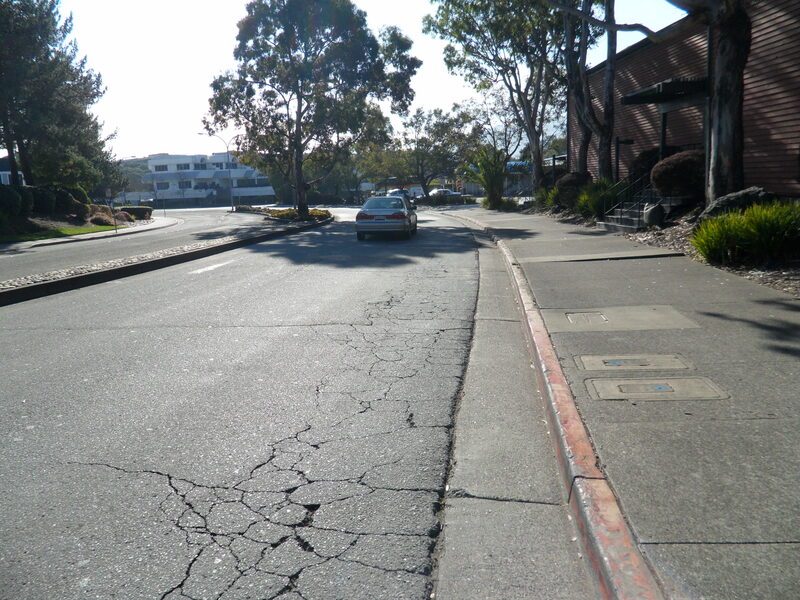 Follow Kent Avenue through Ross and past the Ross Commons. 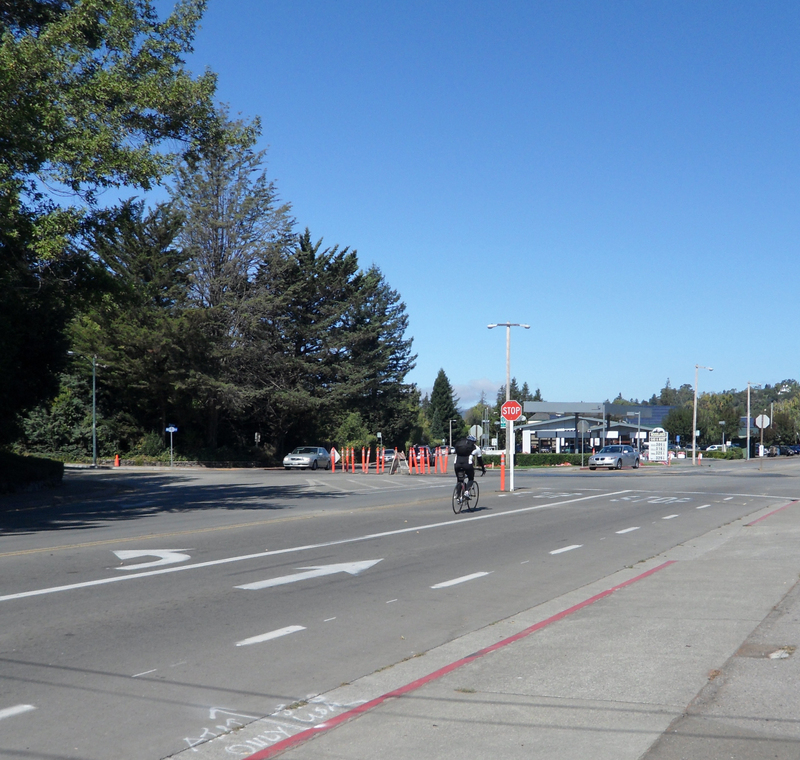 Kent Avenue and Route 15 dead end at Lagunitas Road. 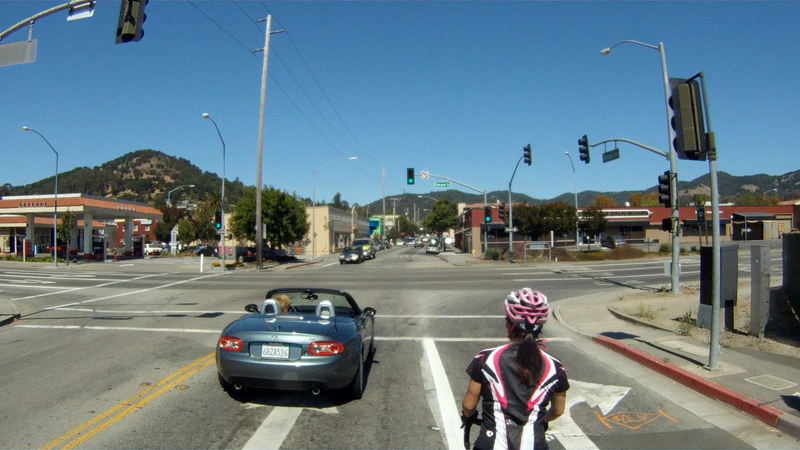 Make a left onto Lagunitas Road, then make quick right onto Shady Lane. 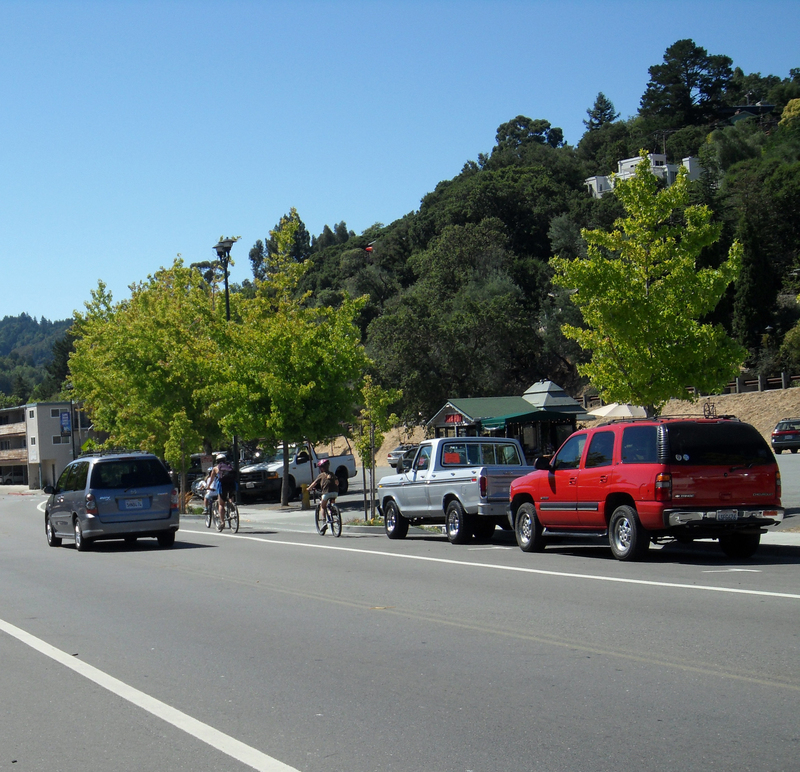 You pick up Route 20 the rest of the way to San Anselmo. 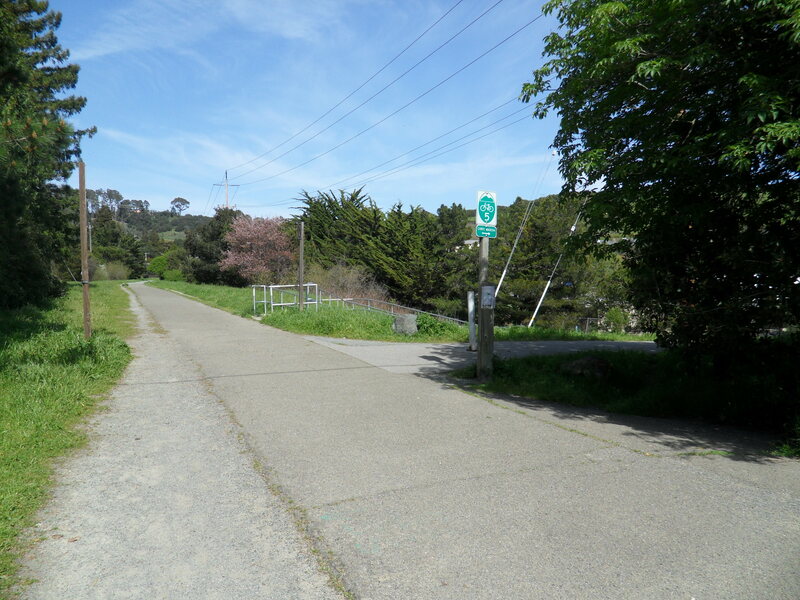 Follow Shady Lane to Bolinas Avenue. 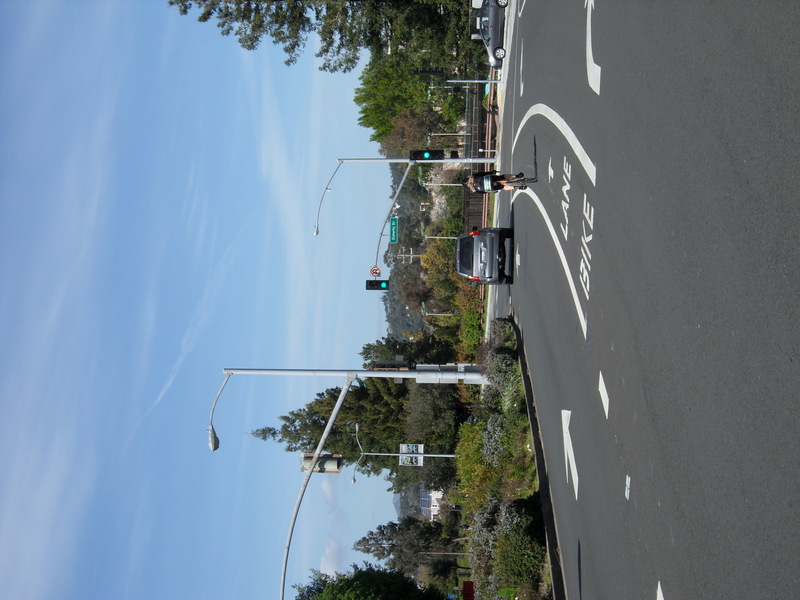 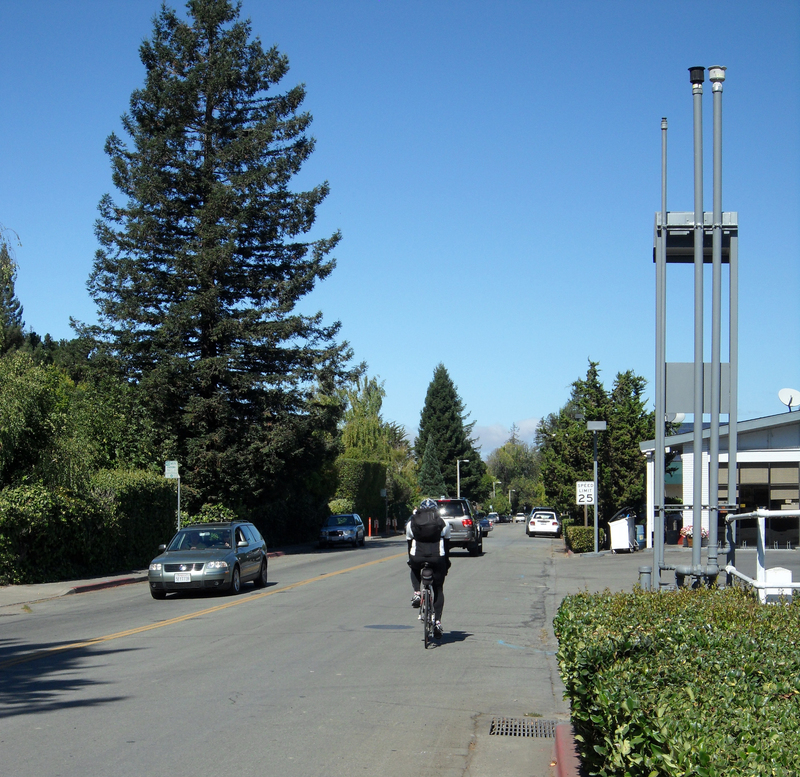 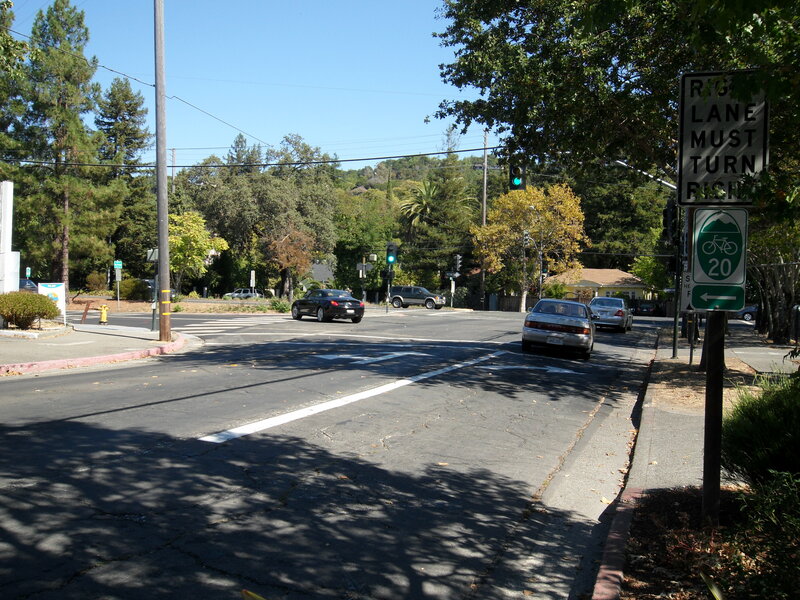 Make a right onto Bolinas Avenue, then make the first left at the stoplight onto San Anselmo Avenue (just like the black Lexus in the second picture below). 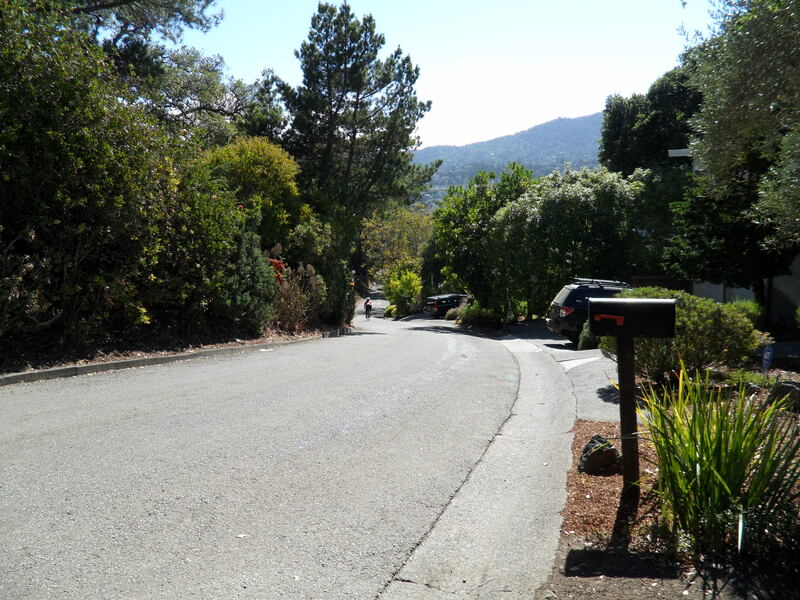 This road takes you through the heart of San Anselmo. 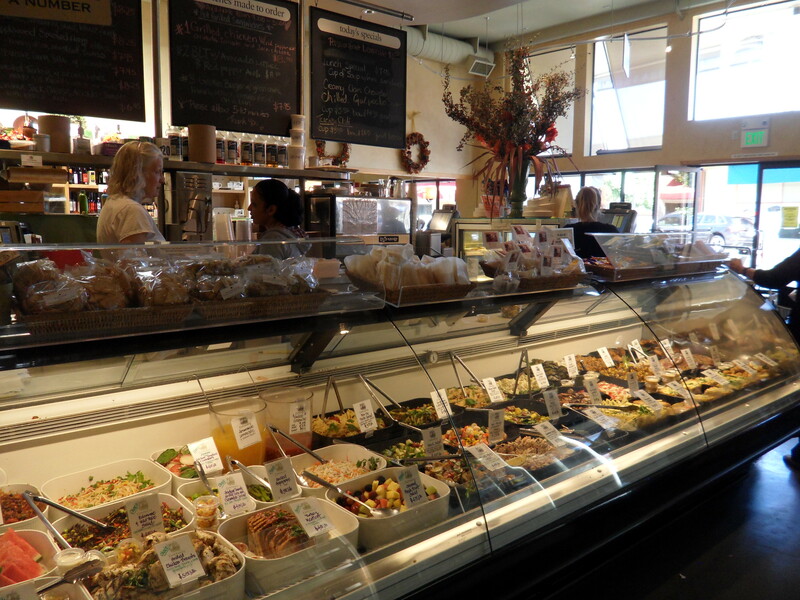 Just past the next stop light is one of our favorite lunch spots, Comforts. 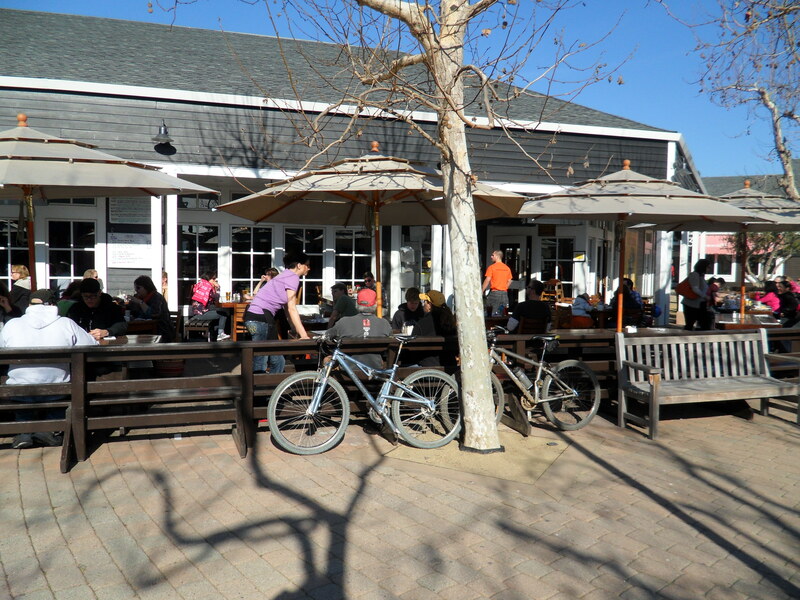 The Chinese Chicken Salad is a house favorite at Comforts, a popular place for locals and where you will see cyclists around who are post-ride or taking a break for lunch. 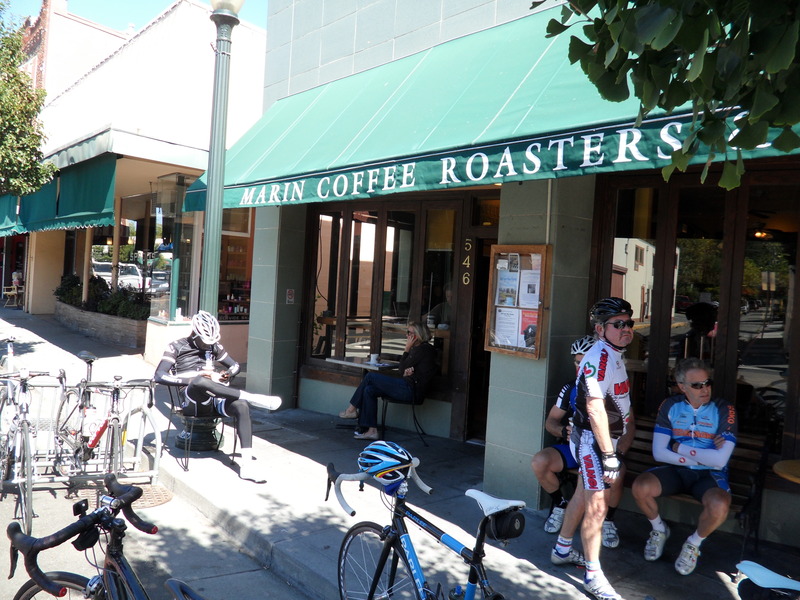 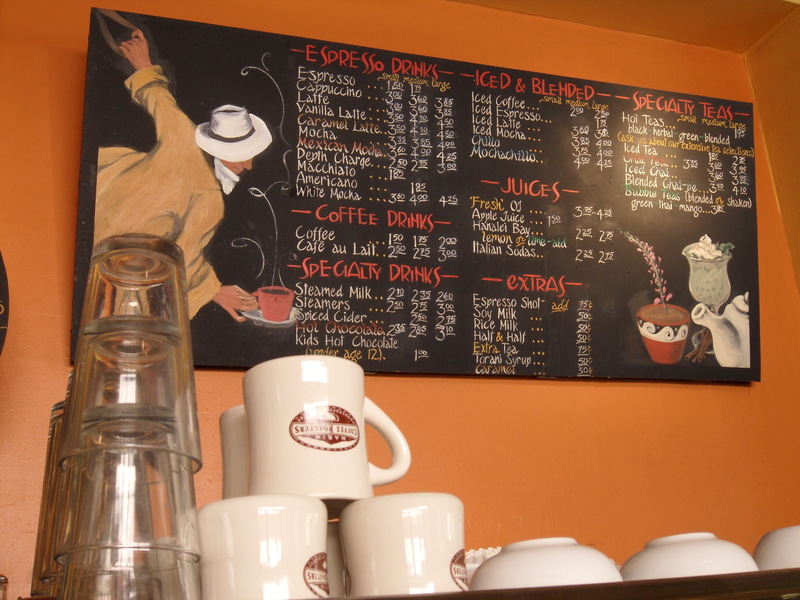 If you are not ready for lunch, but would like to have coffee and bond with other cyclists, continue down the street and Marin Coffee Roasters & Cafe, another hub for bike chatter. 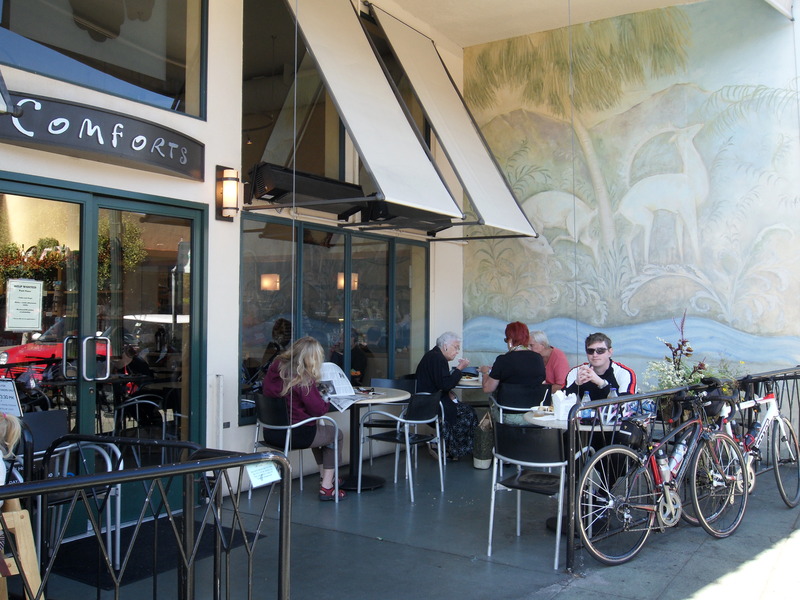 With bike racks set up front you’ll see everything from restored 1960’s Schwinn comfort bikes, to mountain bikes to souped-up road bikes parked in front of this coffee house. 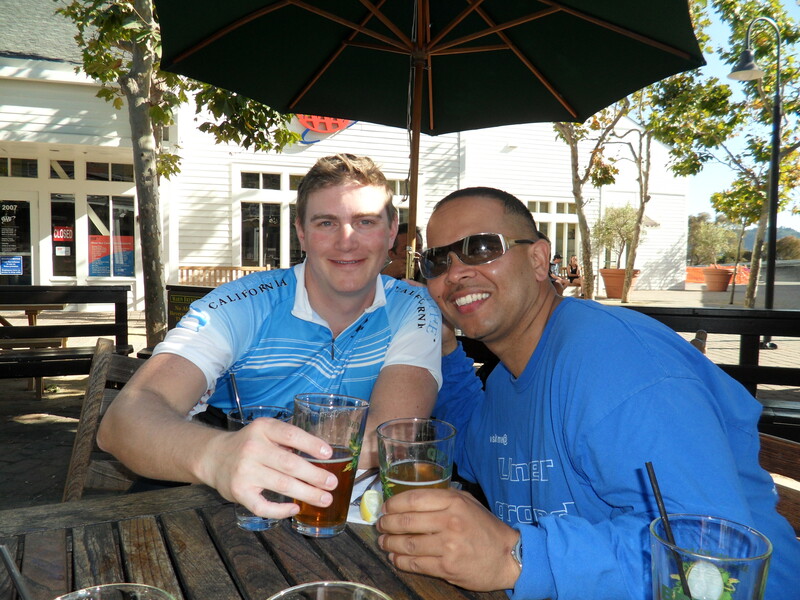 Riders drink joe and swap stories about rides and where they plan to go next. 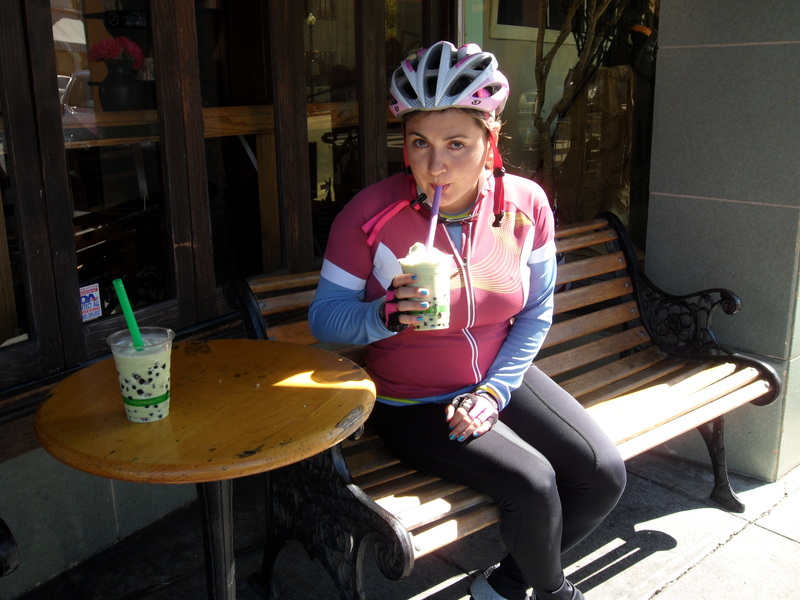 If you’ve never had it, we recommend trying the frozen green bubble tea – a green tea frappuccino with tapioca balls (see below). 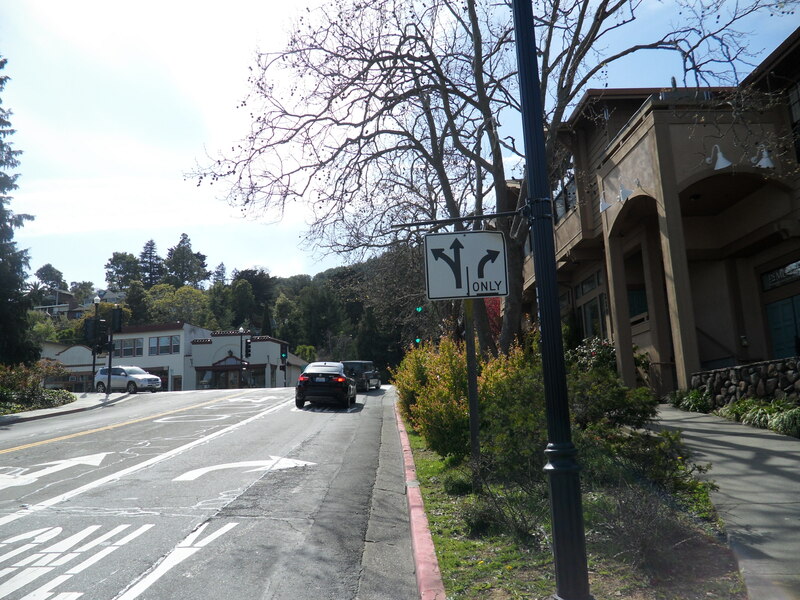 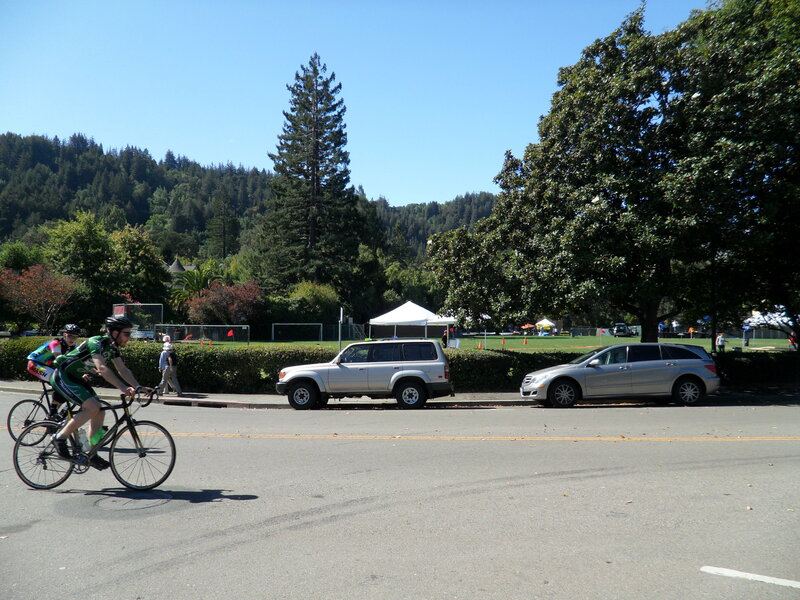 For more choices continue along San Anselmo Avenue through the rest of the town towards Fairfax, then make a left, following San Anselmo Avenue and Route 20, just past the 7-11. 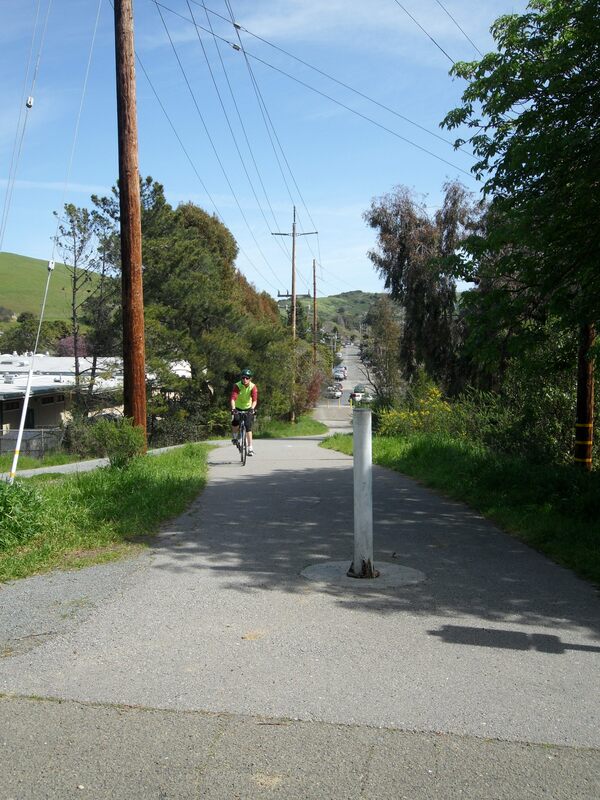 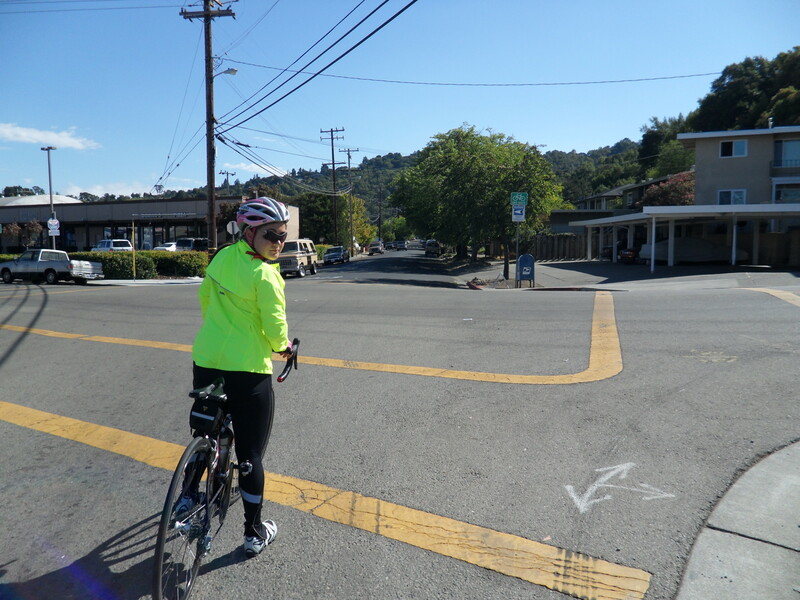 Continue to follow along Route 20 and San Anselmo Avenue. 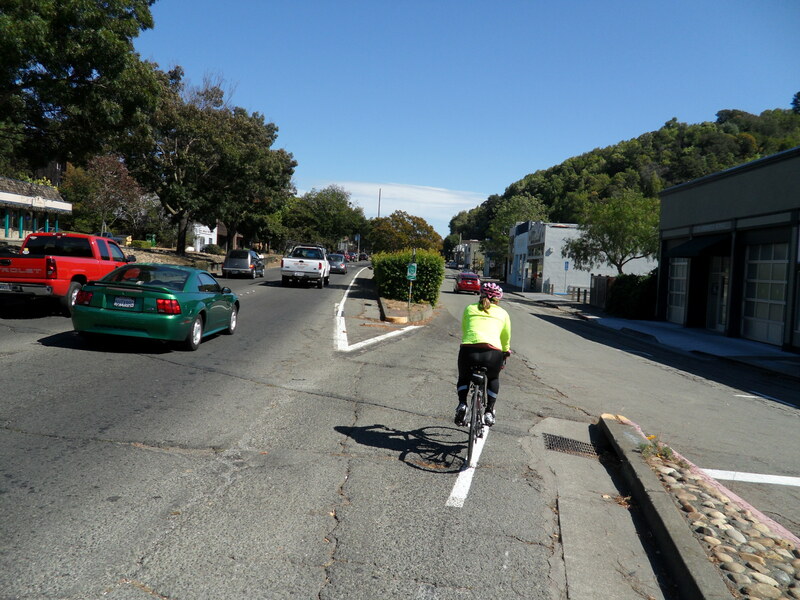 San Anselmo Avenue makes a right just after Madrone Avenue. 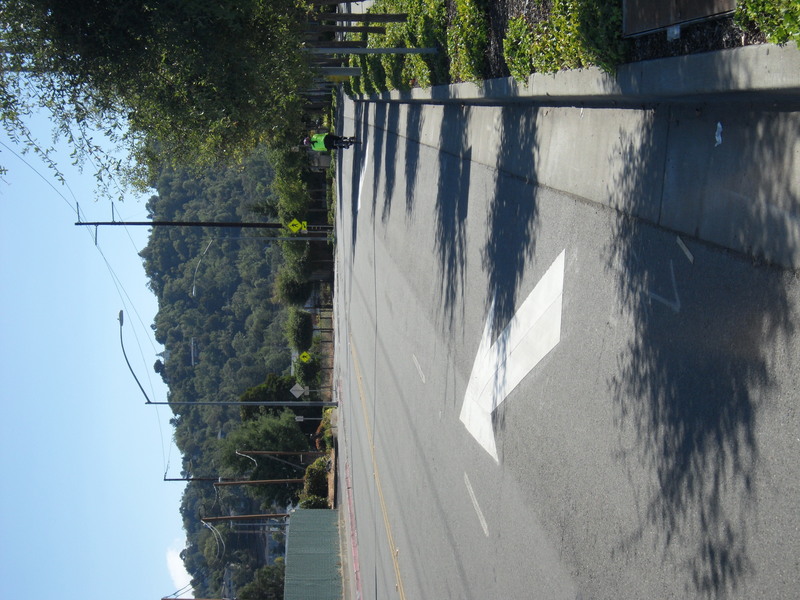 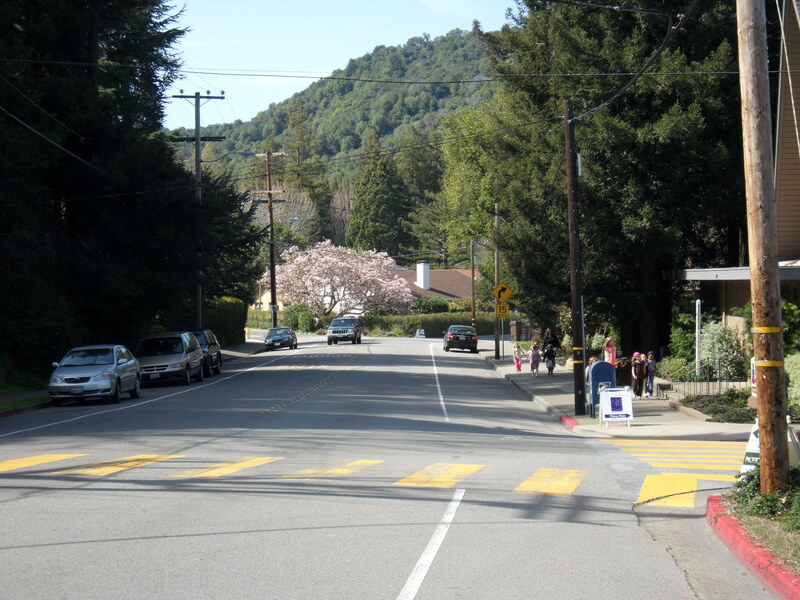 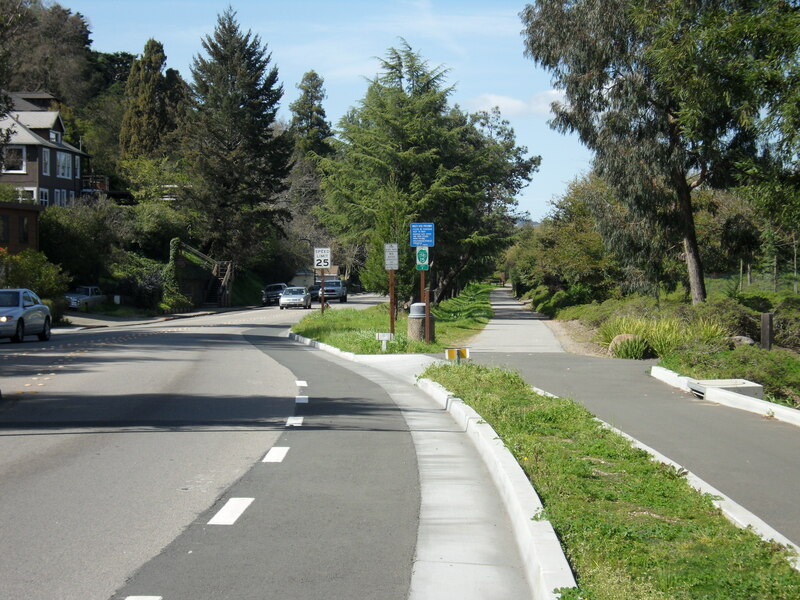 Just after Redwood Road, there is a “Y” in the road, follow the “Y” to the right and continue along San Anselmo Avenue. 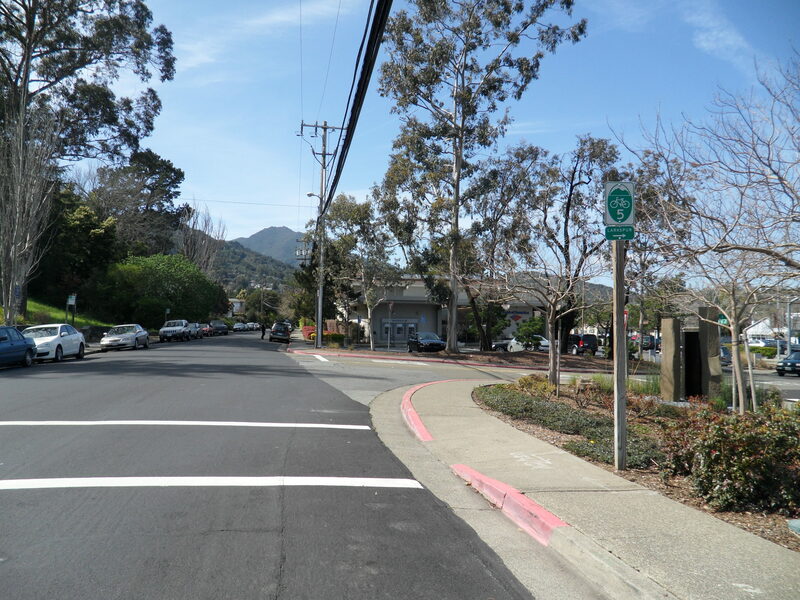 San Anselmo Boulevard turns into Lansdale Avenue. 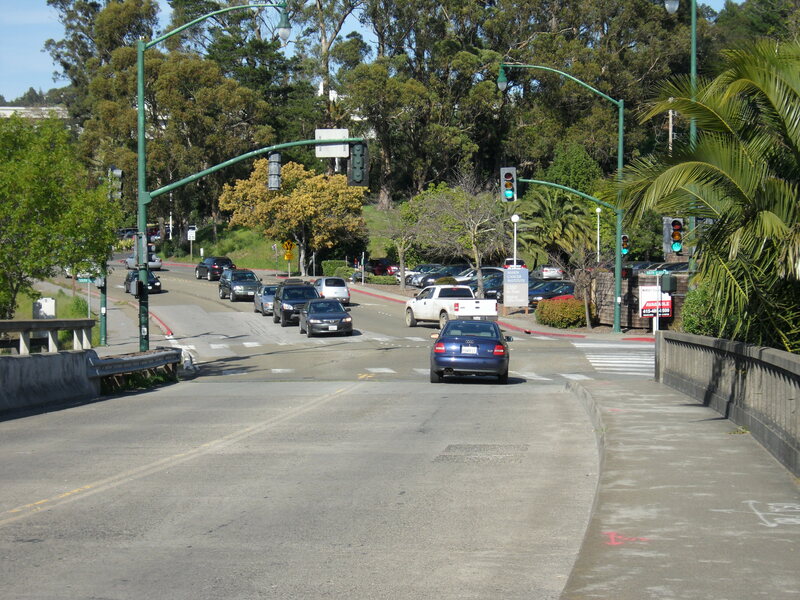 The road ends at Pastoni Avenue, make a right and then a quick left onto Center Boulevard. 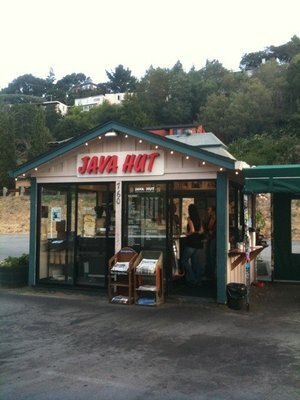 Along Center Boulevard then next place to stop for a coffee is the Java Hut. 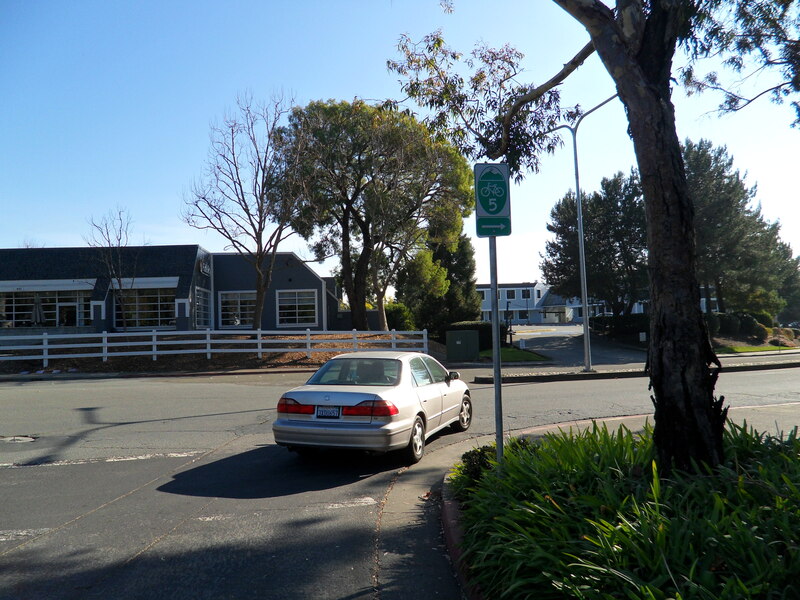 This is not only a place to stop for coffee early in the morning, but also a great place to park if you want to start you ride from Fairfax. 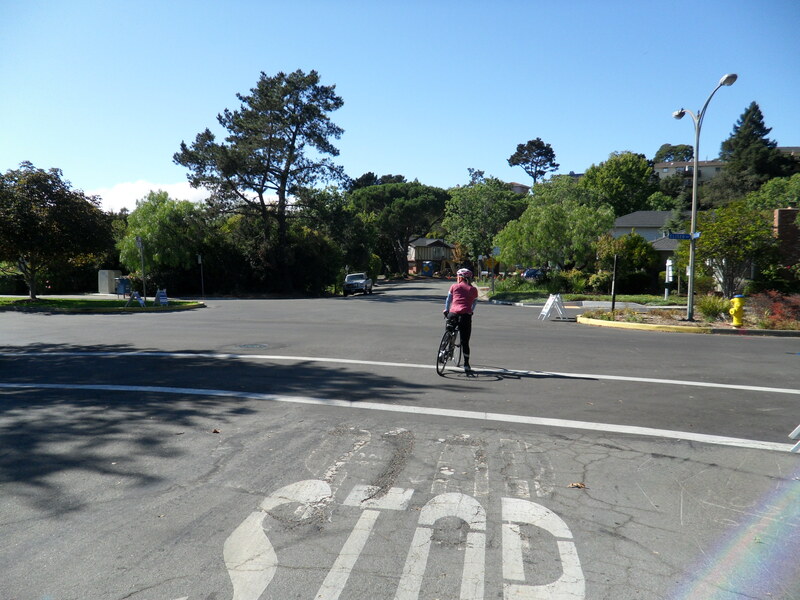 Following along Center Boulevard, make a left at Bolinas Road. 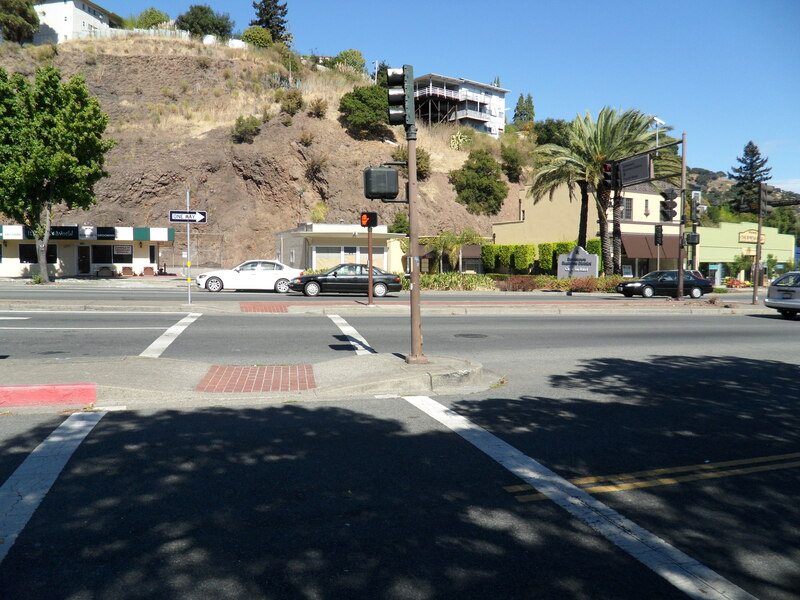 On the corner is Fairfax Coffee Roastery. 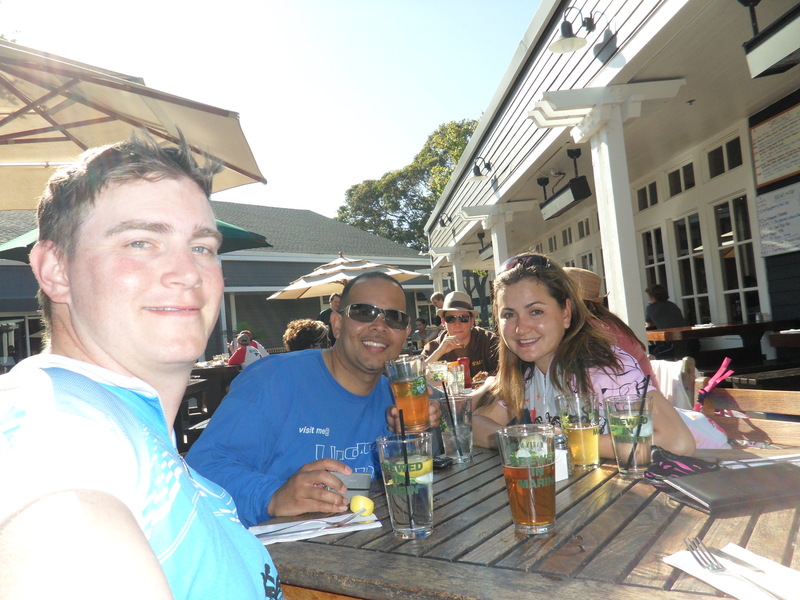 While it may be difficult to make friends with fellow cyclists on hard climbs or fast descents, hanging out in places where cyclists congregate to eat and drink is one of the most enjoyable social aspects of cycling. 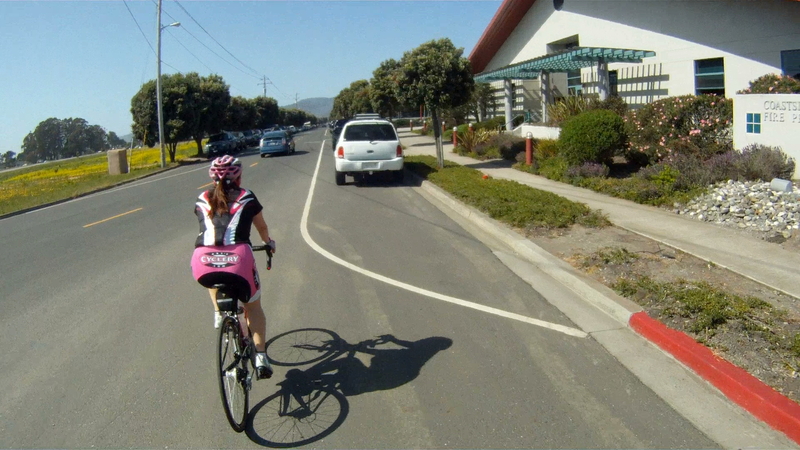 Swapping stories over coffee or lunch is a great way to hear about rides you may want to take (or those you would not want to take). 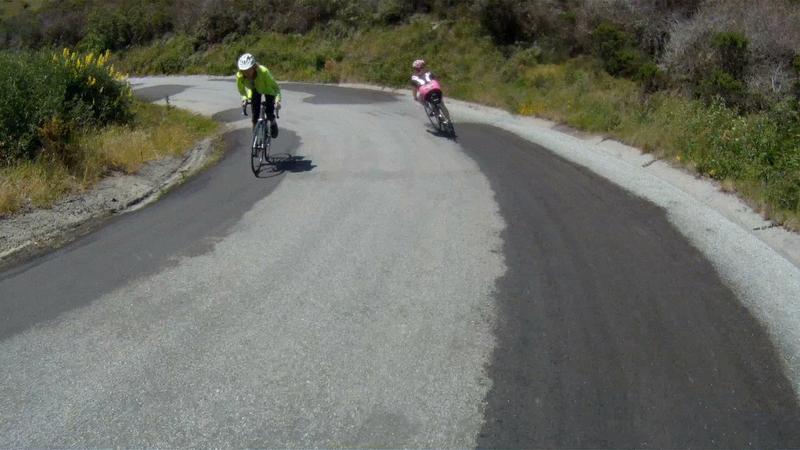 Socialization in cycling is something to keep the community growing in both numbers and camaraderie. 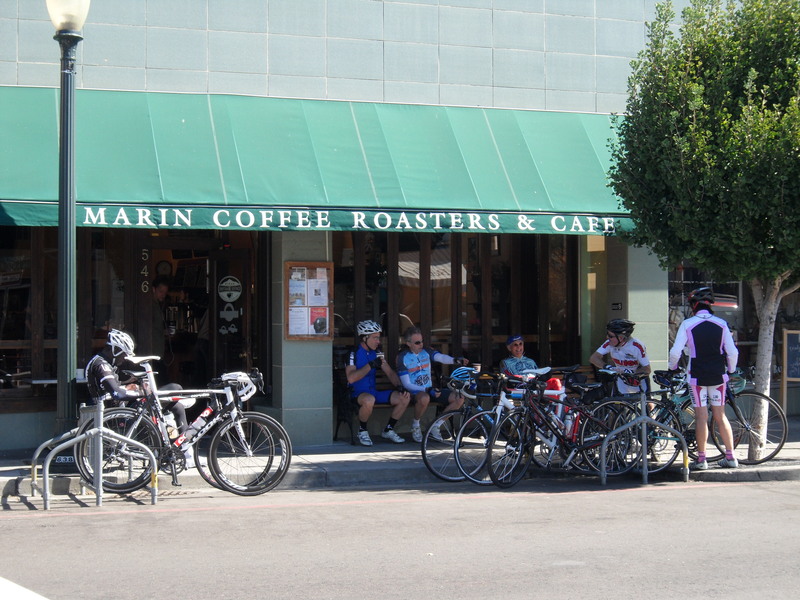 Next time you are out on a ride, make sure to enjoy coffee with a fellow cyclist. 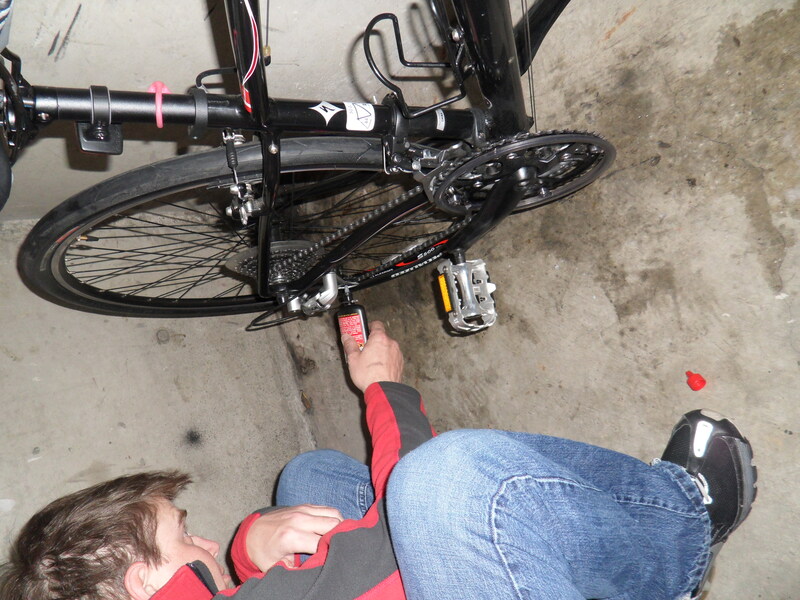 Tips & Tricks: Get the Most Out of Your Bike – Get it Fit! 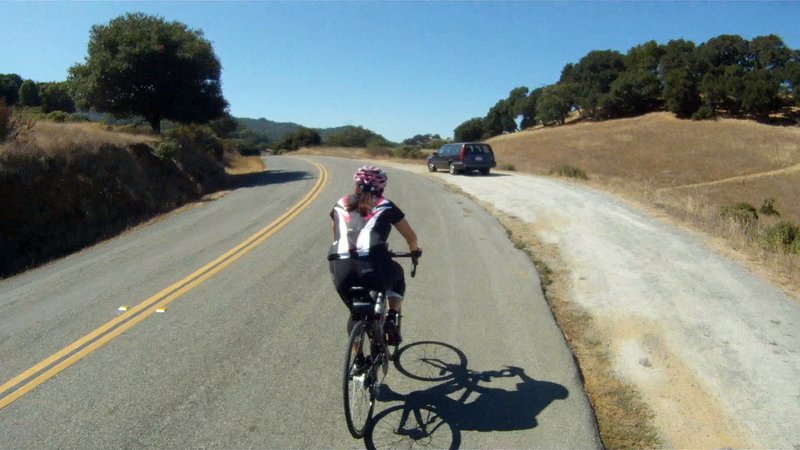 Getting the most out of you bike requires a lot of work and effort. 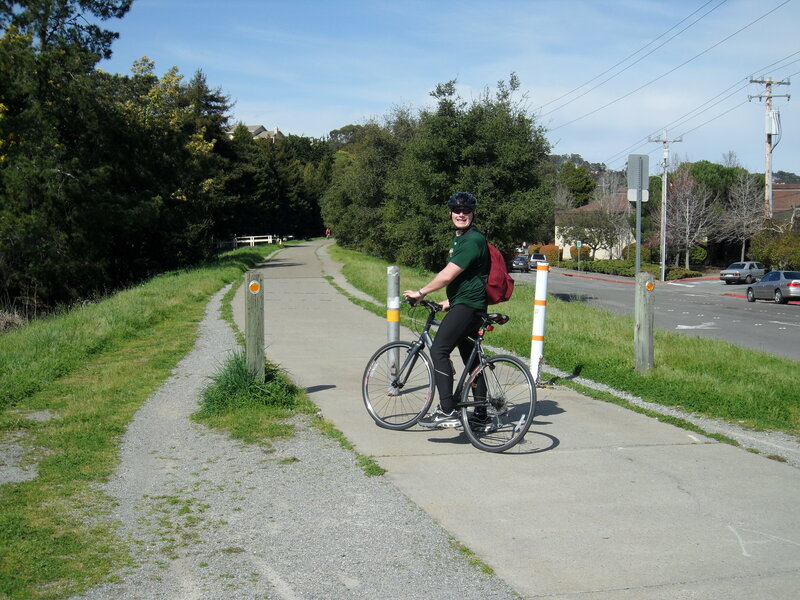 Part of that work is performing regular maintenance of your bike like lubing the chain, checking and pumping the tires, washing the bike and having your favorite mechanic check the bike once or twice a year. 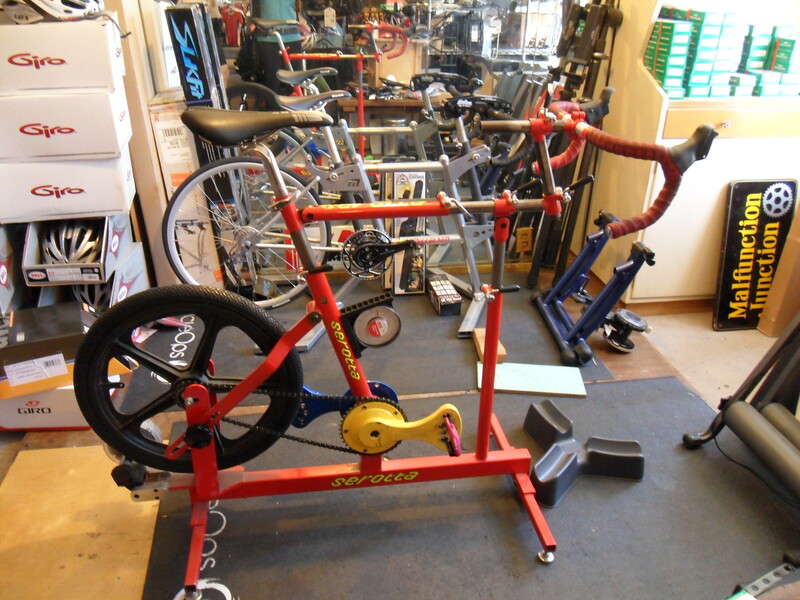 Beyond your regular tuning, the best thing you can do to get the most out of your bike and to help prevent injury due to bad form is to get your bike properly fit. 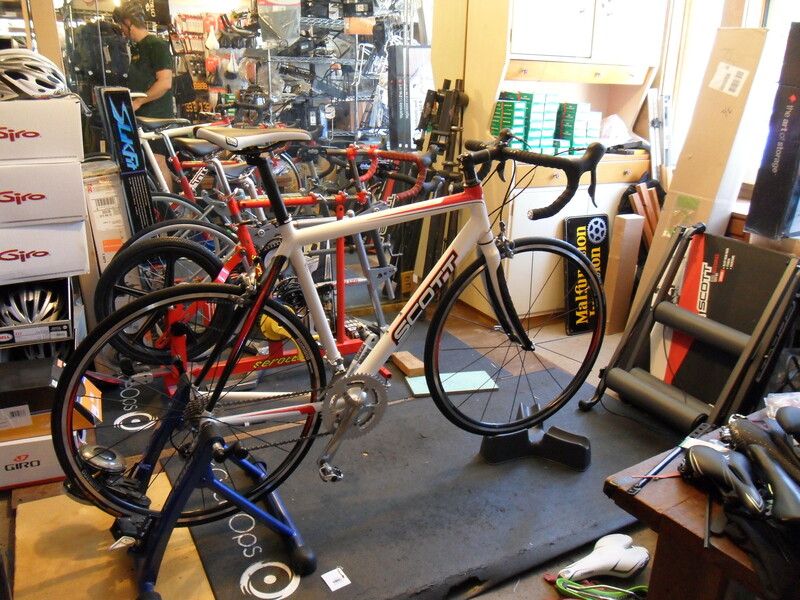 A bike fitting is more than just setting your seatpost at the right height, it’s about putting your bike in the correct place for you to get the most efficiency out of each peddle stroke, alleviate any muscle soreness you are experiencing and help to prevent future injury. 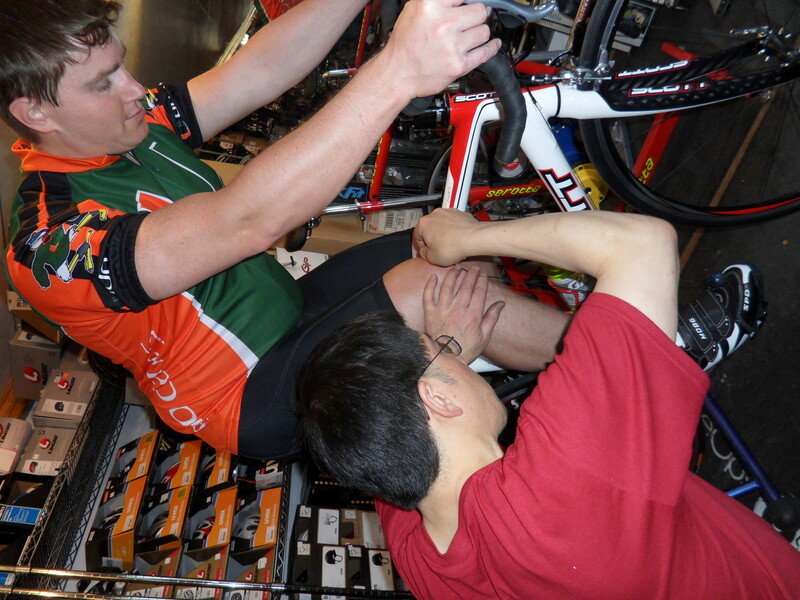 While bike fittings are important for all types of riders, road bikers benefit the most from a professional fitting. 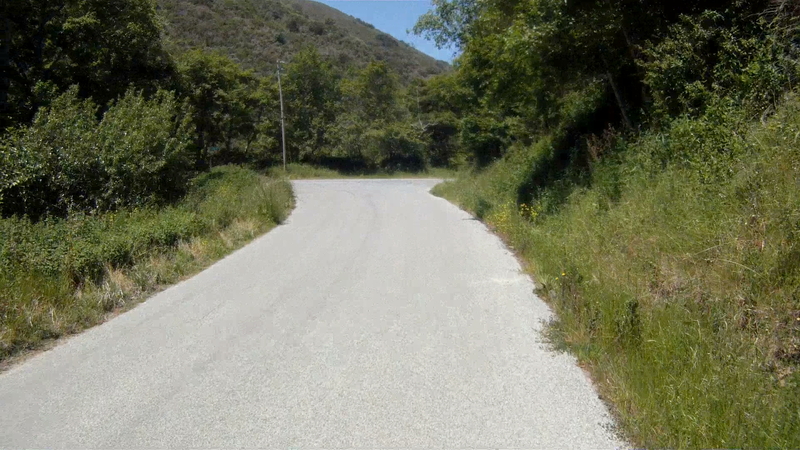 Riders for top teams like HTC-Highroad, Saxo-Bank and Garmin-Cervelo have their bikes professionally fit by the manufacturers (Specialized using BG Fit for the first two, Cervelo for the latter) for not only power, efficiency and injury prevention, but also for aerodynamics on the time trial bikes. 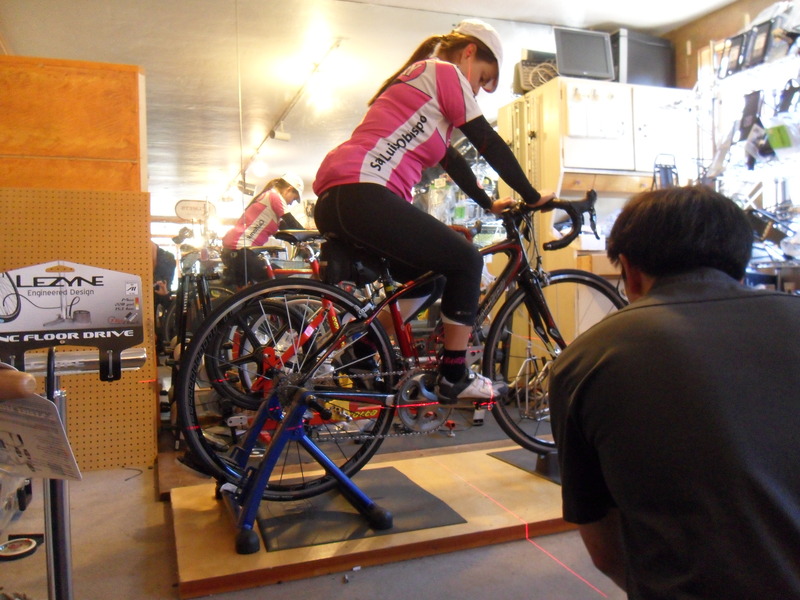 For those of us not-so-professional riders, the best person to fit your bike is someone trained in the science of bike fitting and skilled in the art. 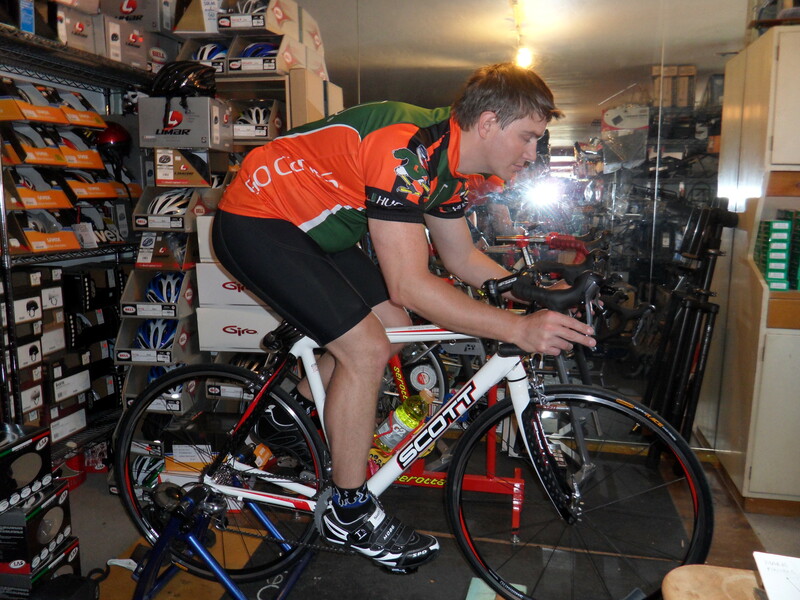 The many aspects of a true bike fitting include: type of bike (pure racer, endurance, touring or aero), frame size (including top tube length, seat tube height and stand over height), bar width, drop length, stem length, stem angle, bar angle, gear lever placement, type of seat, seat post height, seat position (fore and aft), foot position at mid-stroke and knee angle at the bottom of the peddle stroke. 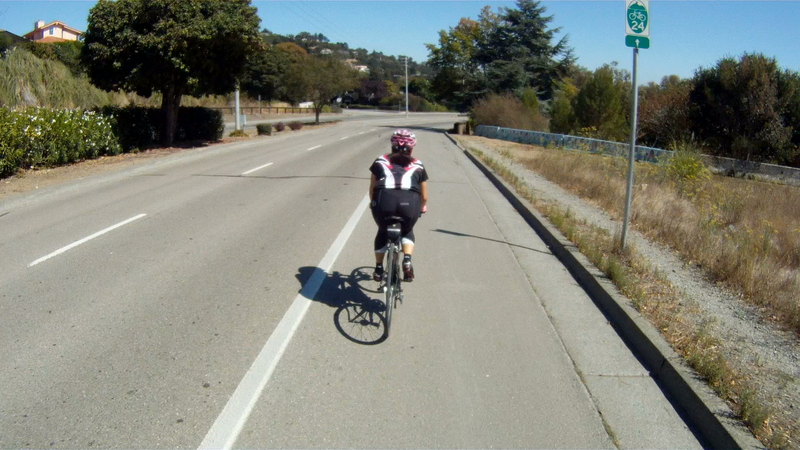 A skilled bike fitter can make all of these angles and interactions not only work for you, but make each peddle stroke more efficient, more powerful and more comfortable for the rider. 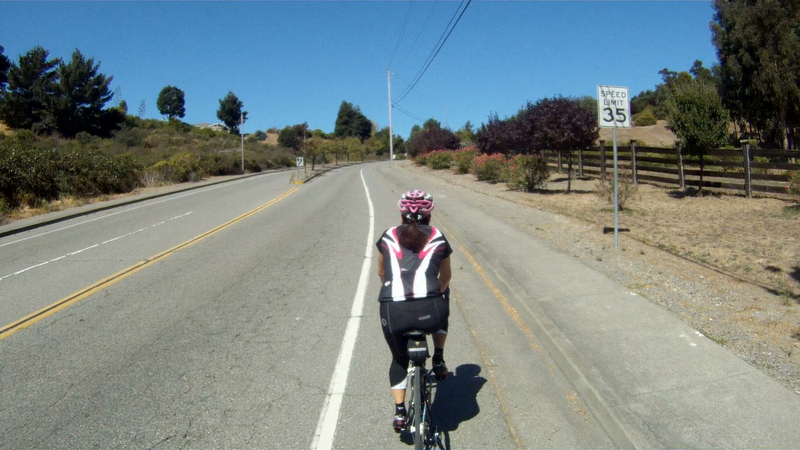 When you get your first road bike, you may be uncomfortable with the typical 45 degree angle position, especially if you just transitioned from a hybrid or mountain bike. 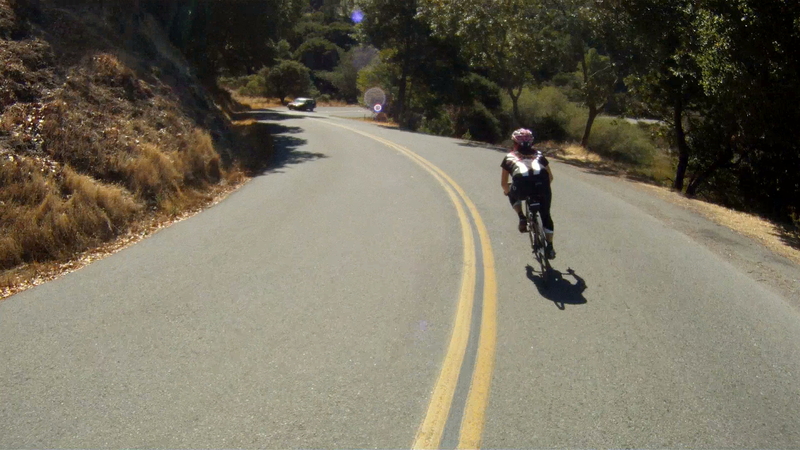 So the fit of your bike can change depending on your comfort level with a road bike and your skill level. 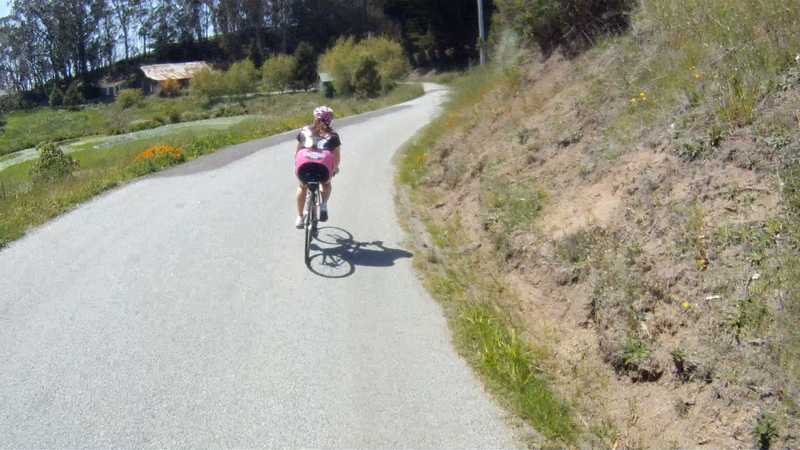 You will notice changes in the seat post height or stem length immediately after they are changed. 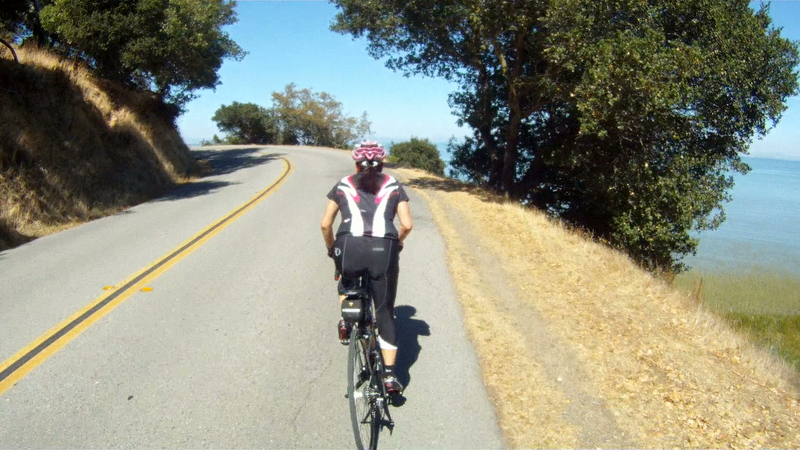 But as you progress in your riding you will appreciate the subtle changes like fore and aft positioning of the seat and handle bar angle just as much. 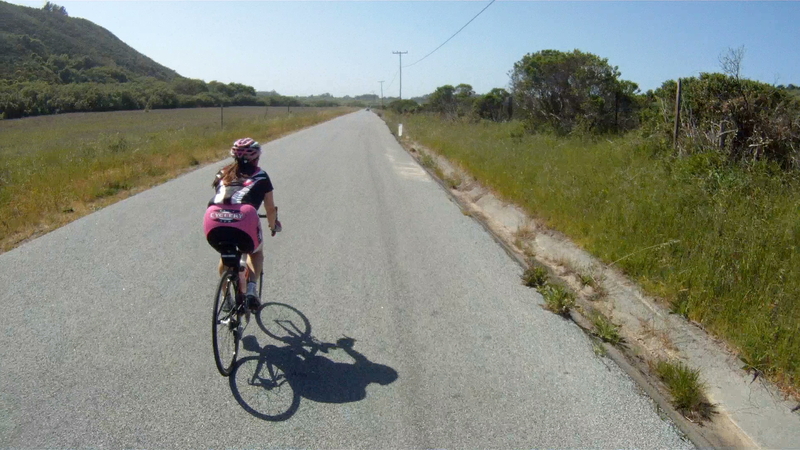 Both of us have had our bikes since we began road biking just over a year ago. 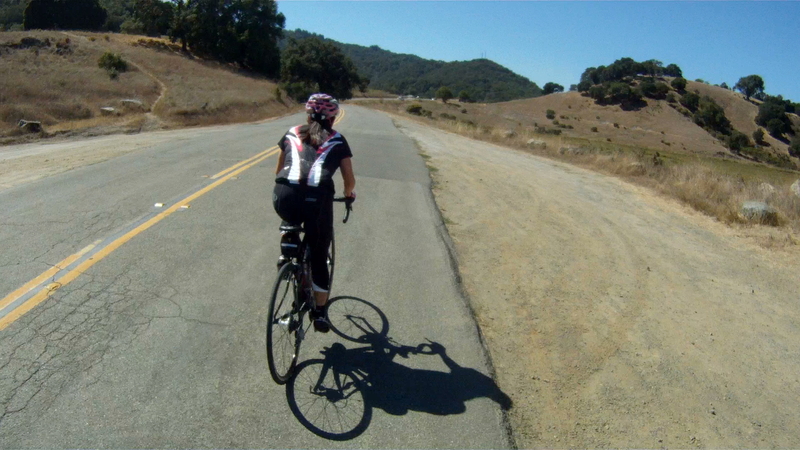 Miko’s initial bike fitting was designed to make her comfortable in her transition from a hybrid to a road bike. 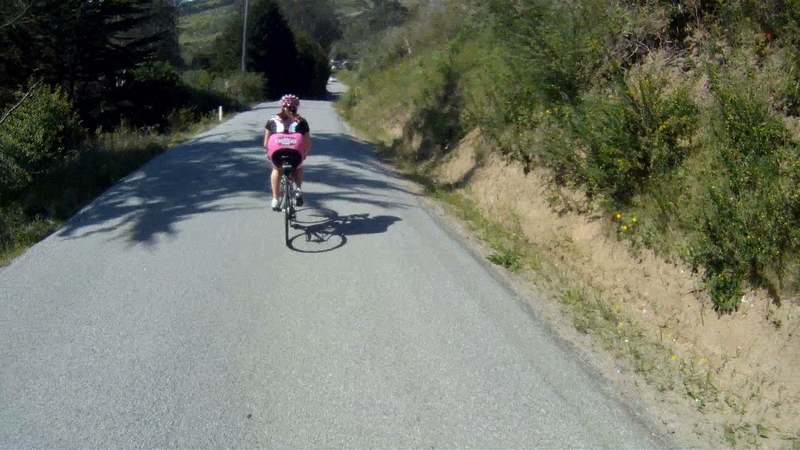 Her seat post was a bit lower, her stem was angled up and the seat was closer to the stem. 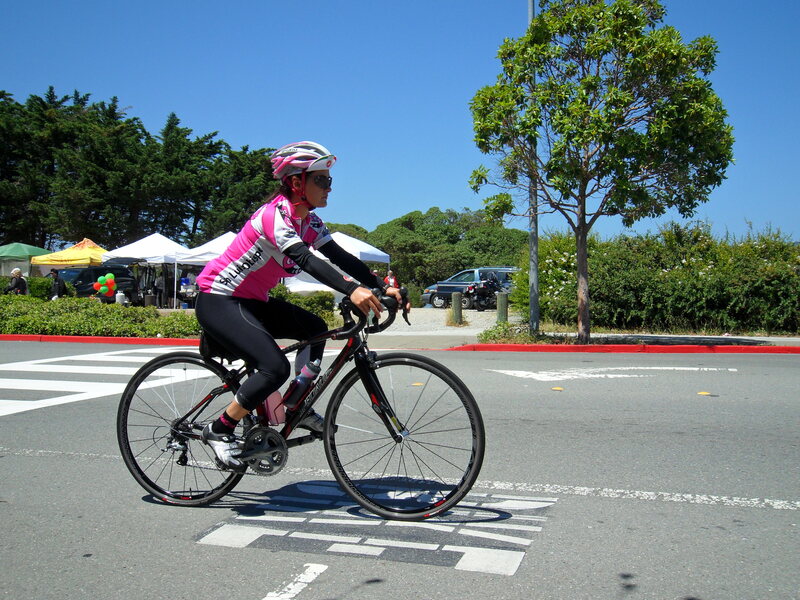 The design of her endurance road bike allowed it to take on the hybridesq fitting, while still giving her the road bike experience. 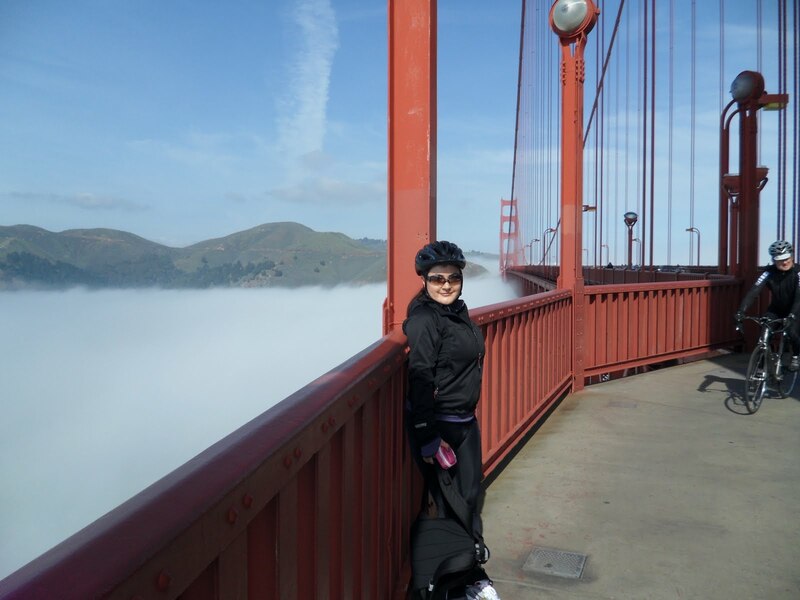 This was the right fit for her at the time. 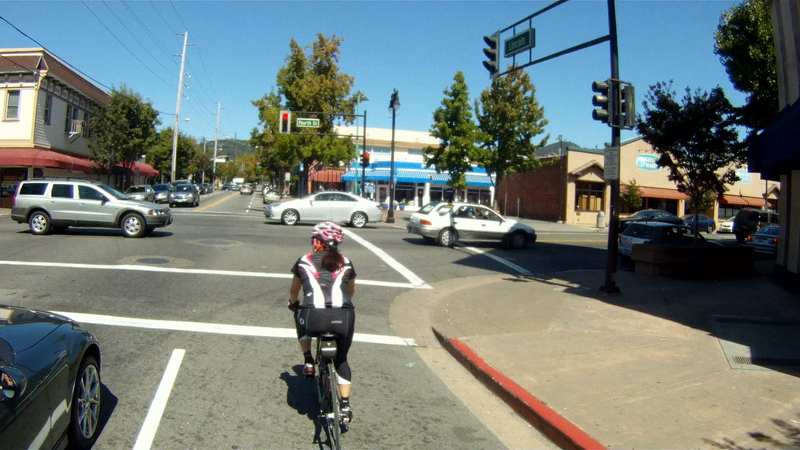 After over a year of riding and minor adjustments to her seat height, Miko was ready for an updated fitting. 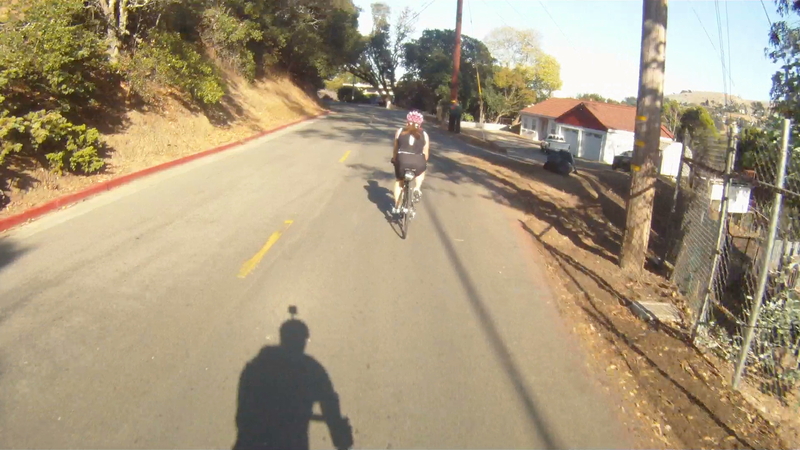 We took Ruby into A Bicycle Odyssey to have Tony perform an updated fitting. 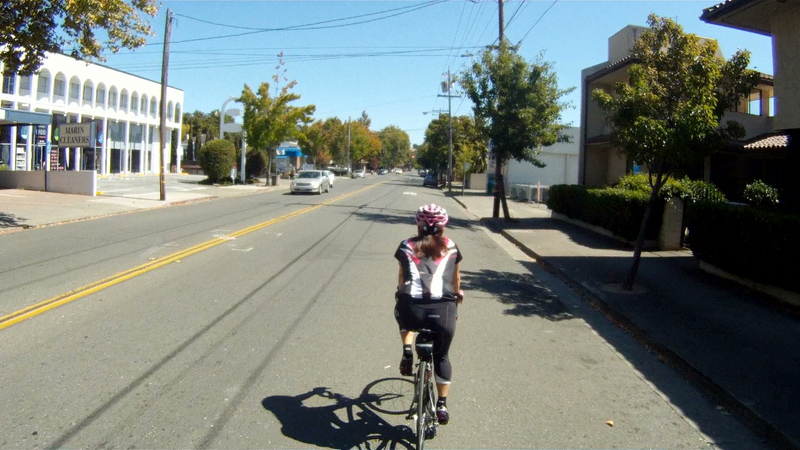 He took her measurements on the bike and checked the handlebar width. 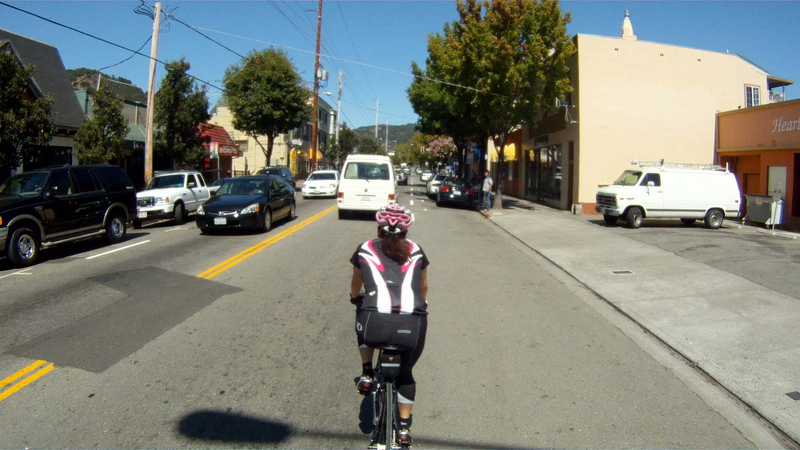 He started with adjustments to the seat post height, flipped the stem changing it from an upward angle to almost flat, ensured her handle bars and hoods were positioned such that her back made a 45 degree angle with her bike in the hoods and her elbows slightly bent, while ensuring he back was almost flat in the drops. 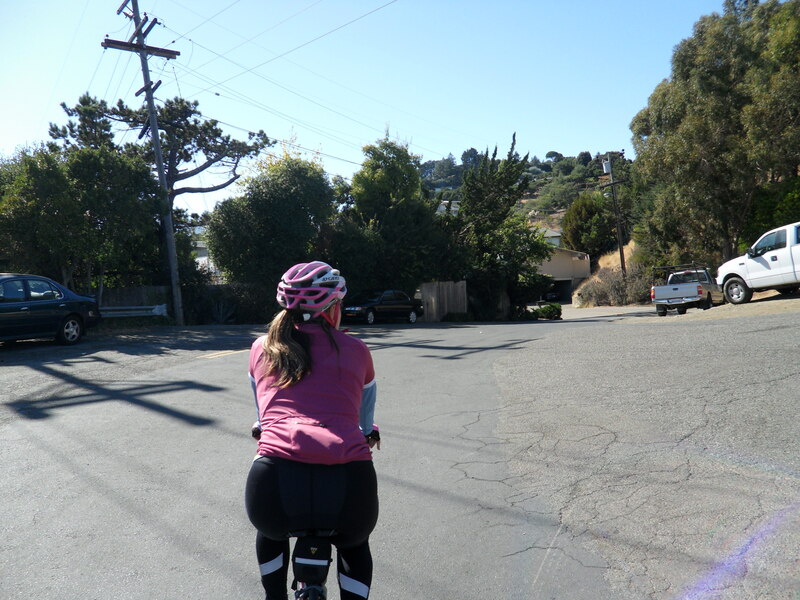 The positioning change made the saddle uncomfortable, so after trying a few different saddles, a new one that matched her positioned was installed. 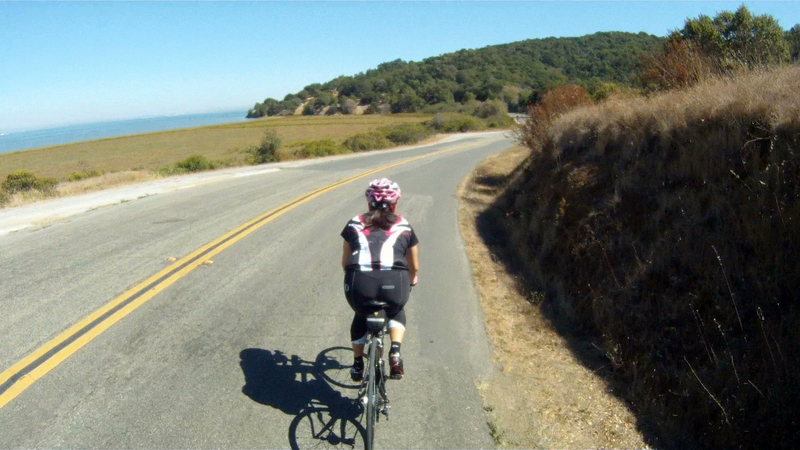 The seat position from the stem was adjusted to reduce chafing in this new position. 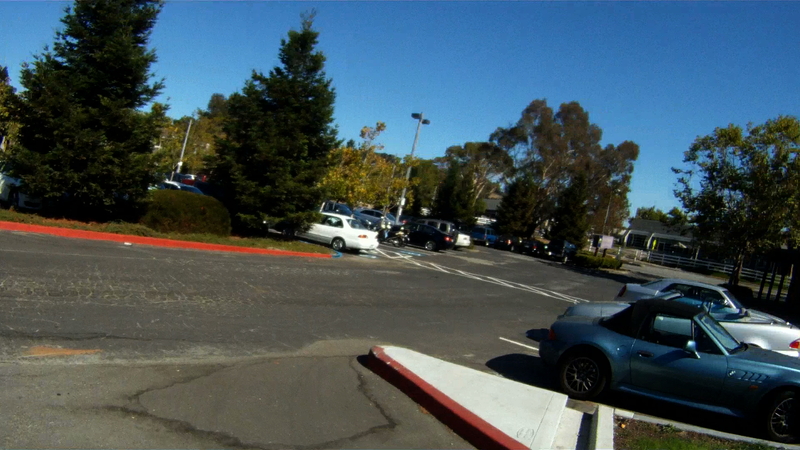 Finally, all of the angles were one again checked to ensure maximum efficiency. 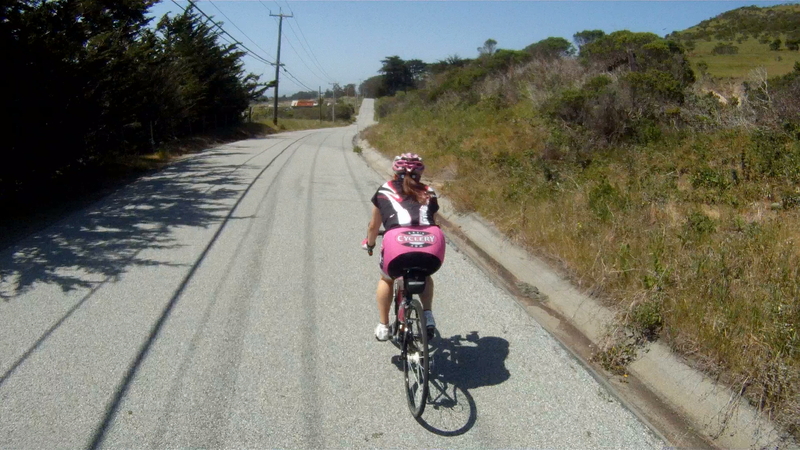 During the first ride she commented she felt she owned a new bicycle. 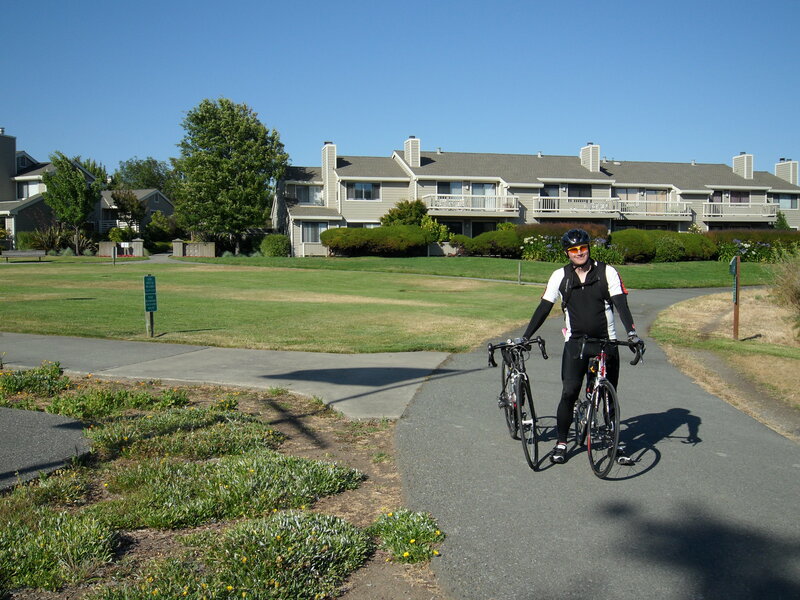 Jon purchased his first road bike from A Bicycle Odyssey. 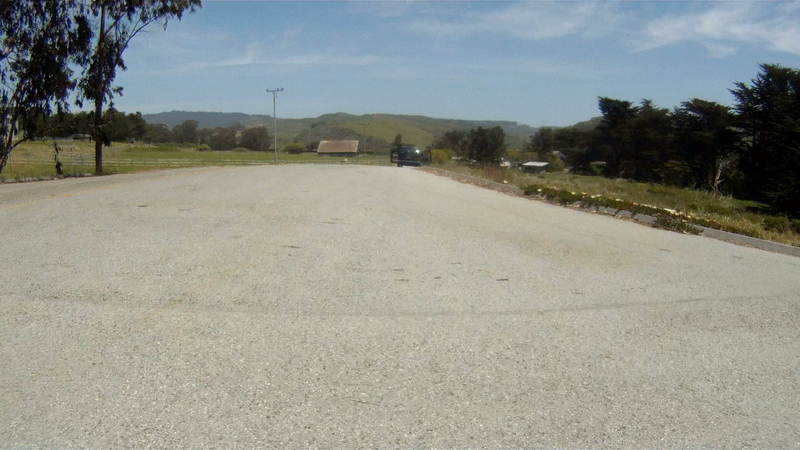 Part of the purchase price includes a fit by Tony. 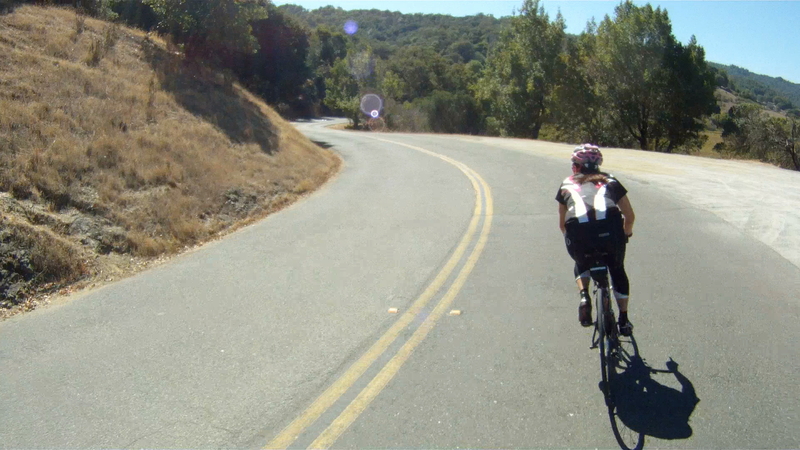 Transitioning directly from a hybrid bike is a huge change in position, control and speed. 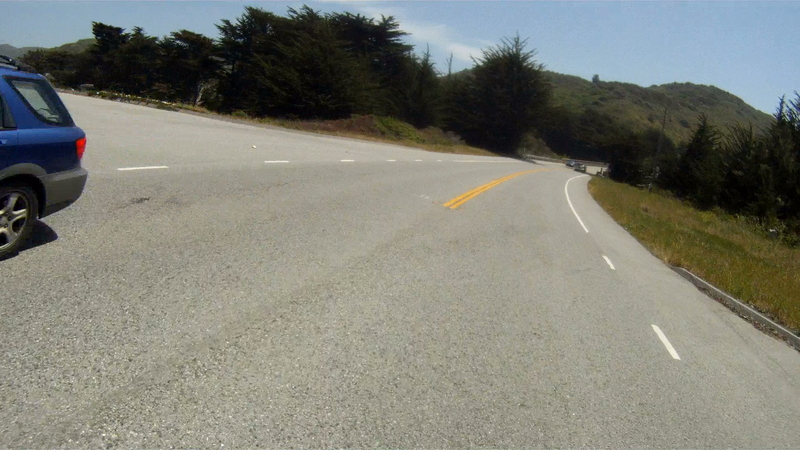 On his test ride, the bike felt like a great fit, except for the reach, which was a bit long. 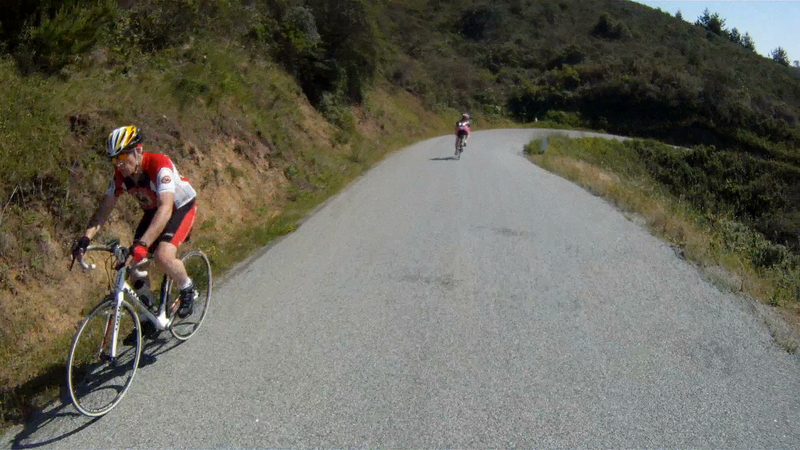 During Jon’s fit, Tony swapped the stem with one 10mm shorter. 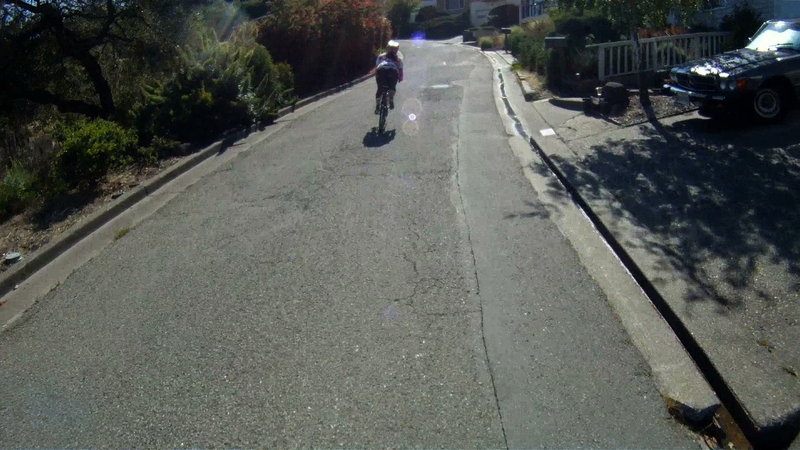 He then continued with a full fitting of the bike as described above. 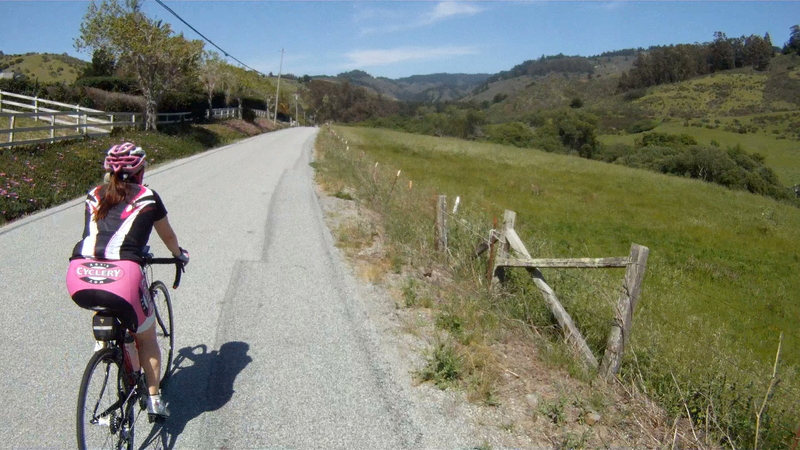 The Result: an amazing and efficient ride that allows Jon to ride long distances without pain, or go for short, hard rides without his back and knees paying the price the next day. 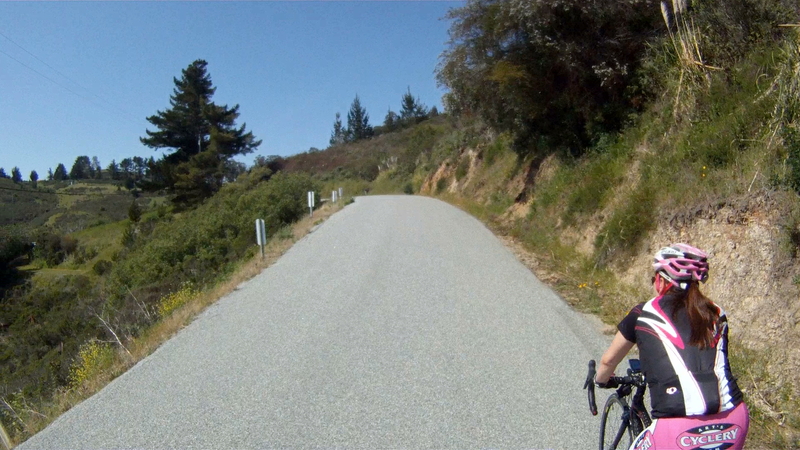 When Jon got his second road bike, he made sure to also have a fit done. 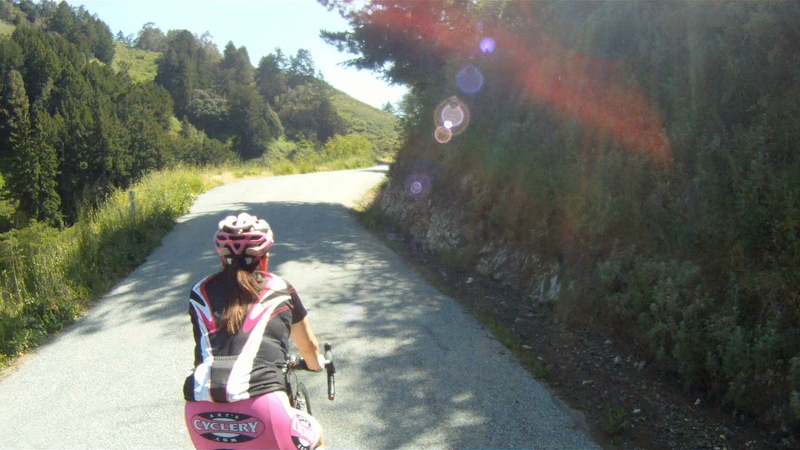 Whether you are a beginner or an experienced cyclist, a good fitting can help you improve your cycling, help reduce pain you experience while cycling and make riding a more enjoyable experience.